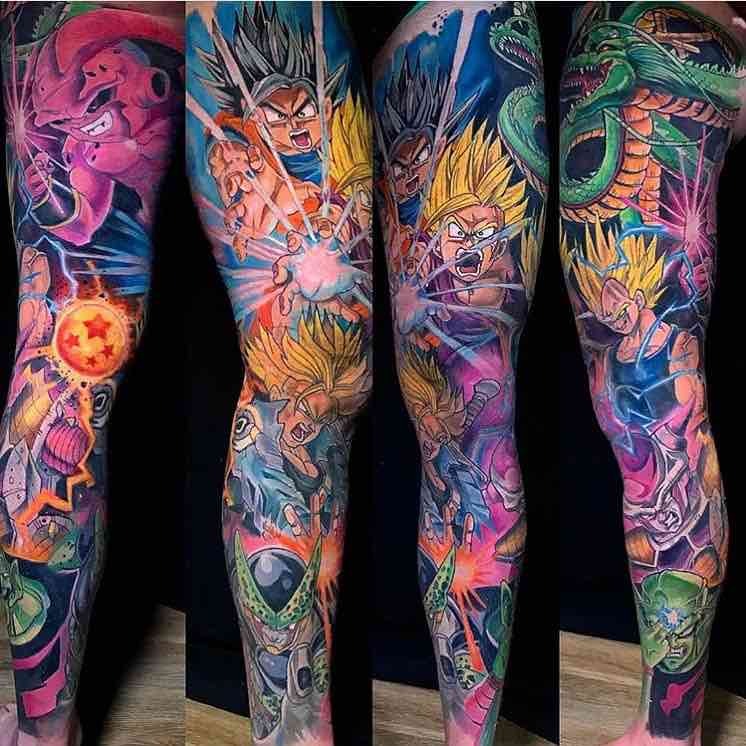 Dragon Ball Z, started off as a comic book then turned into its own tv show and is still being made today. 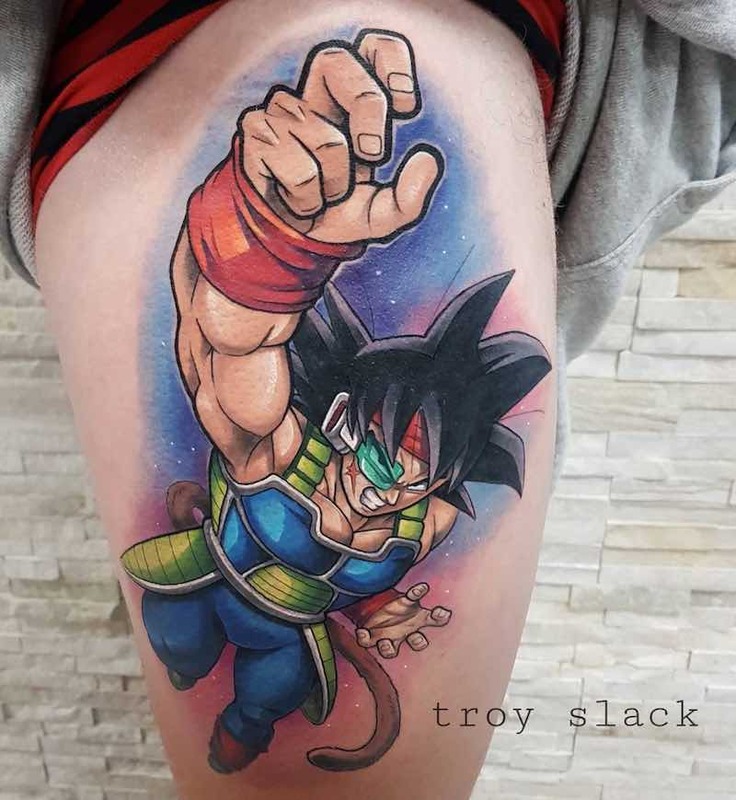 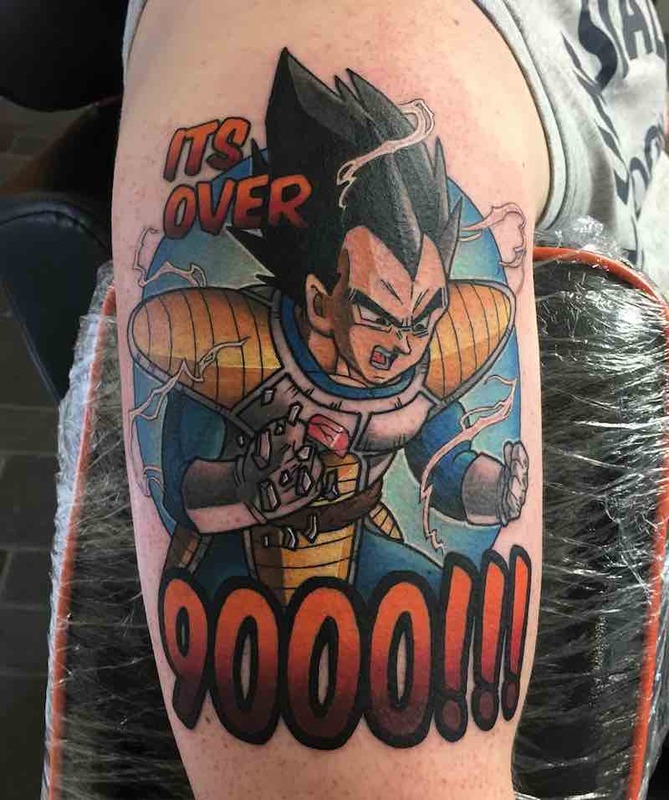 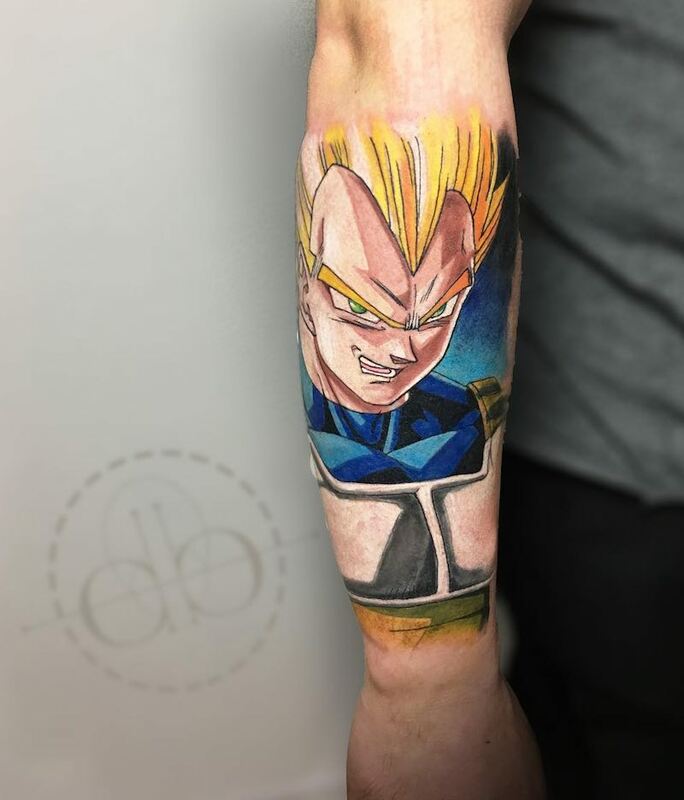 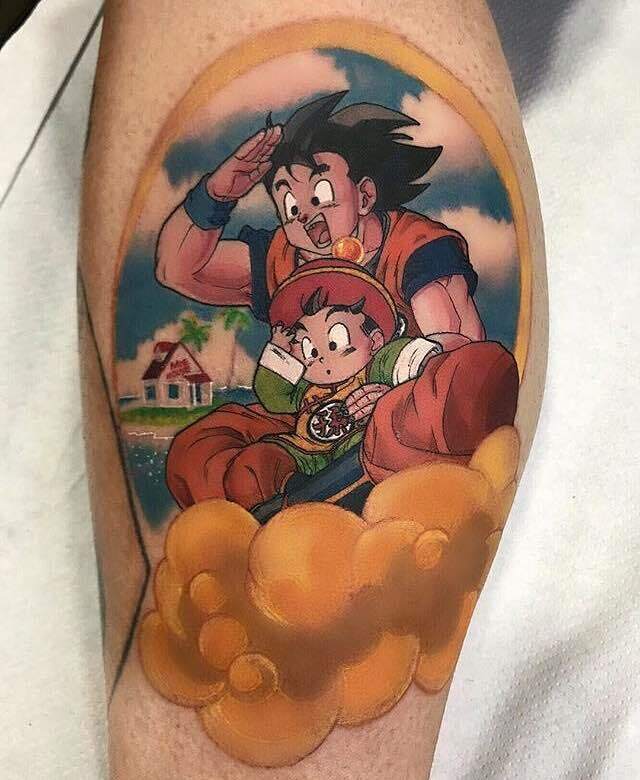 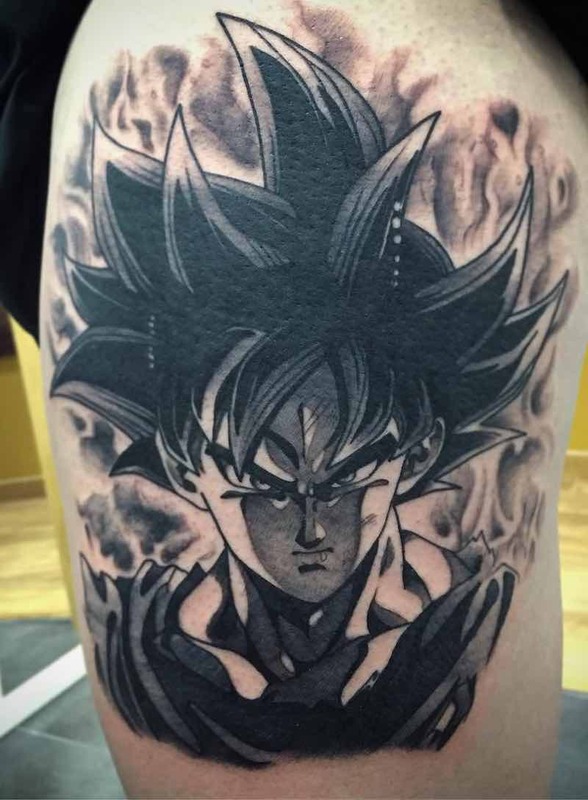 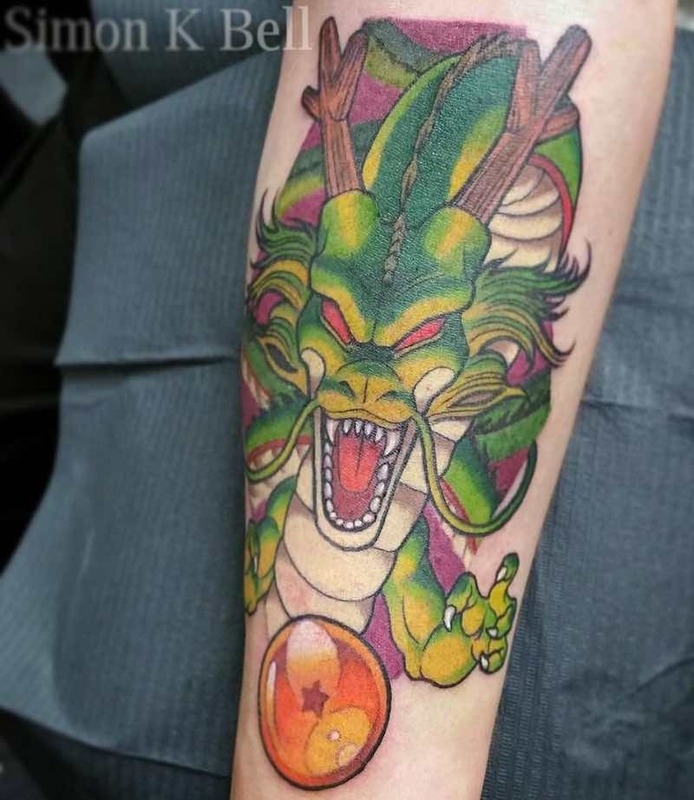 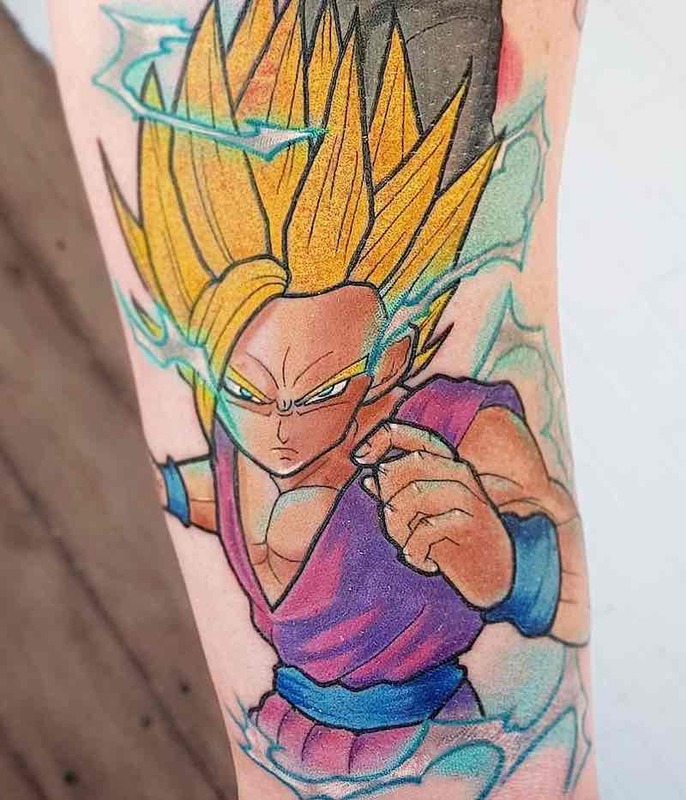 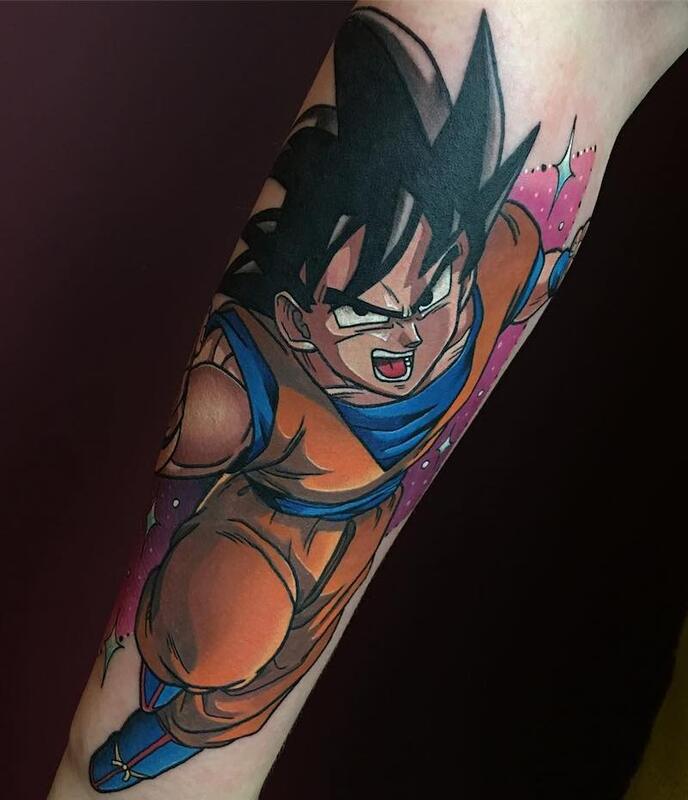 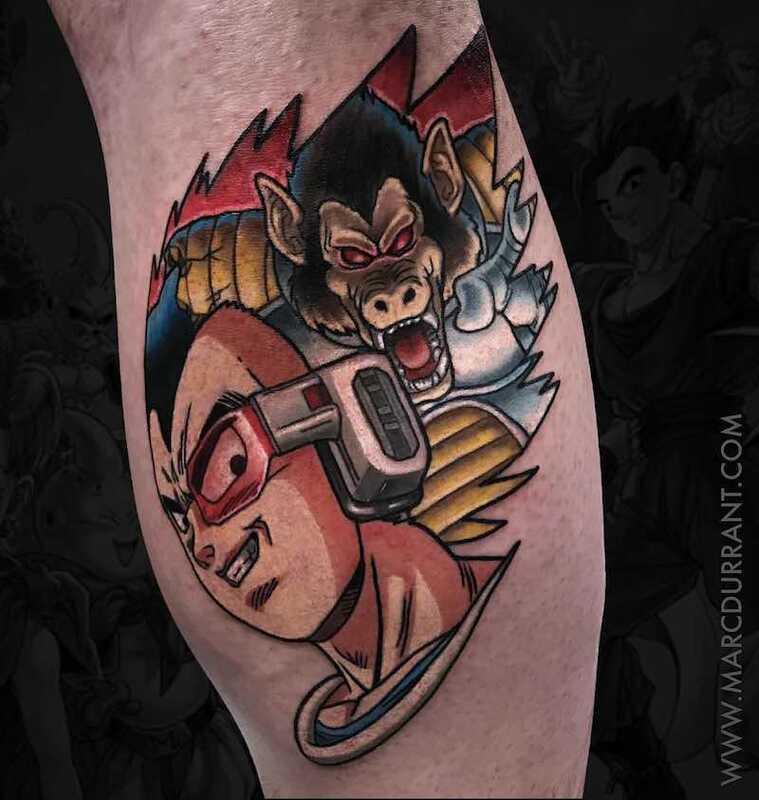 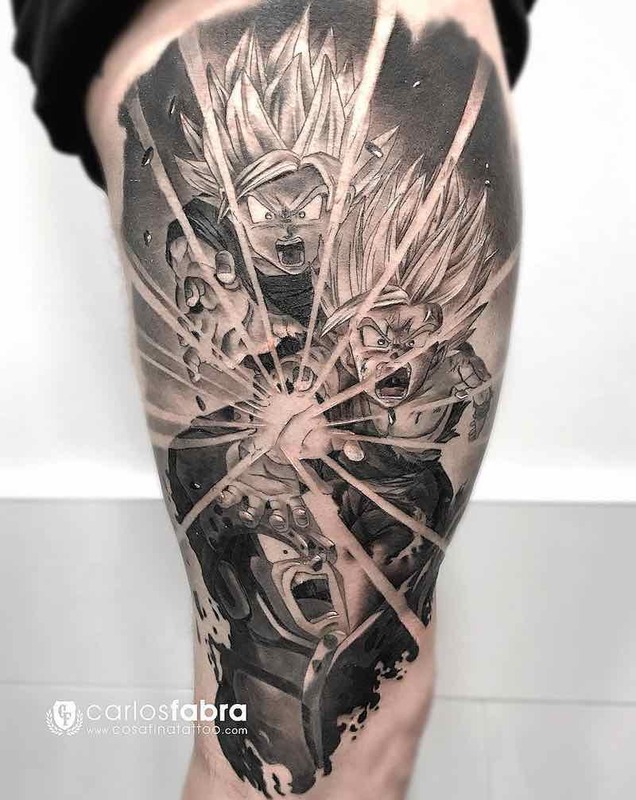 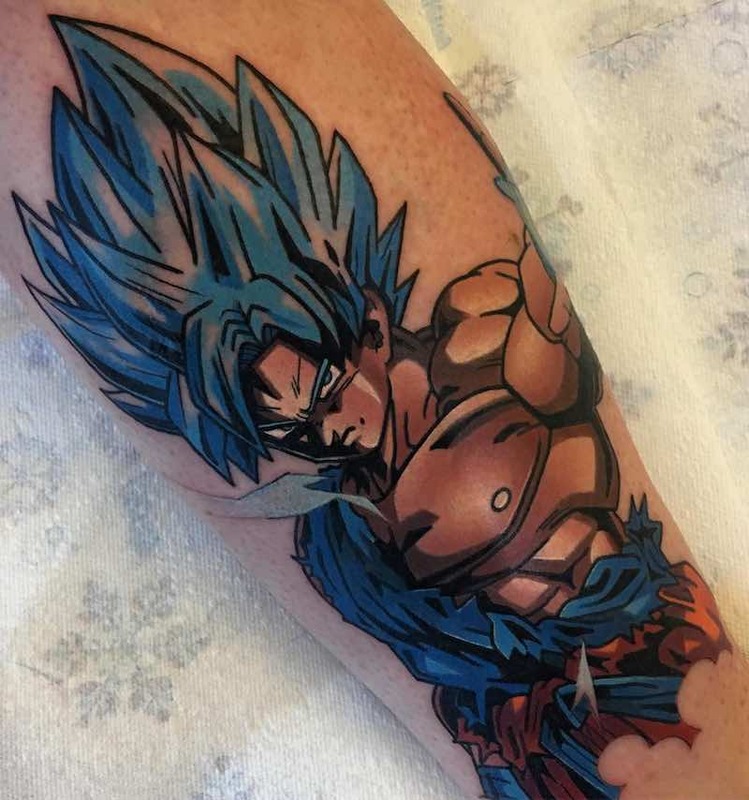 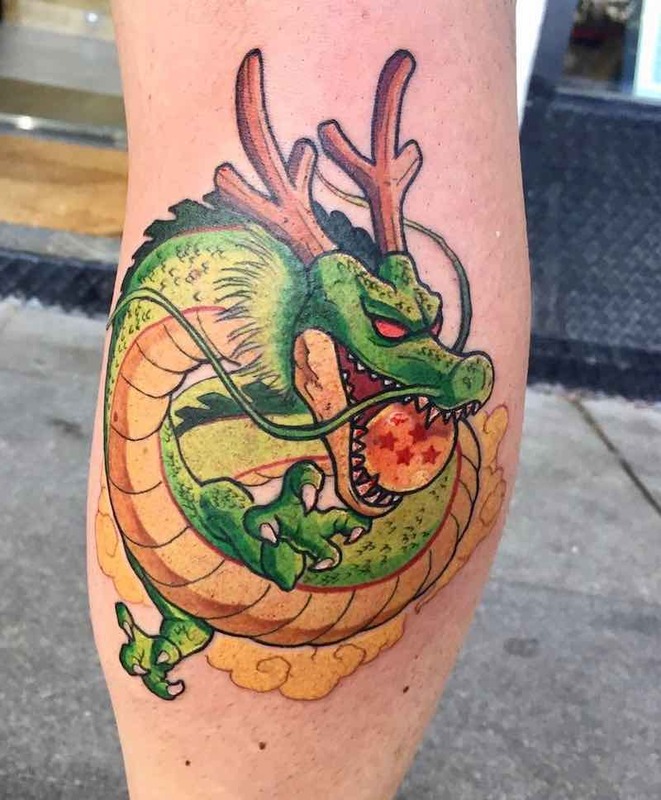 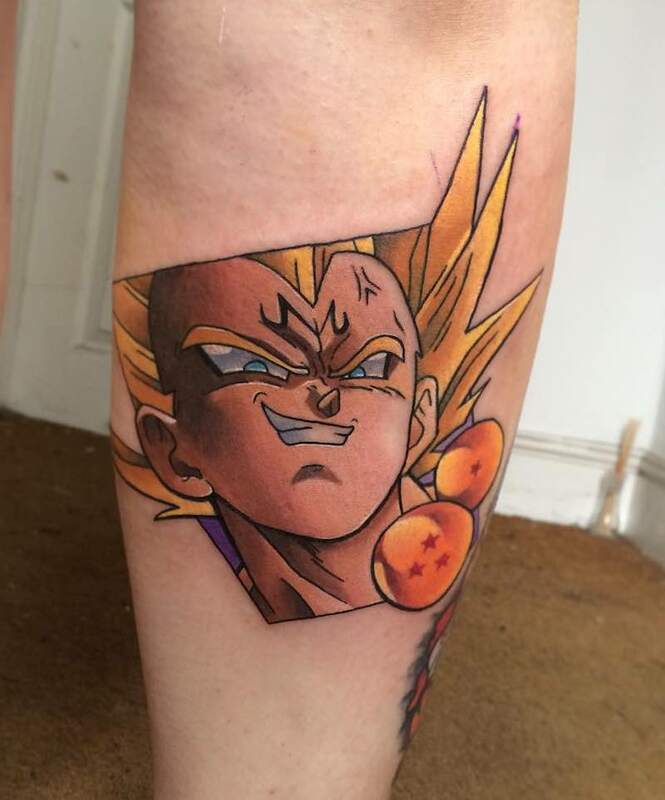 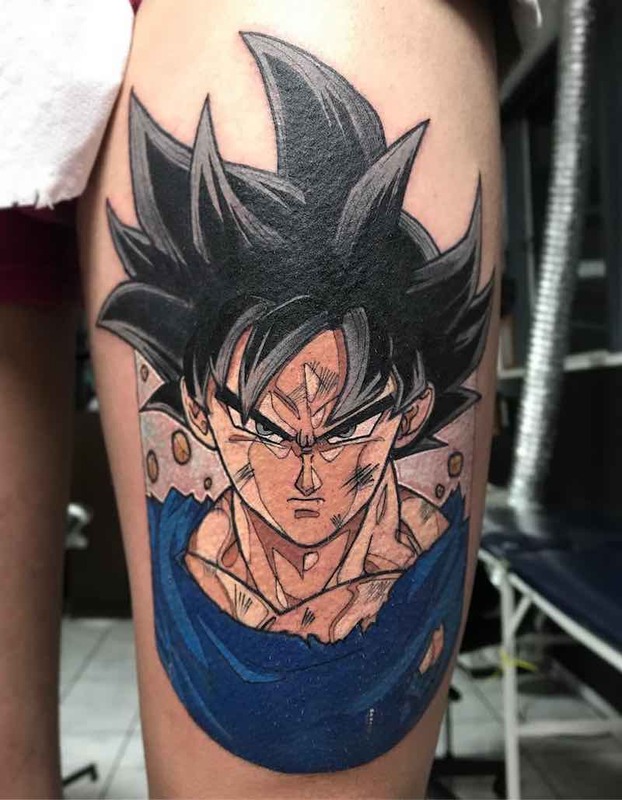 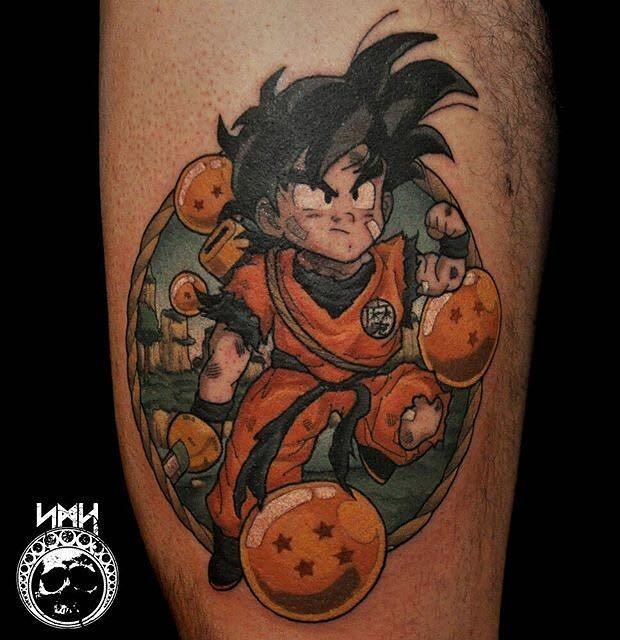 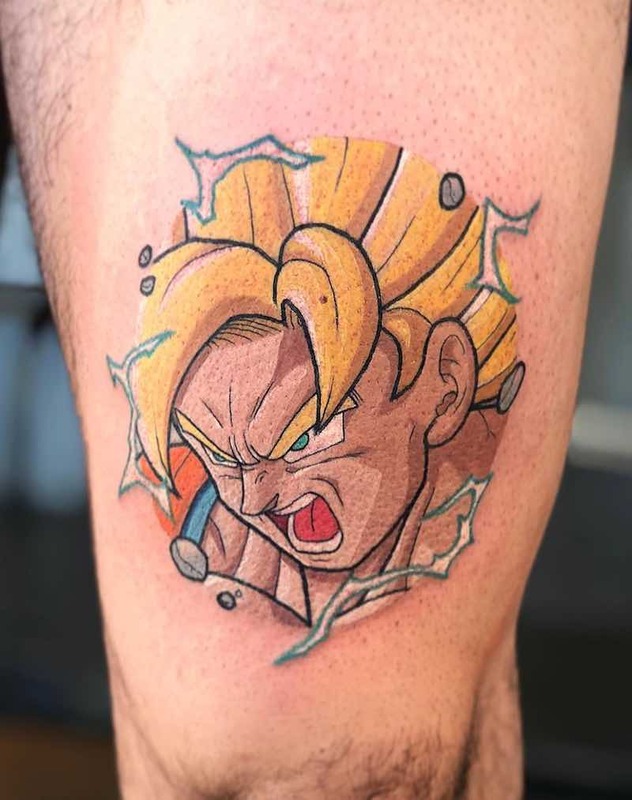 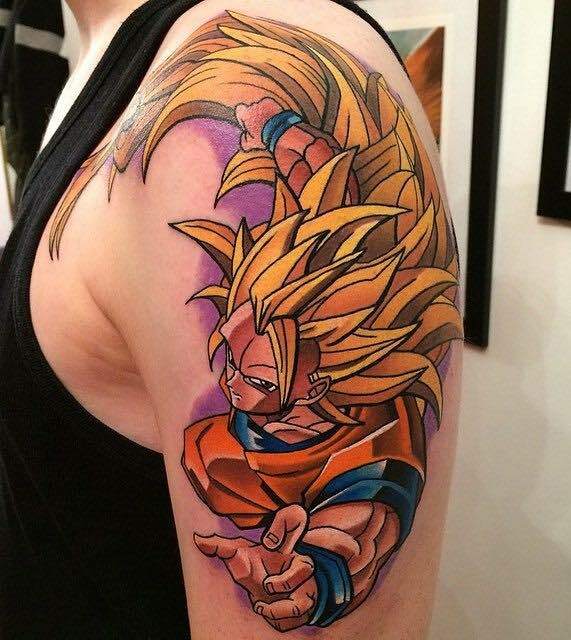 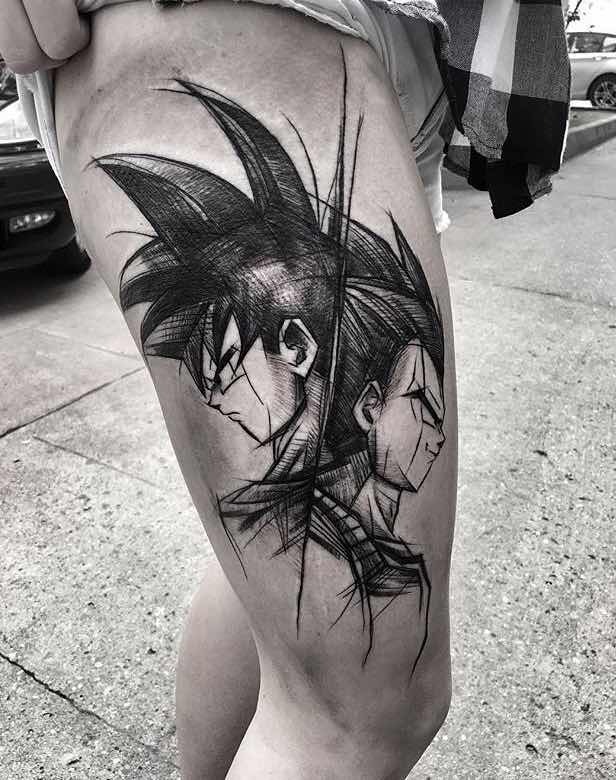 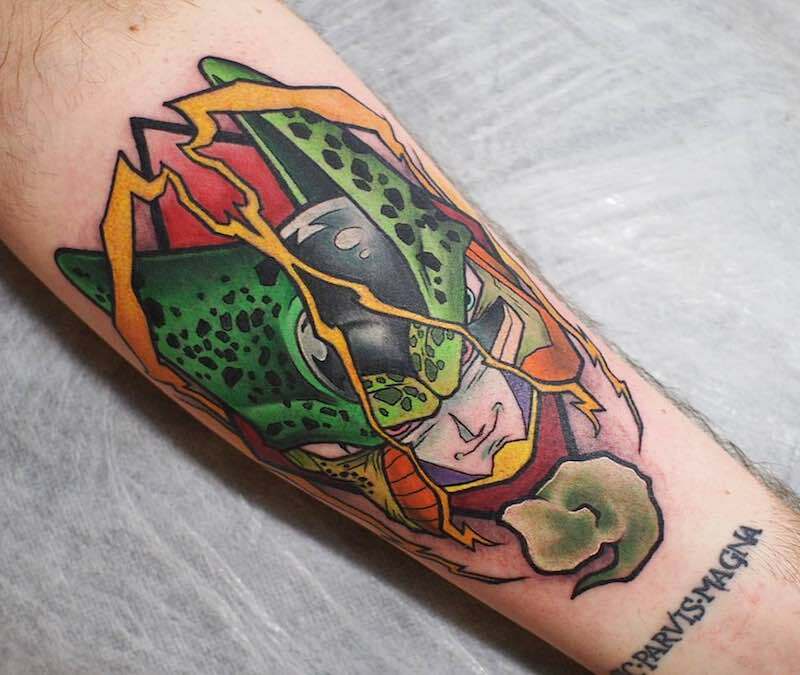 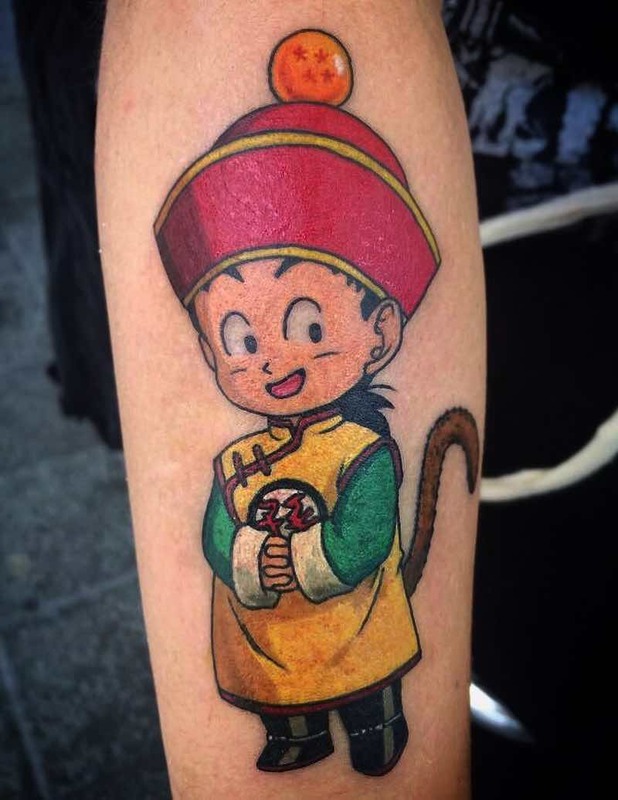 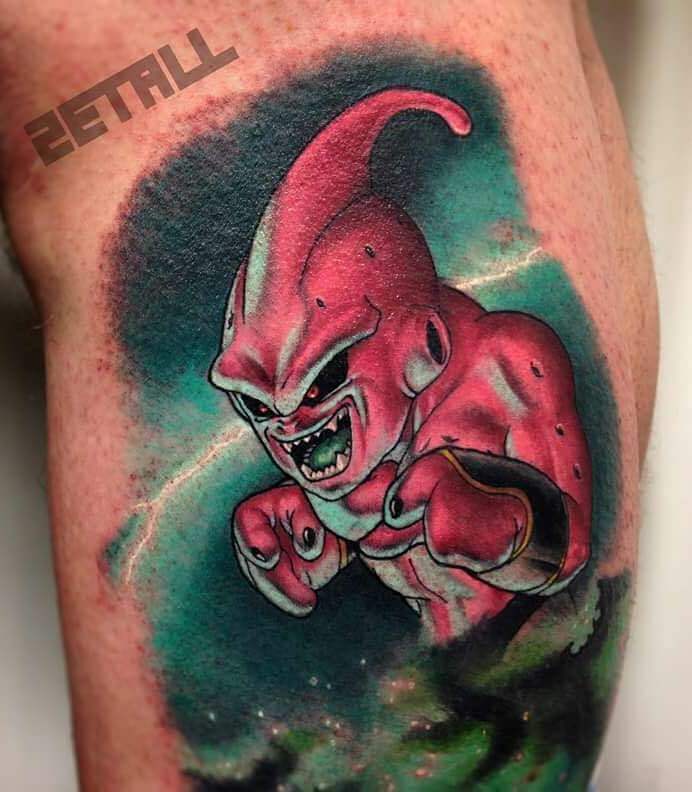 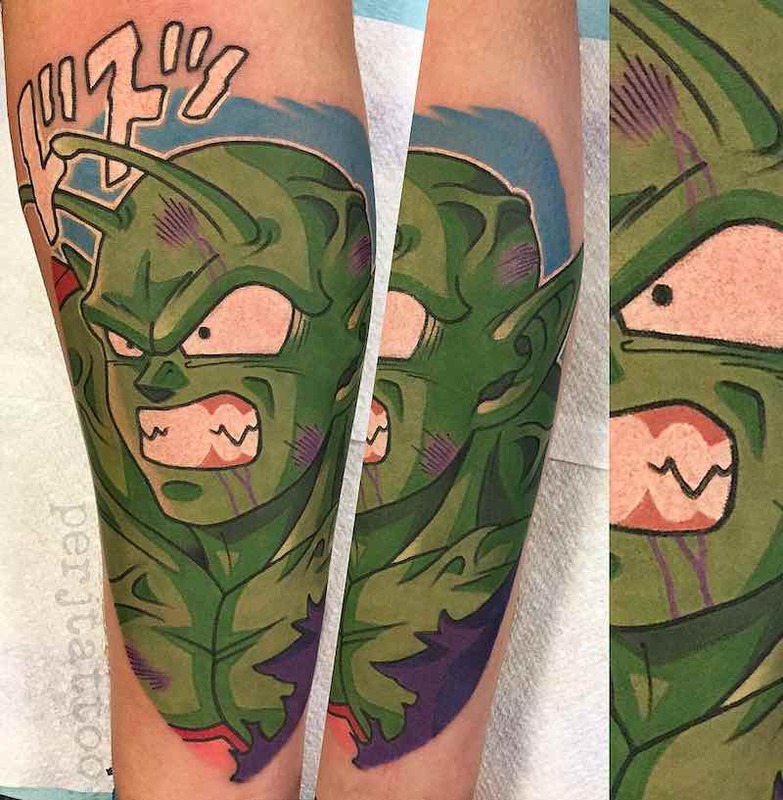 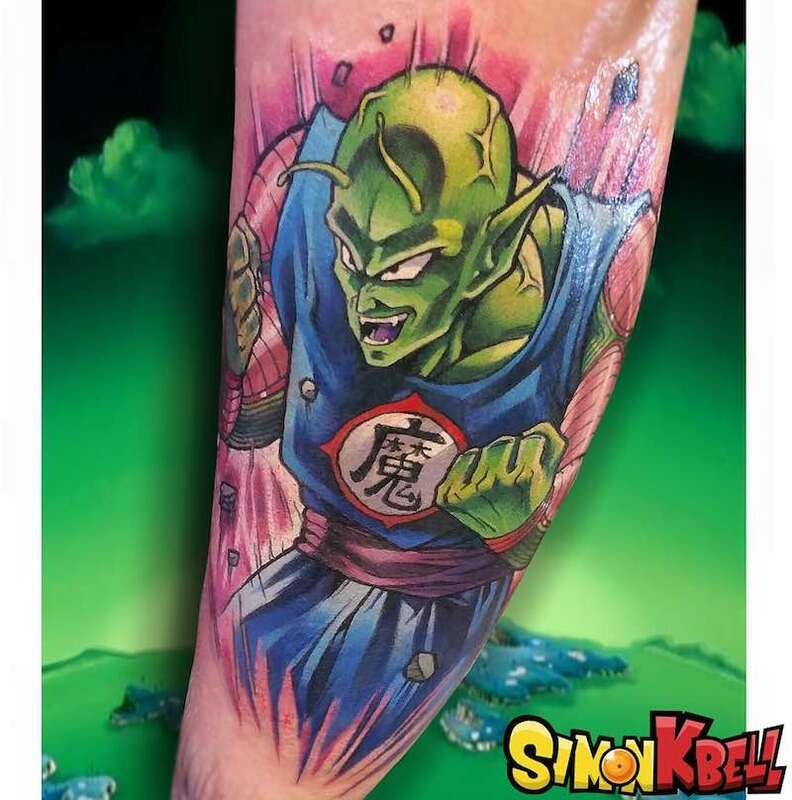 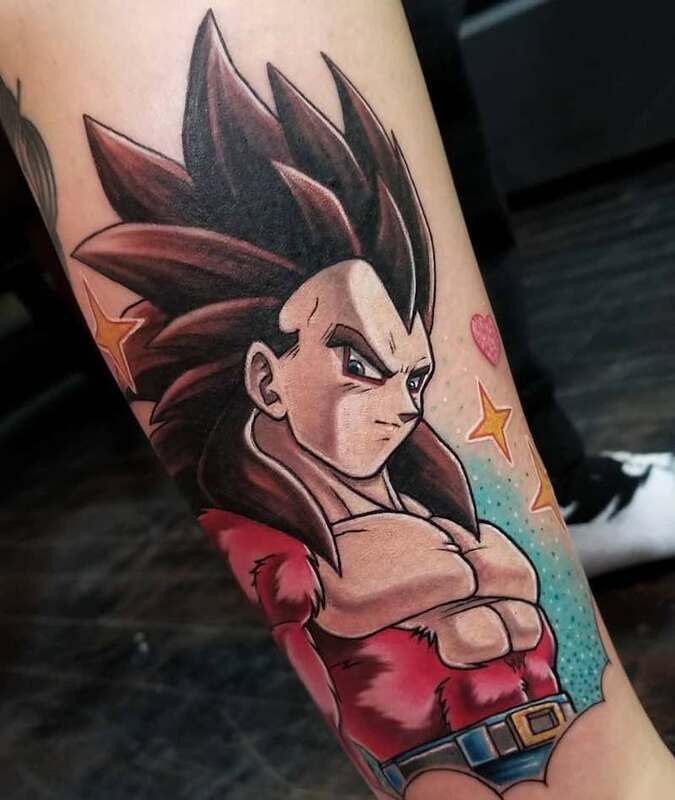 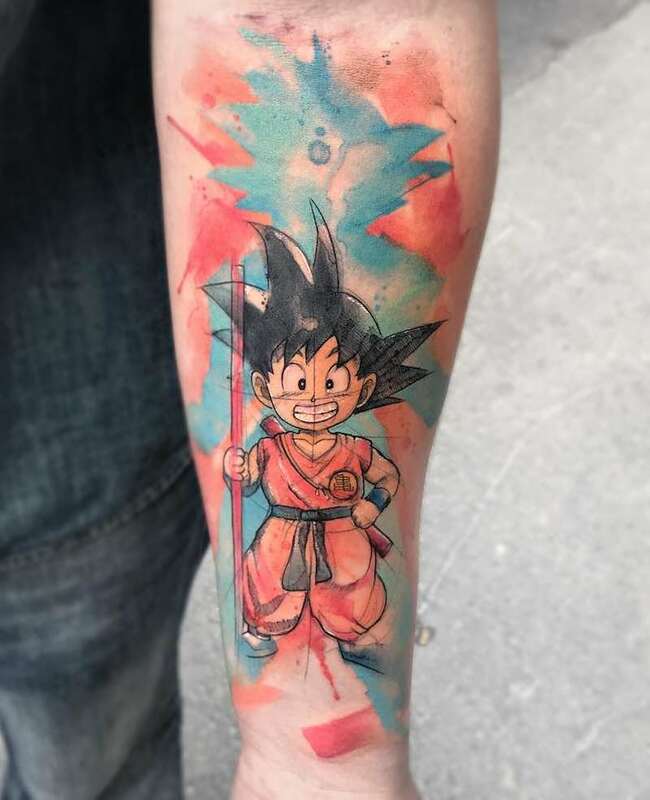 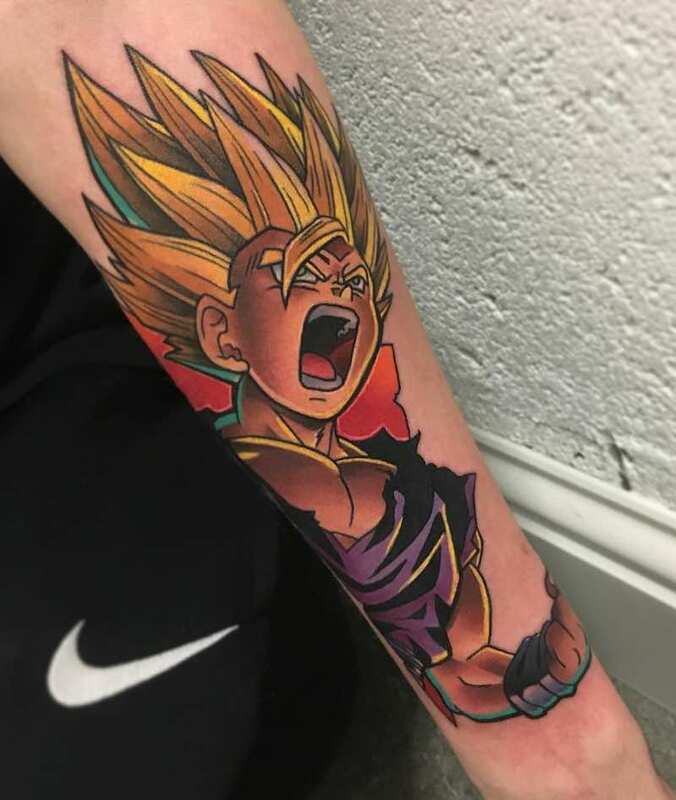 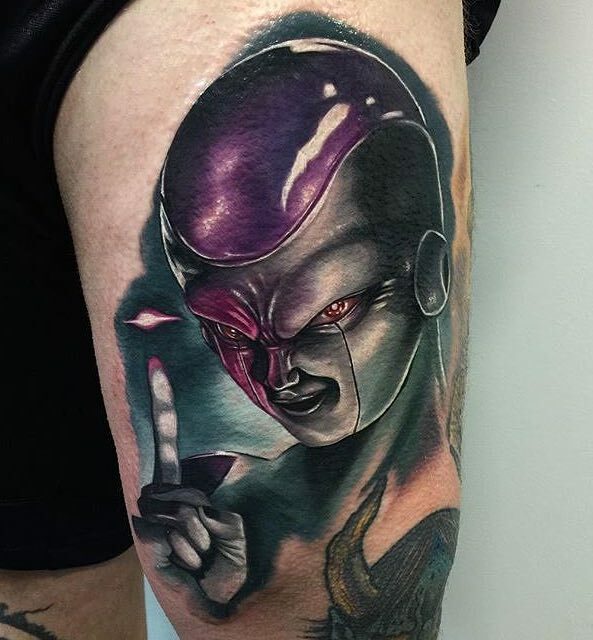 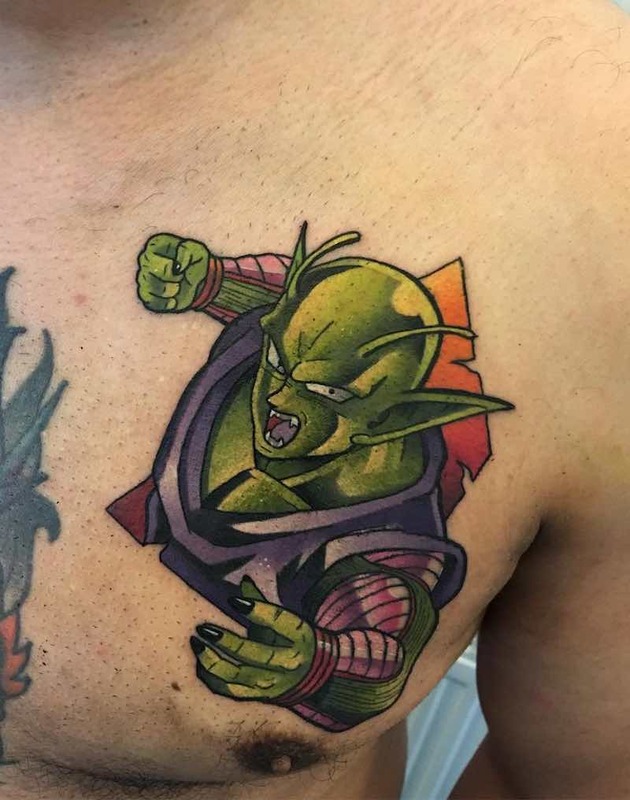 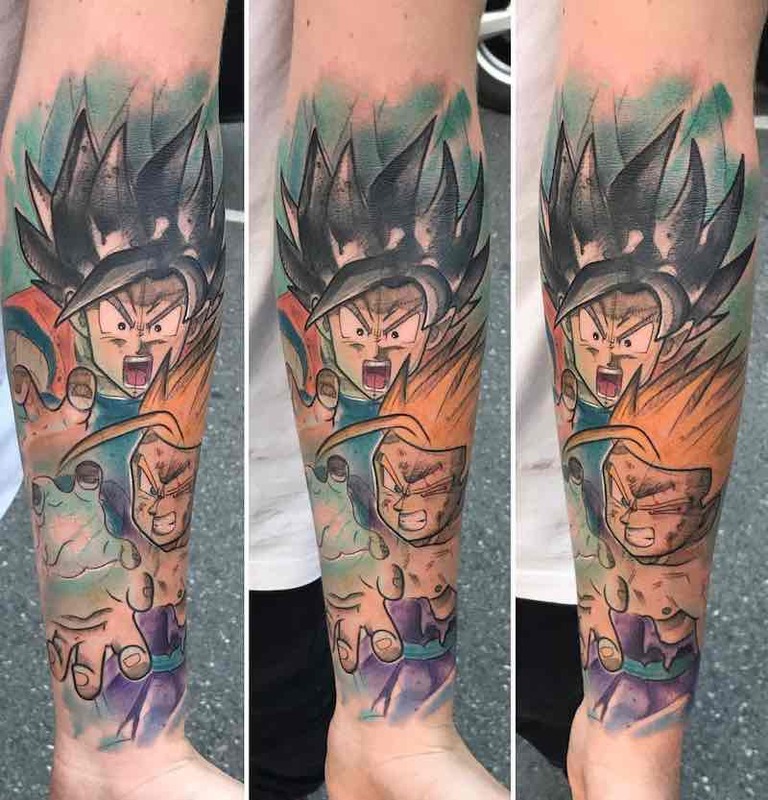 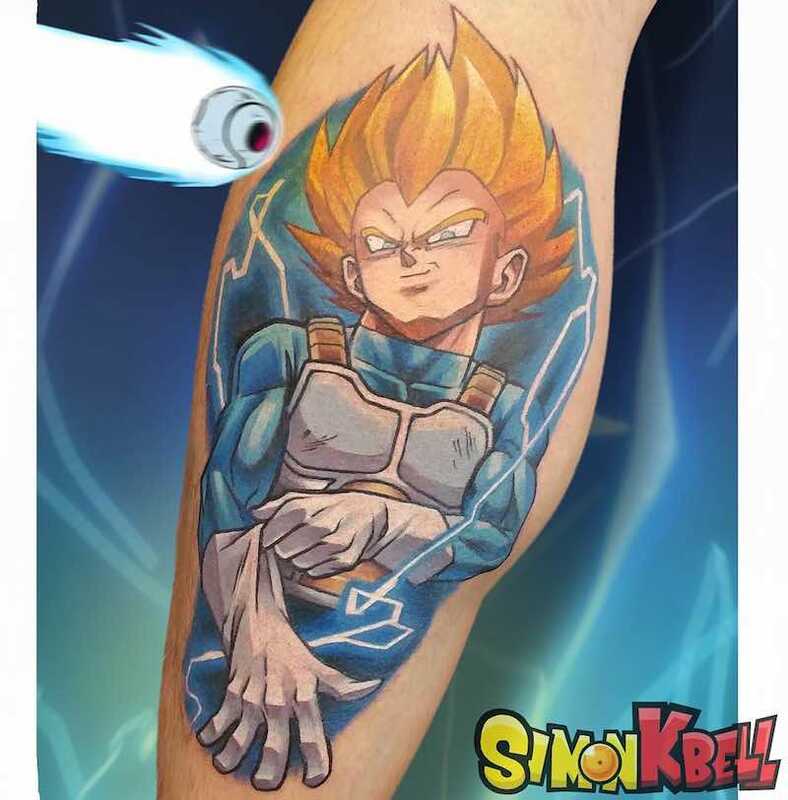 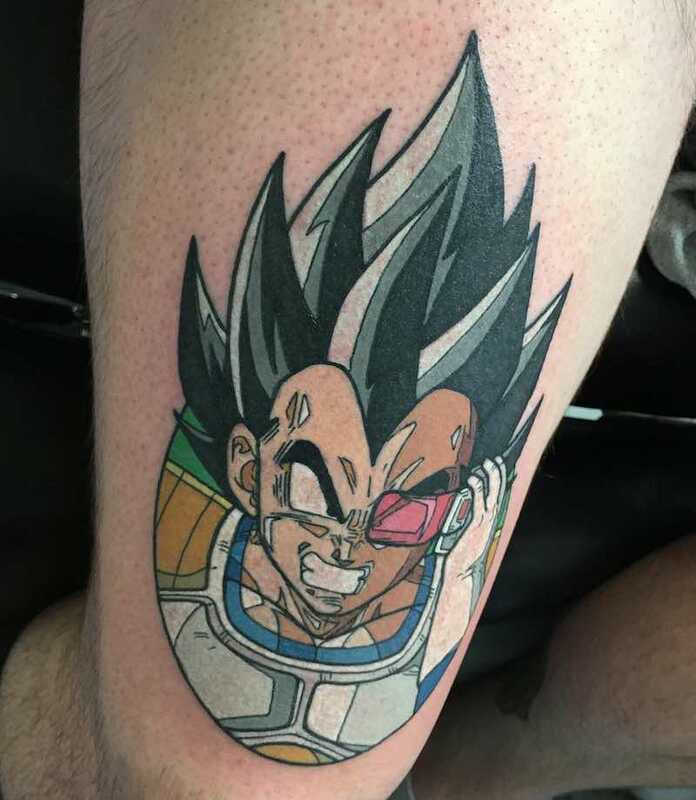 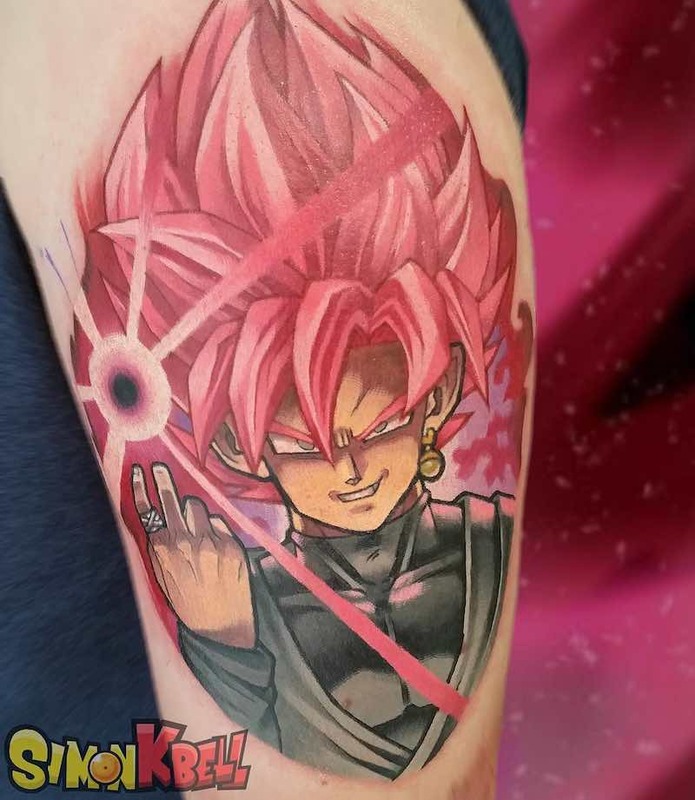 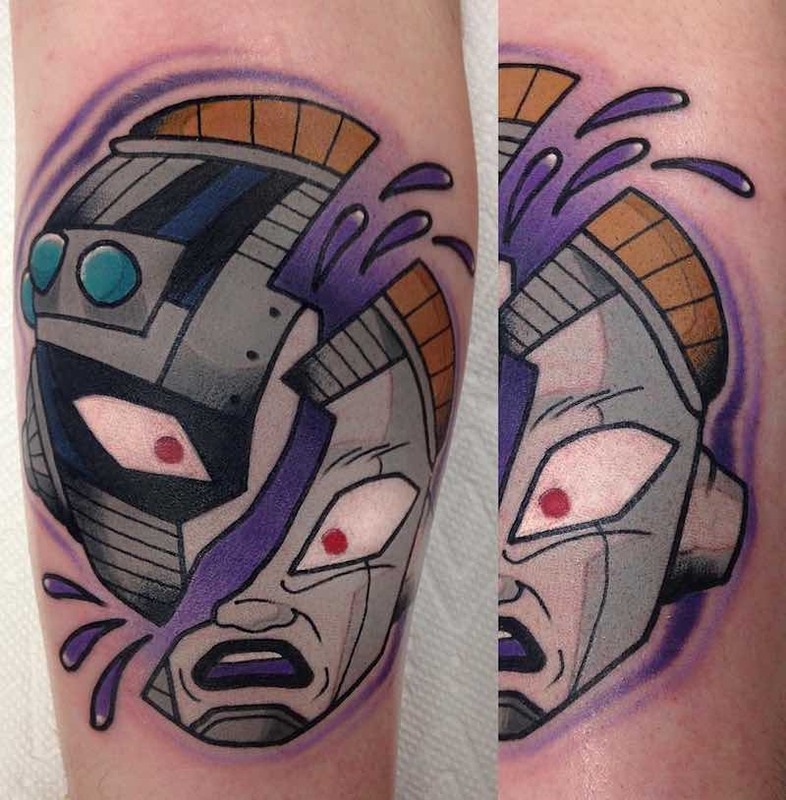 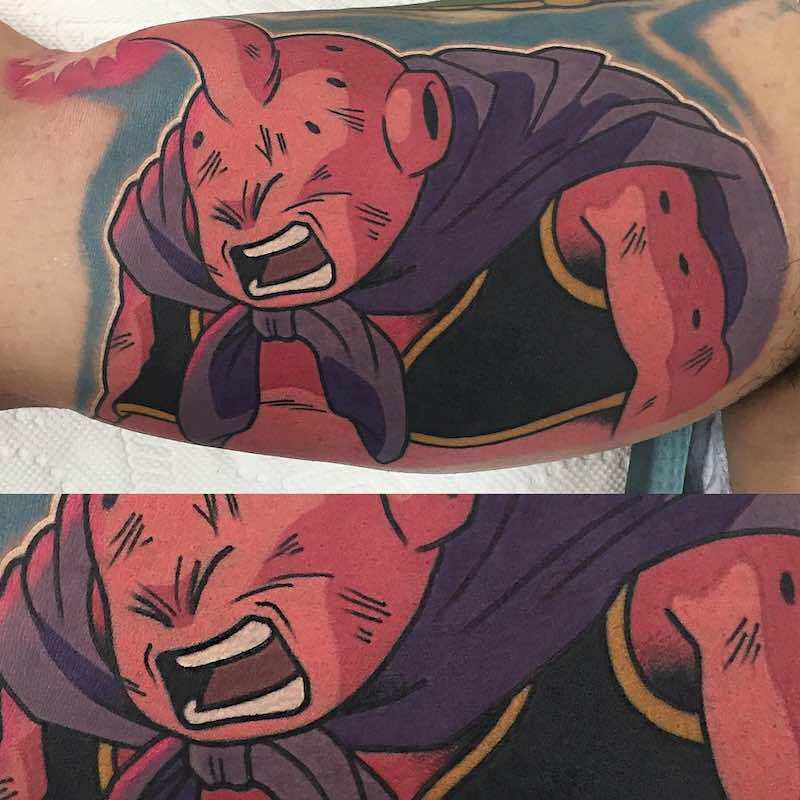 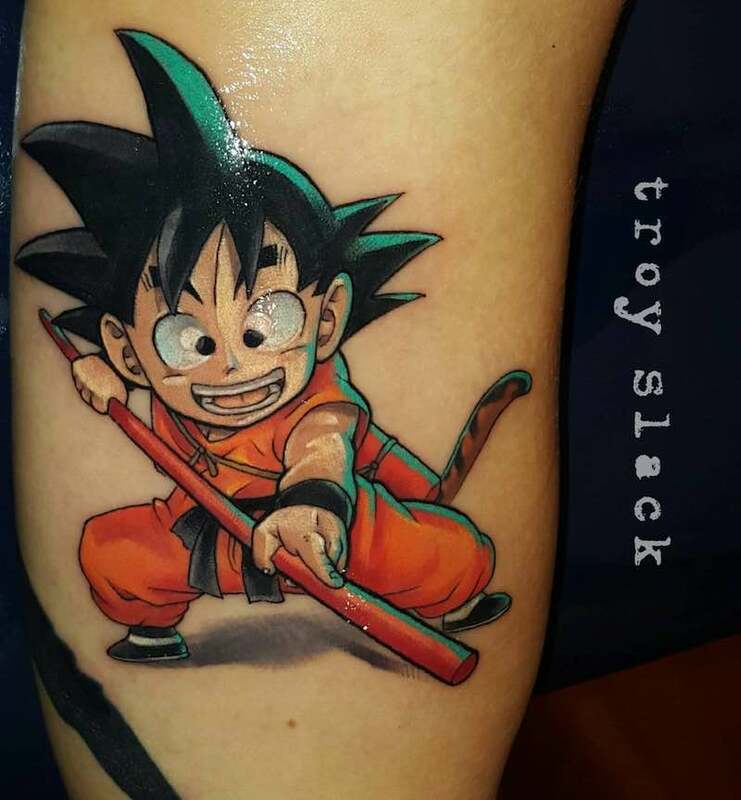 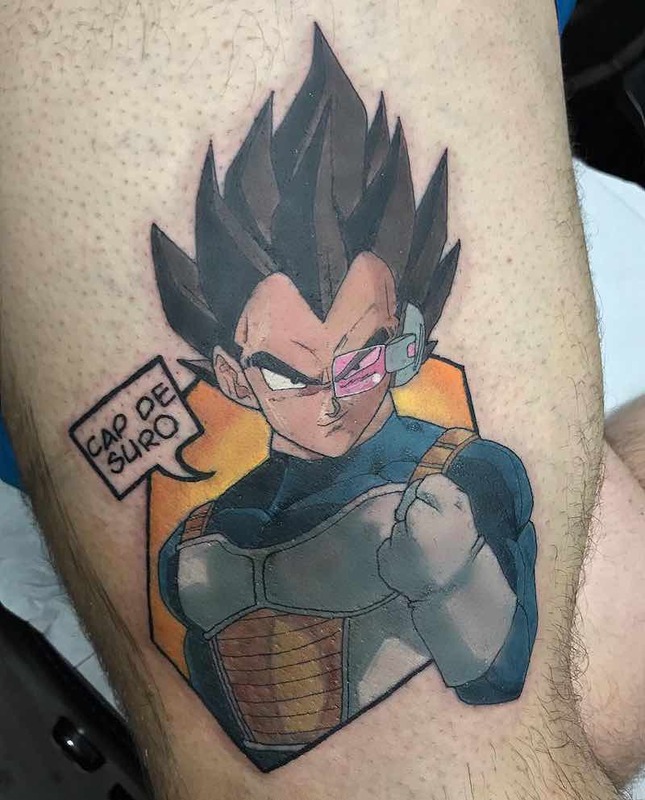 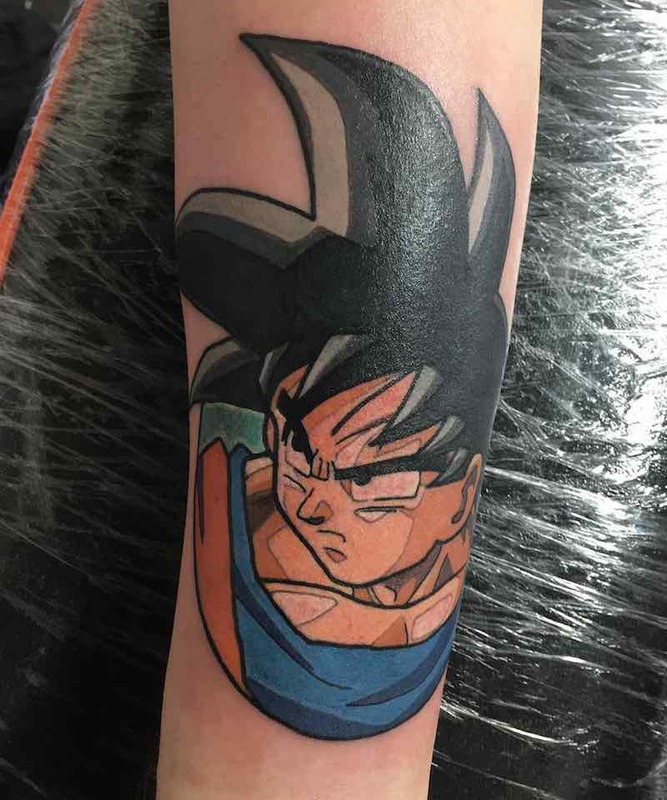 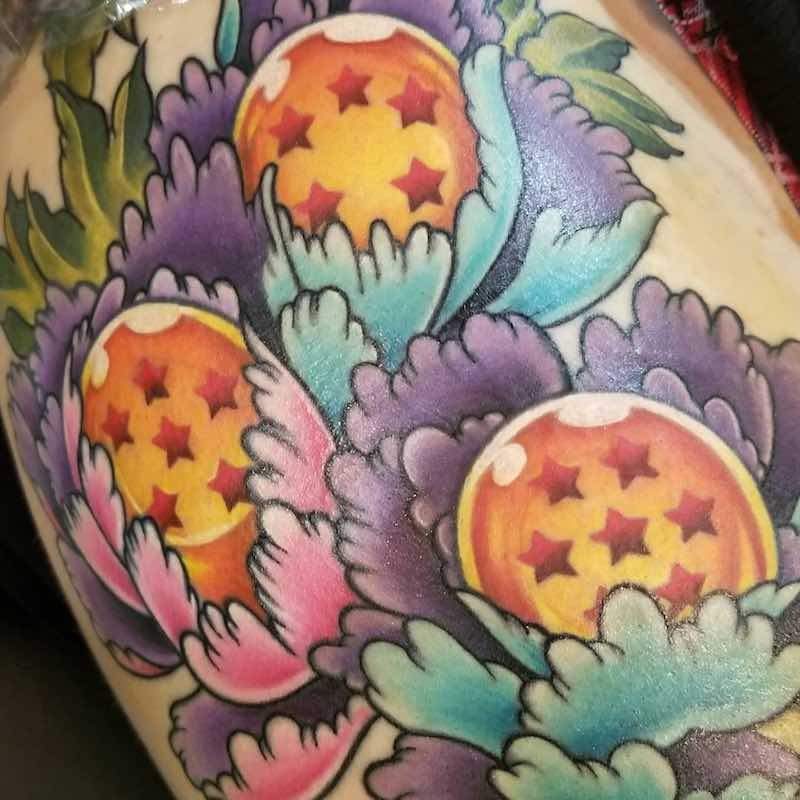 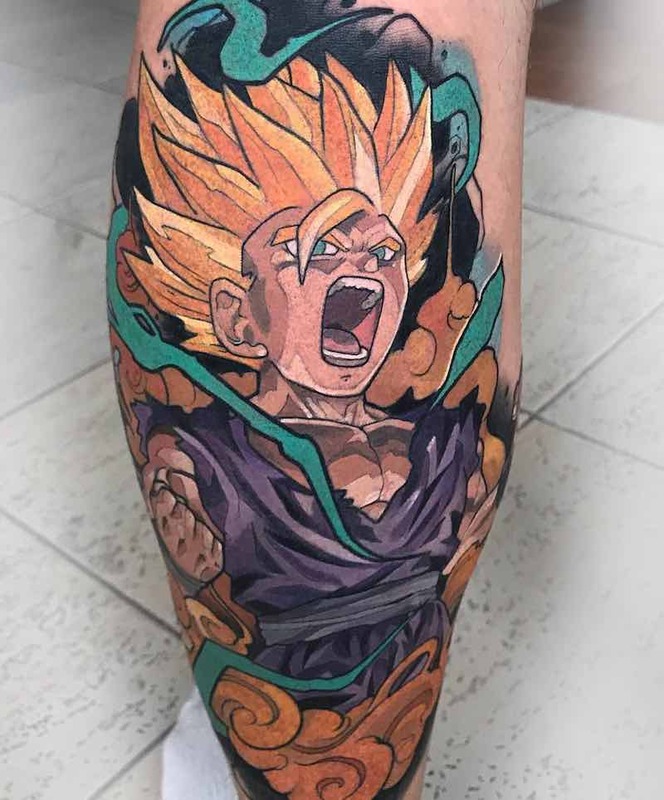 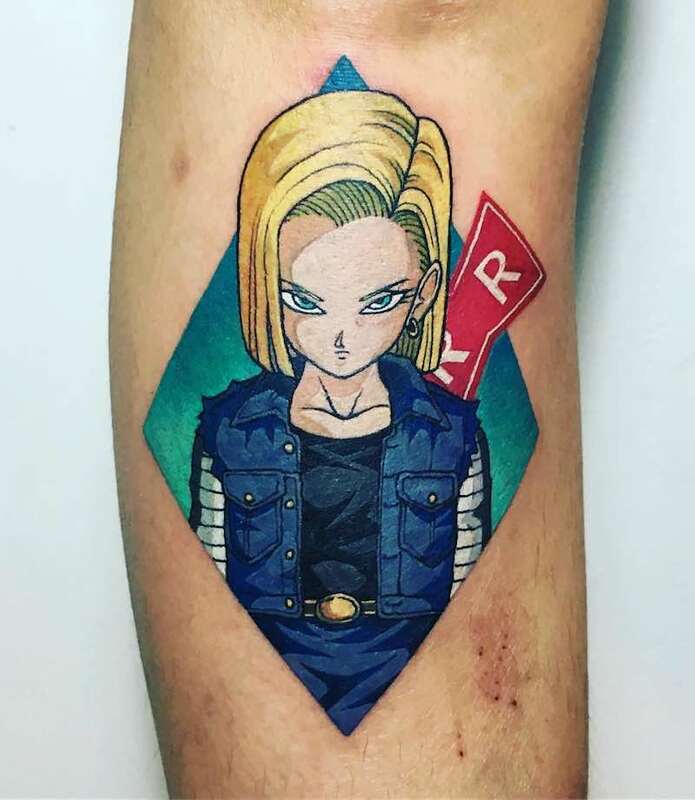 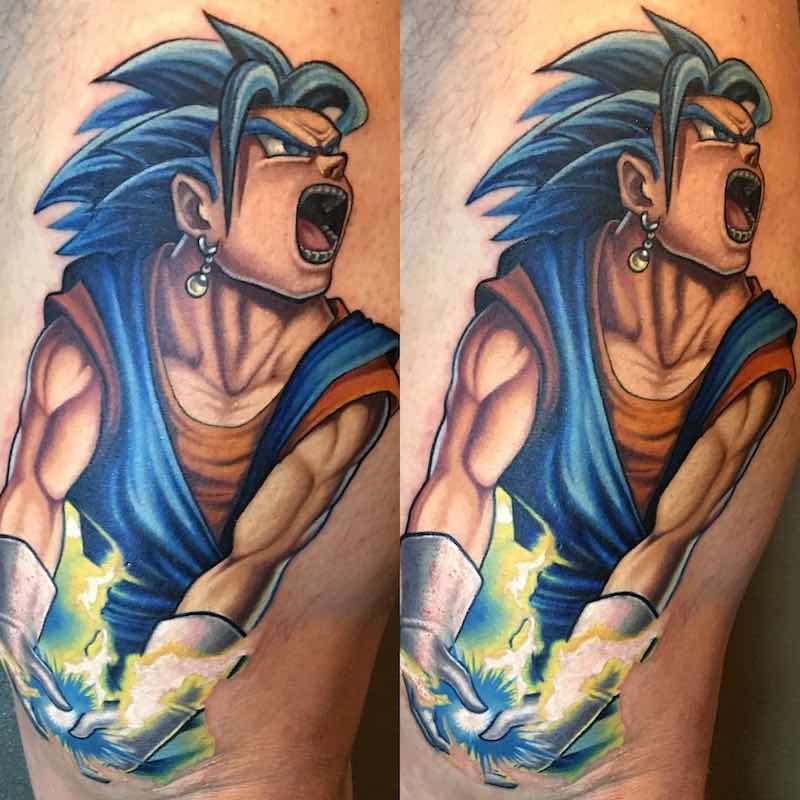 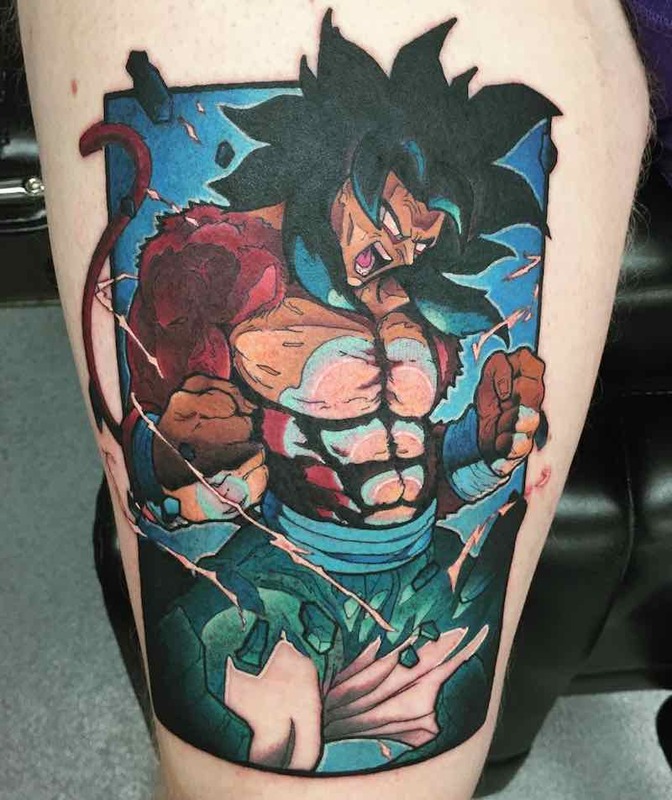 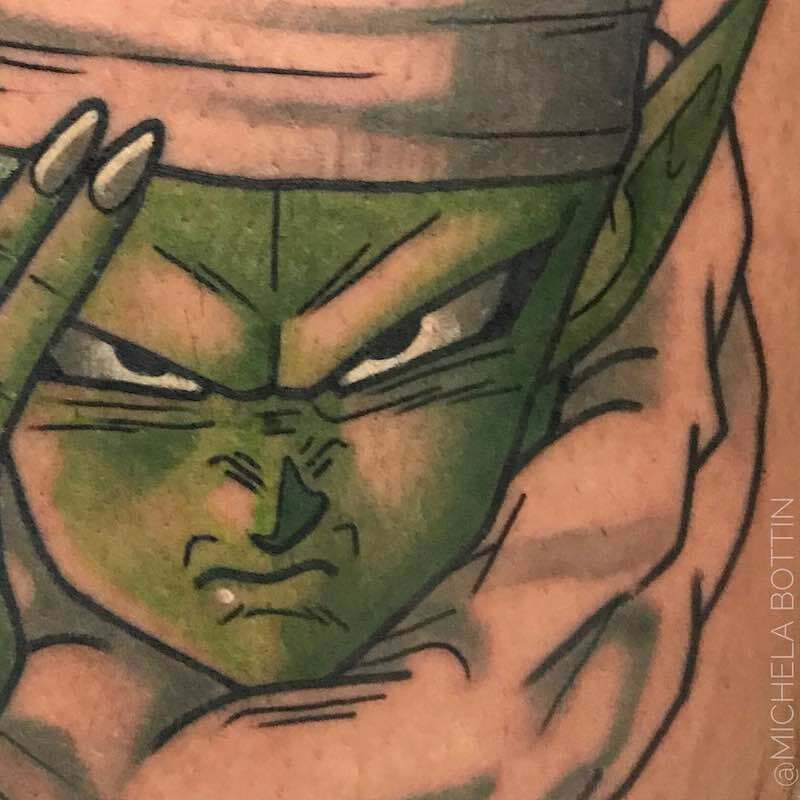 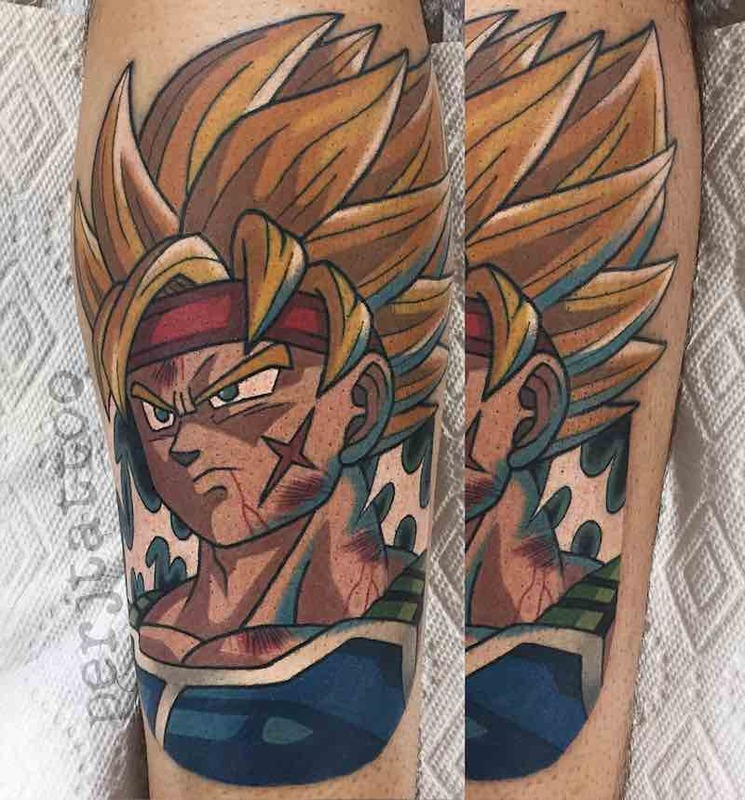 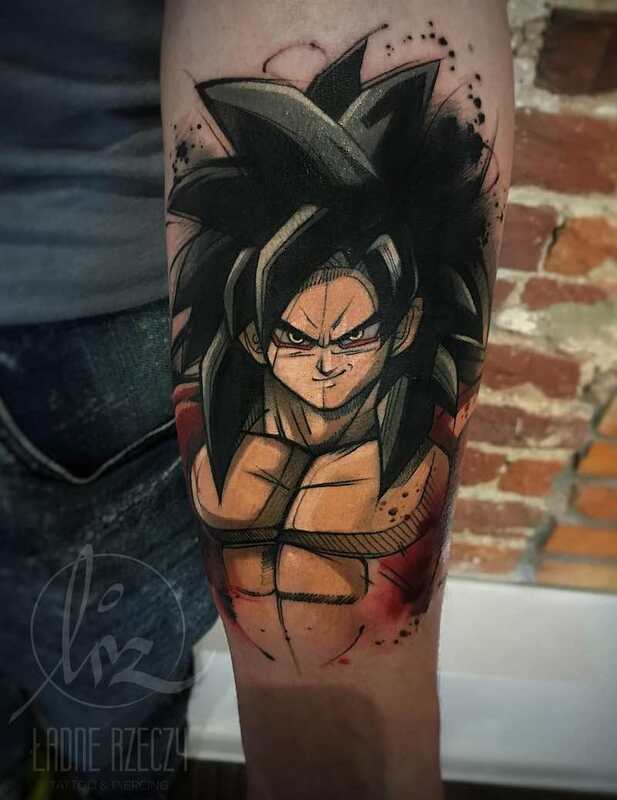 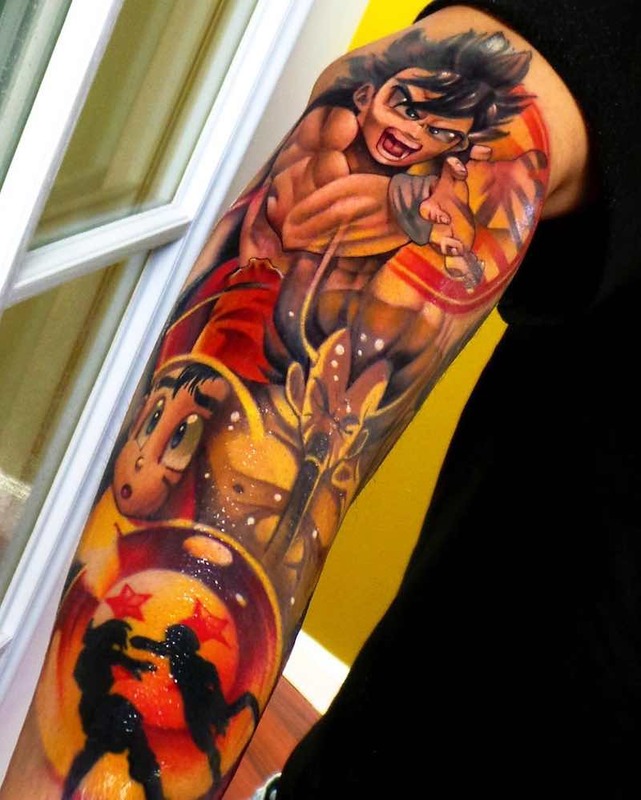 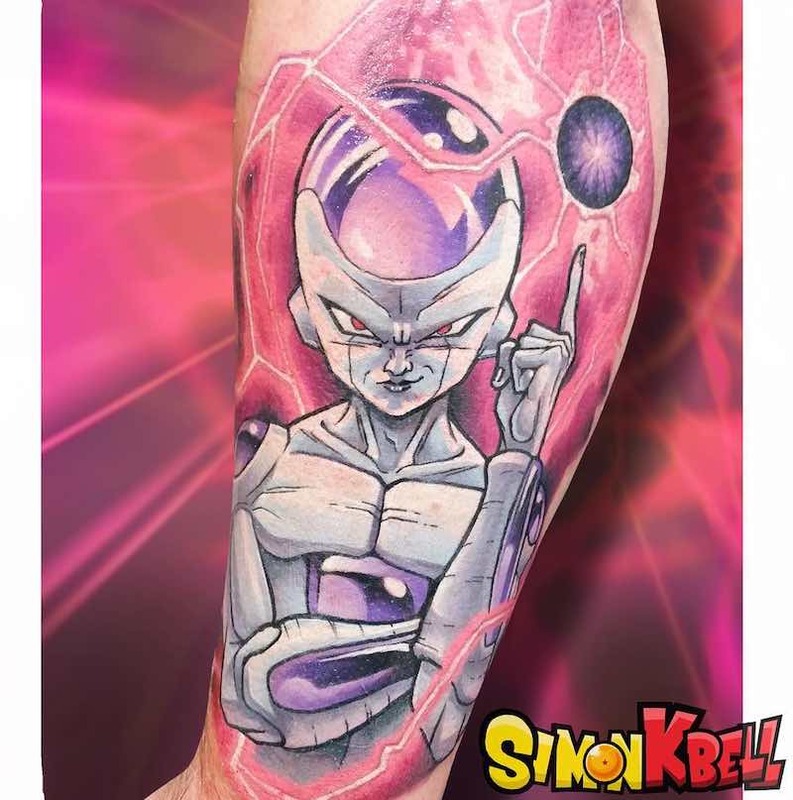 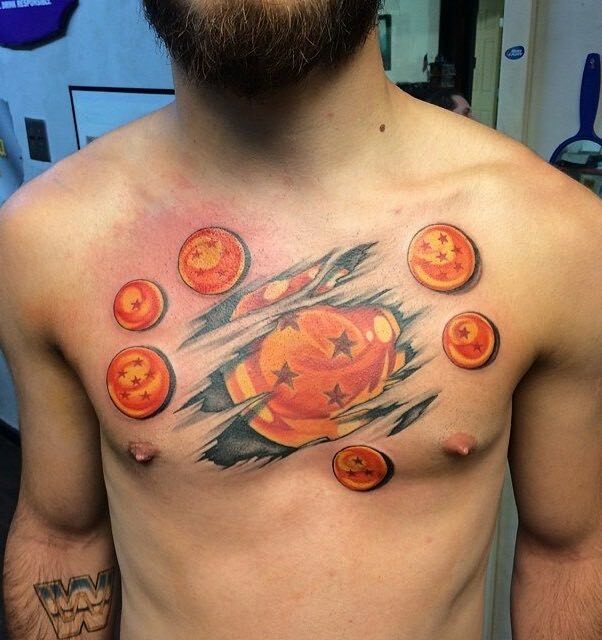 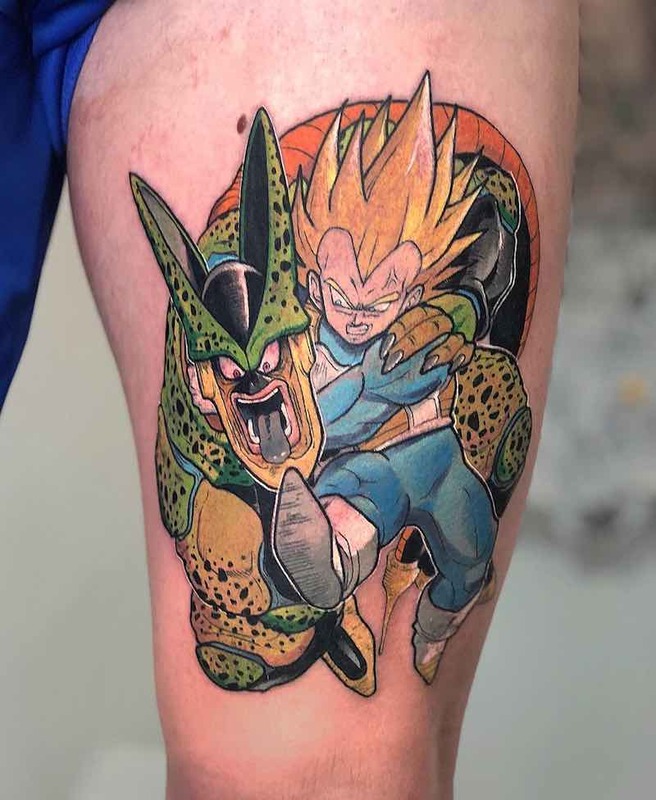 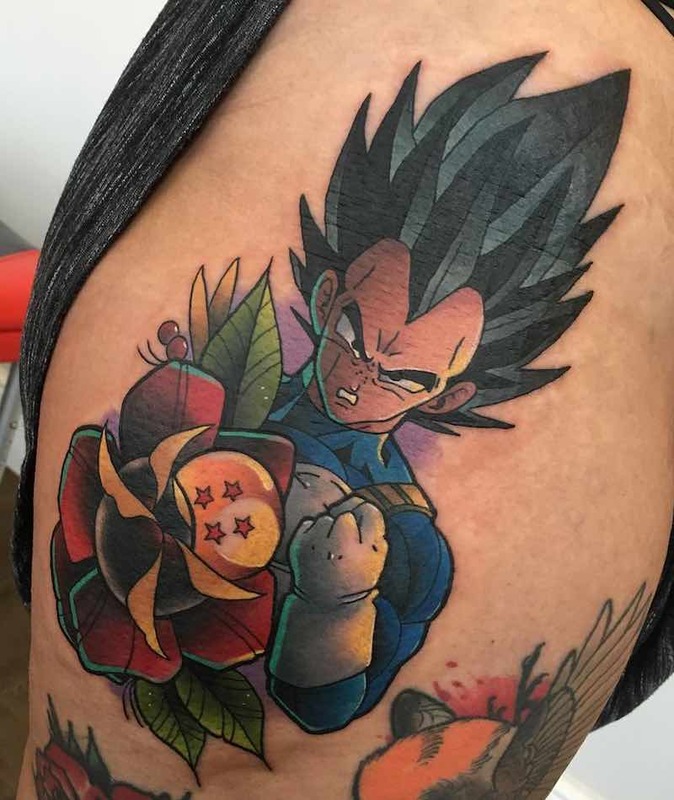 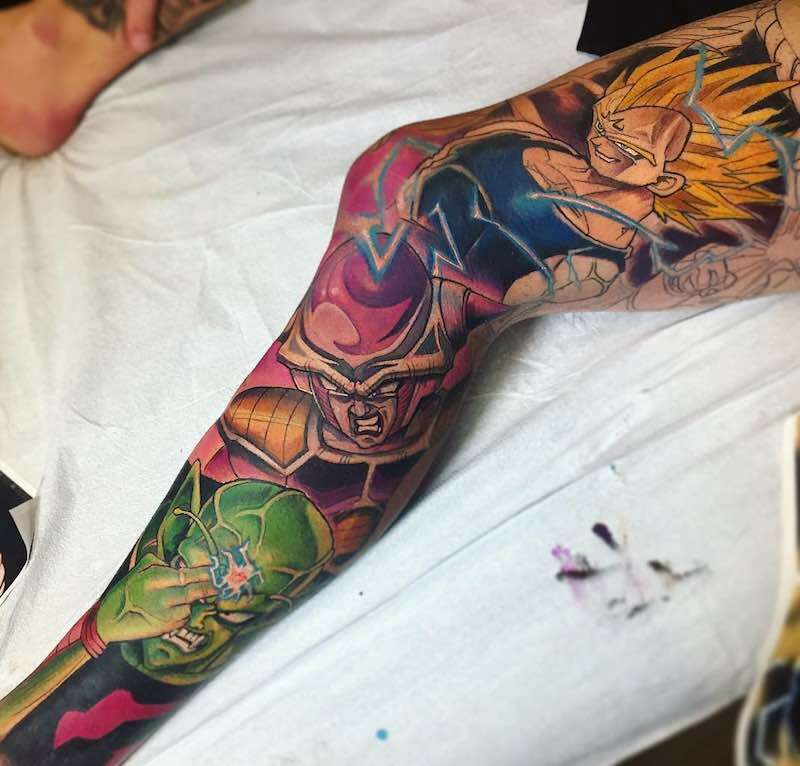 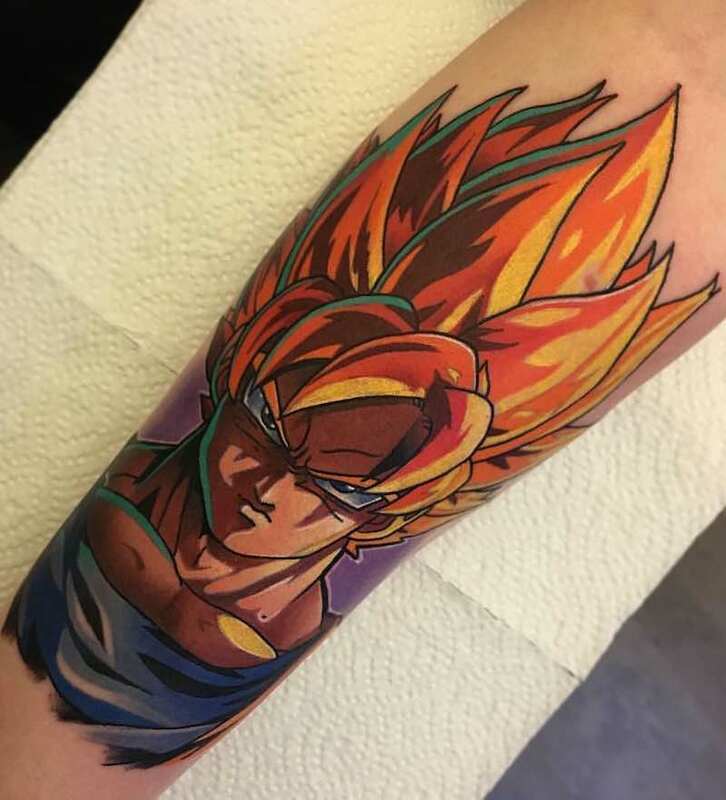 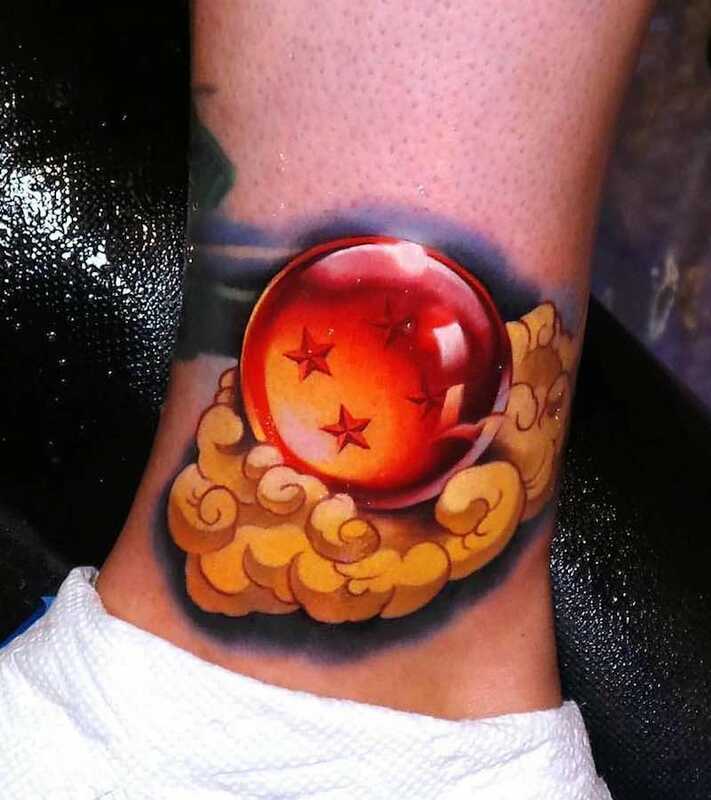 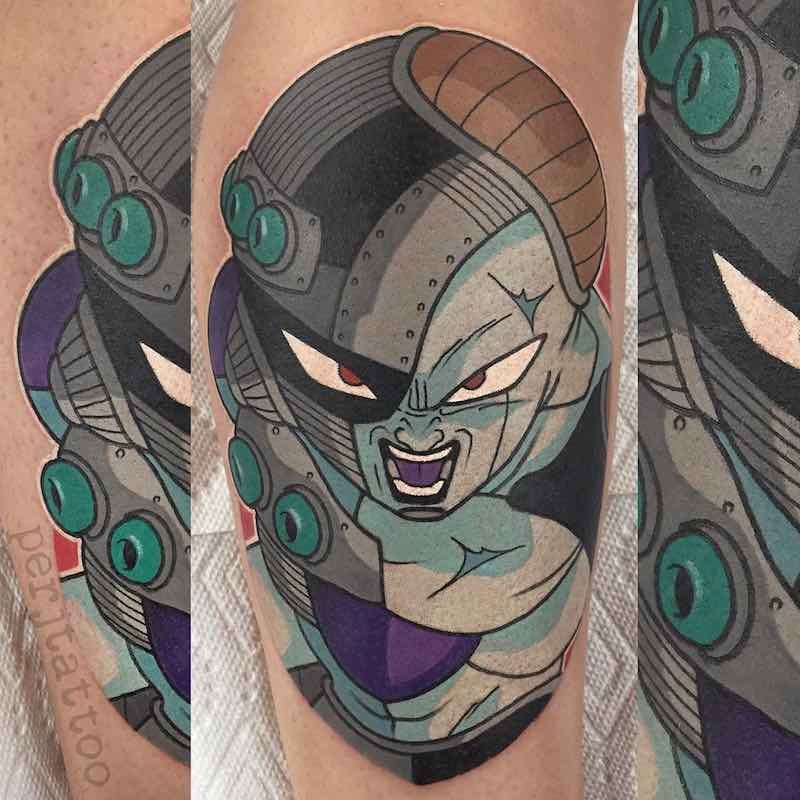 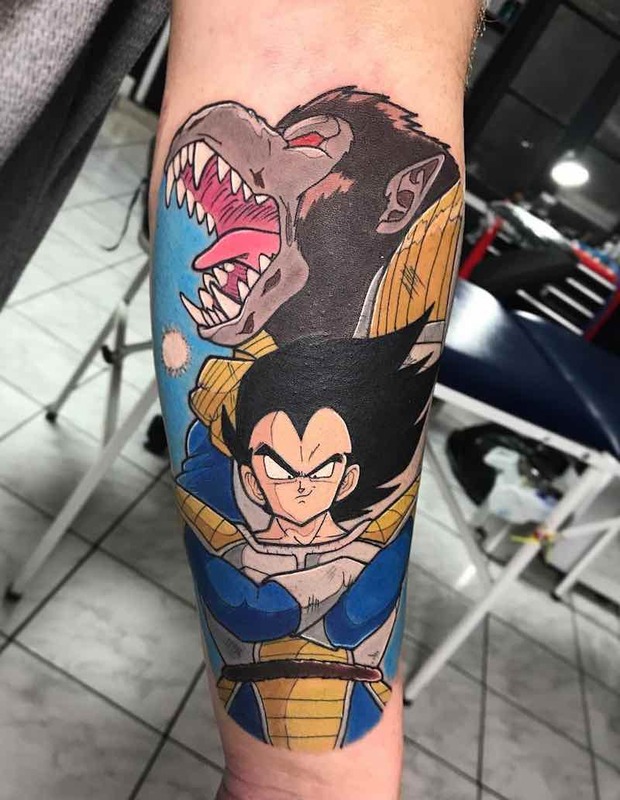 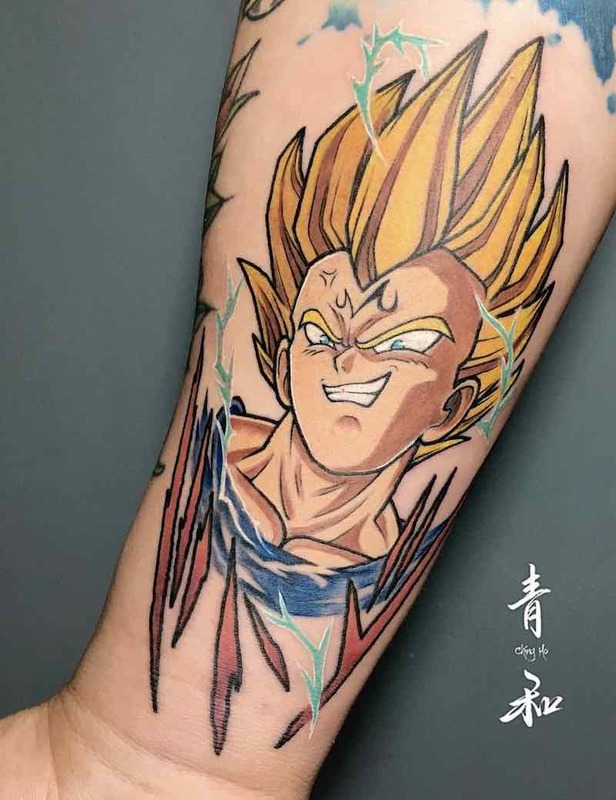 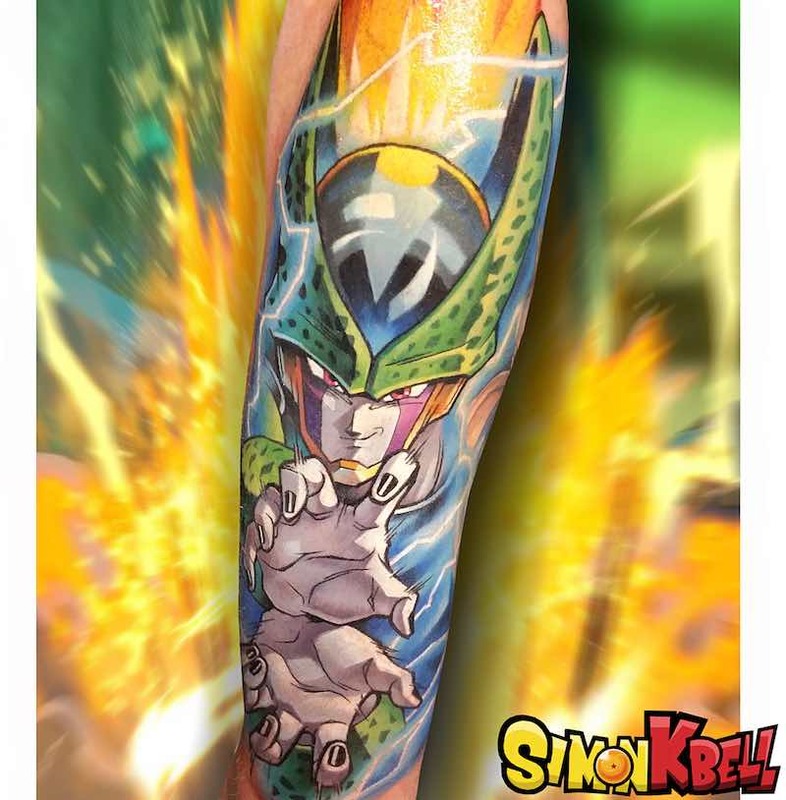 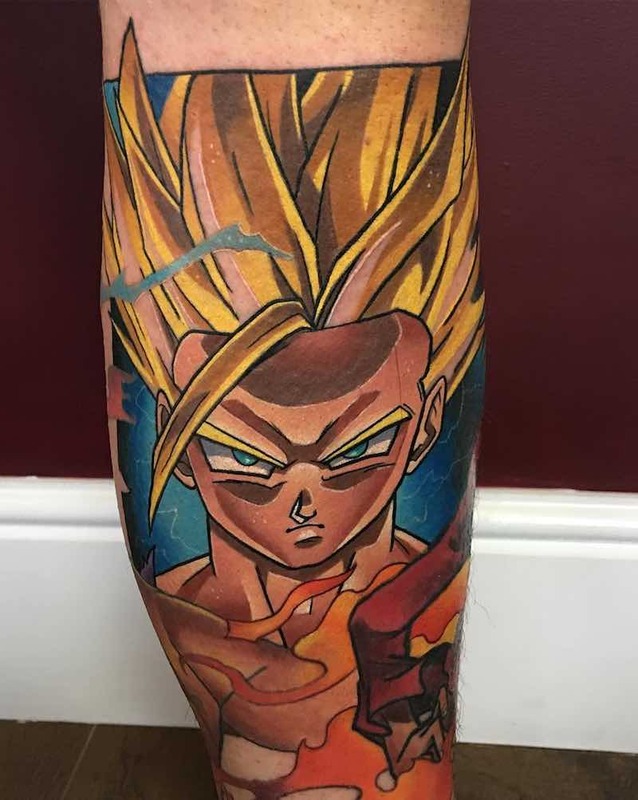 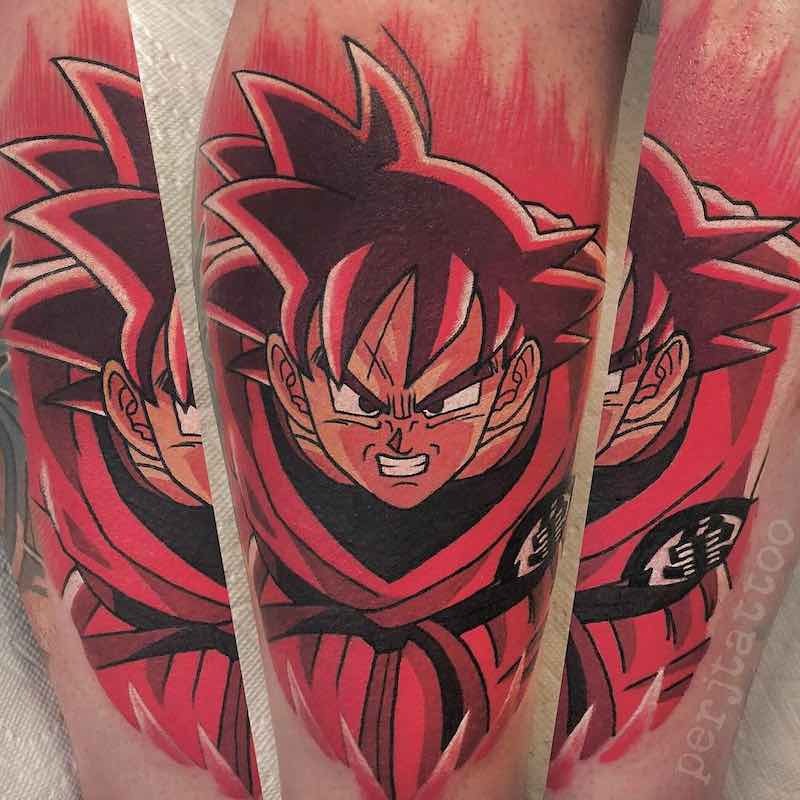 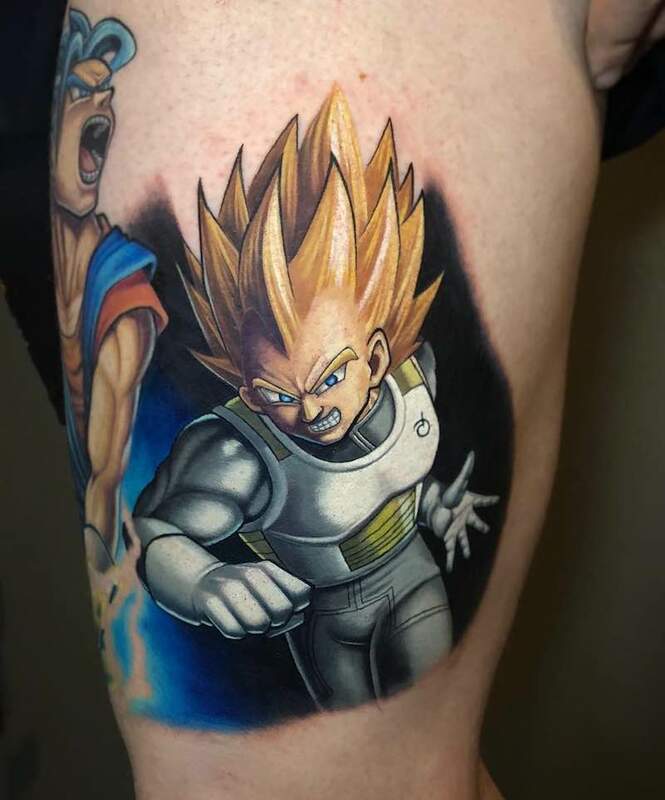 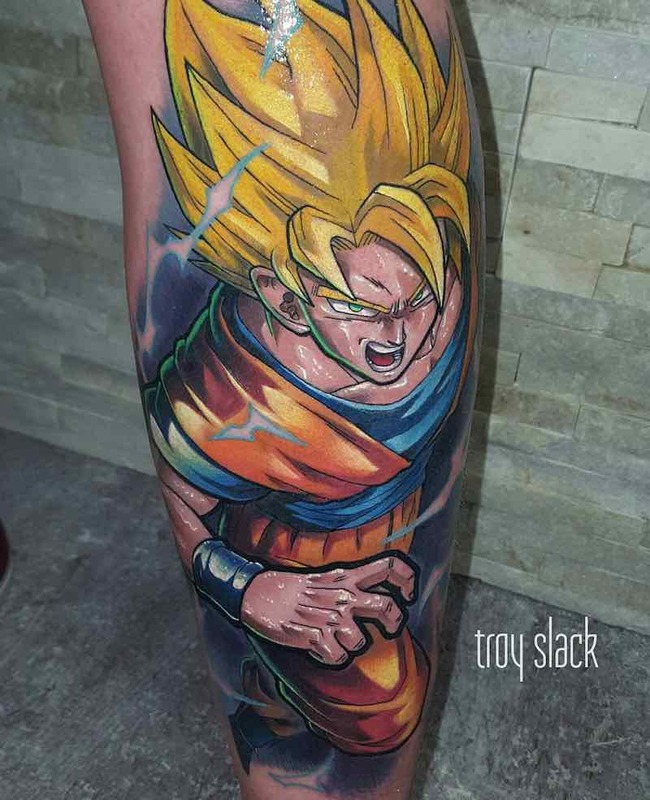 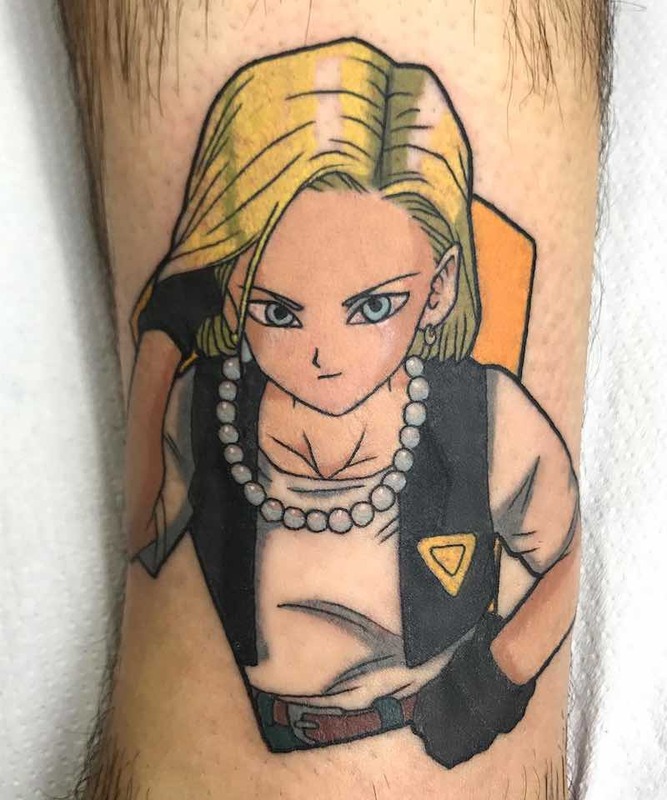 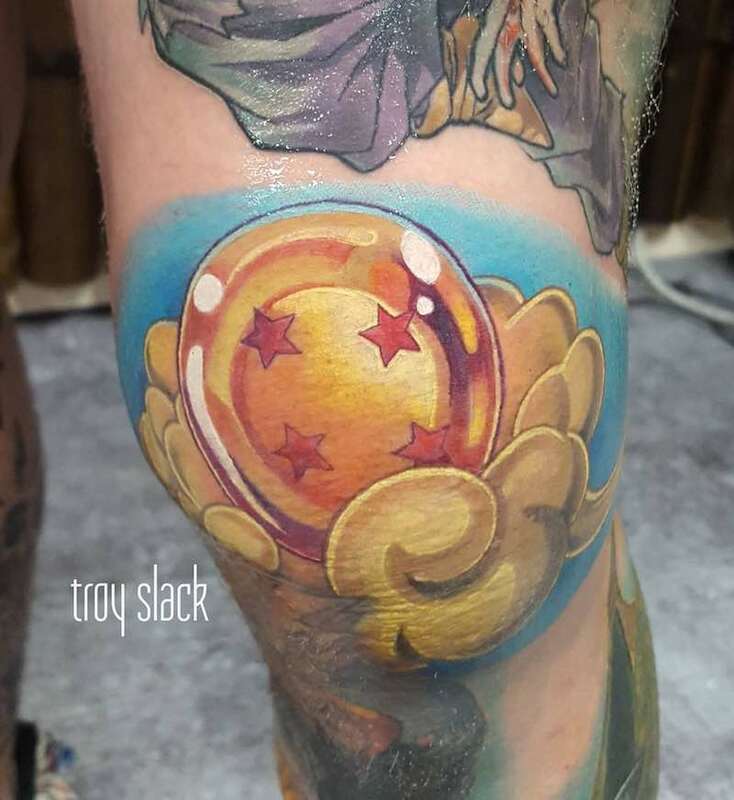 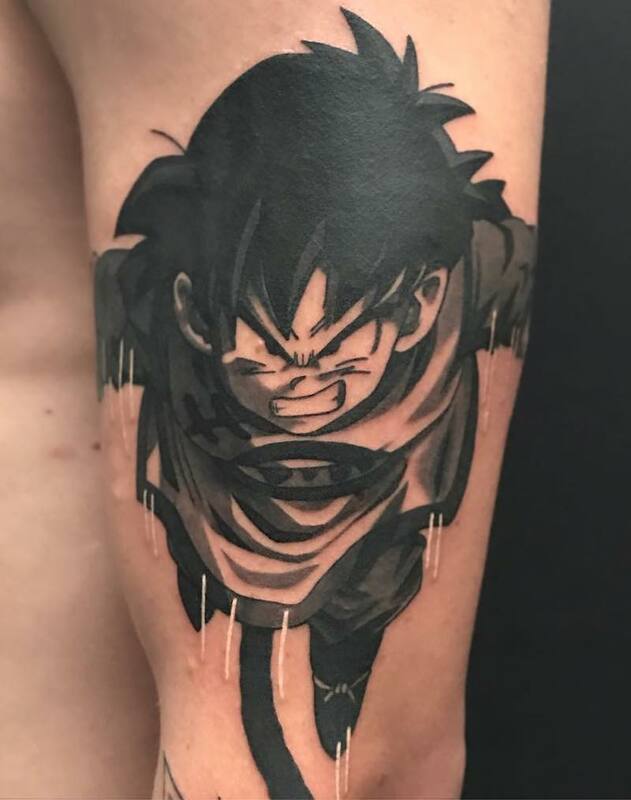 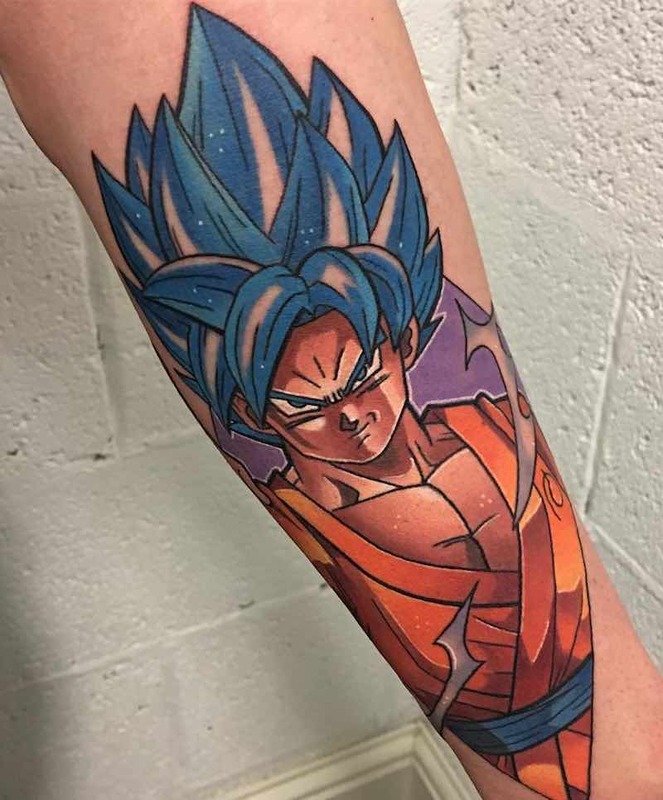 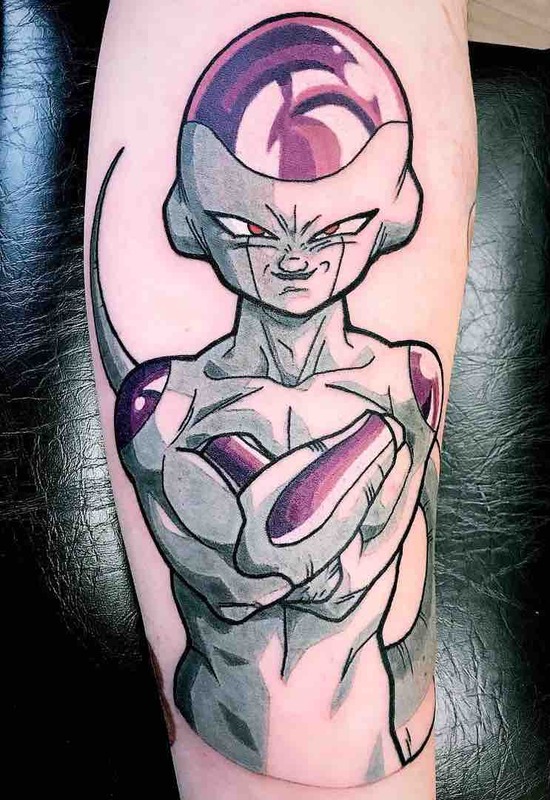 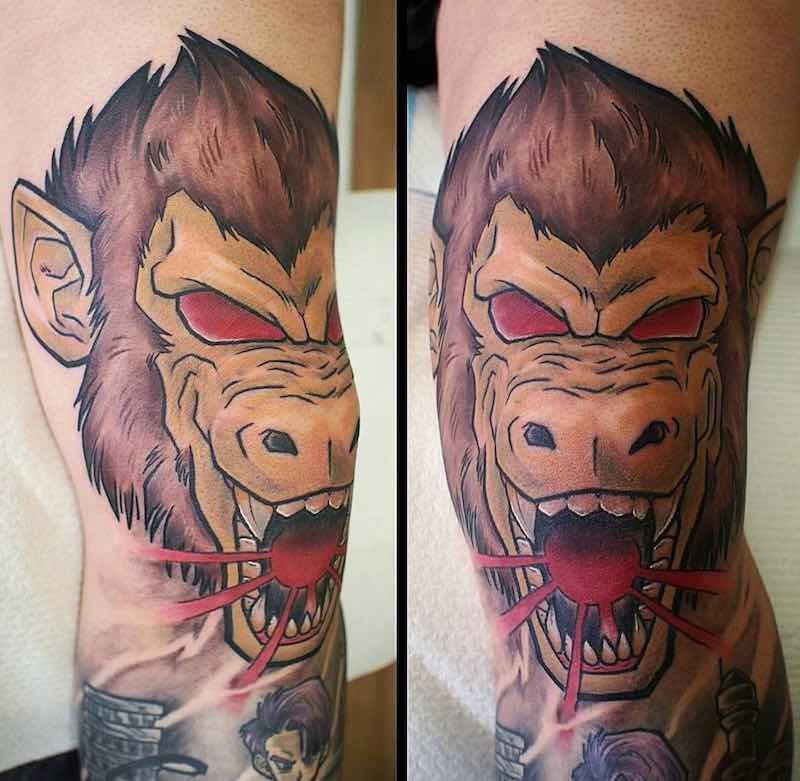 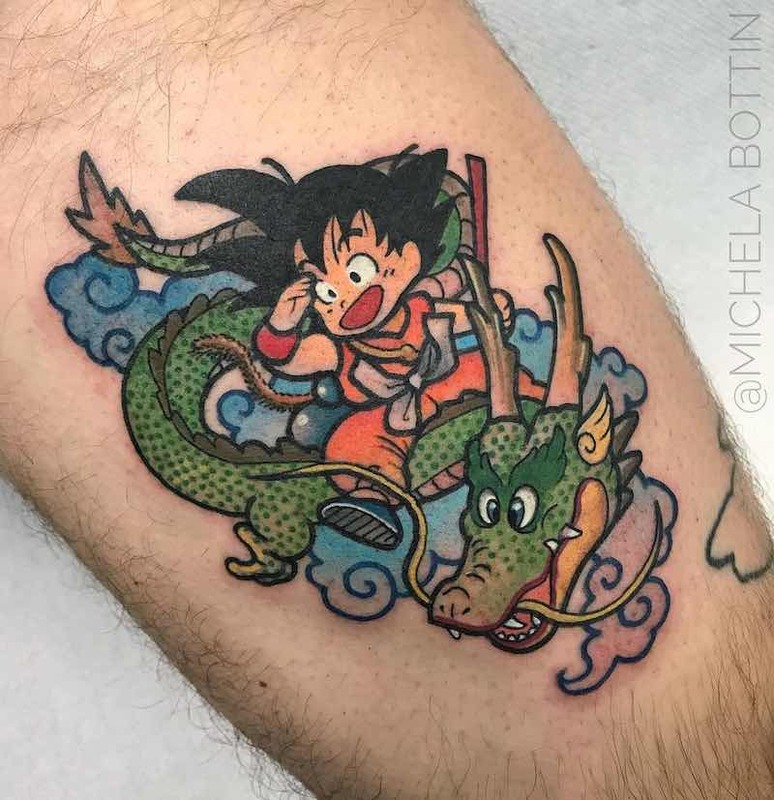 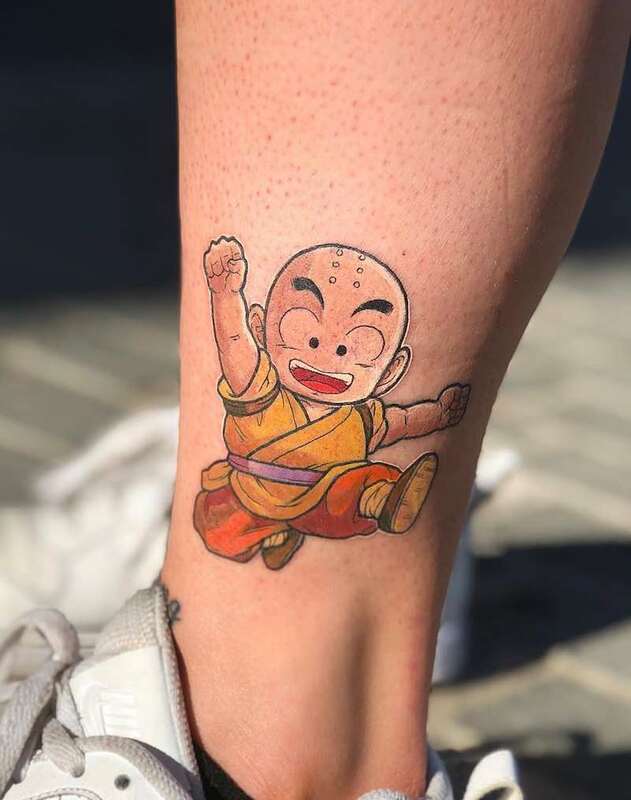 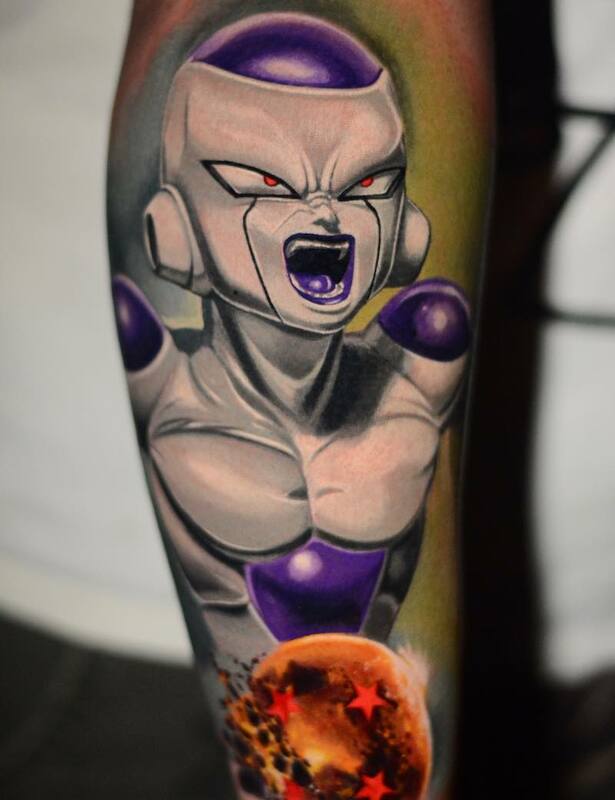 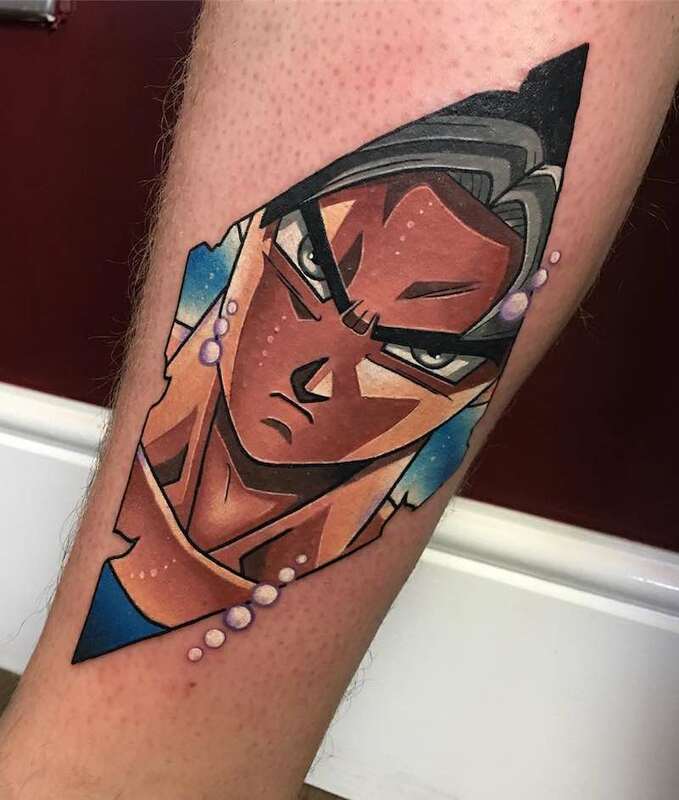 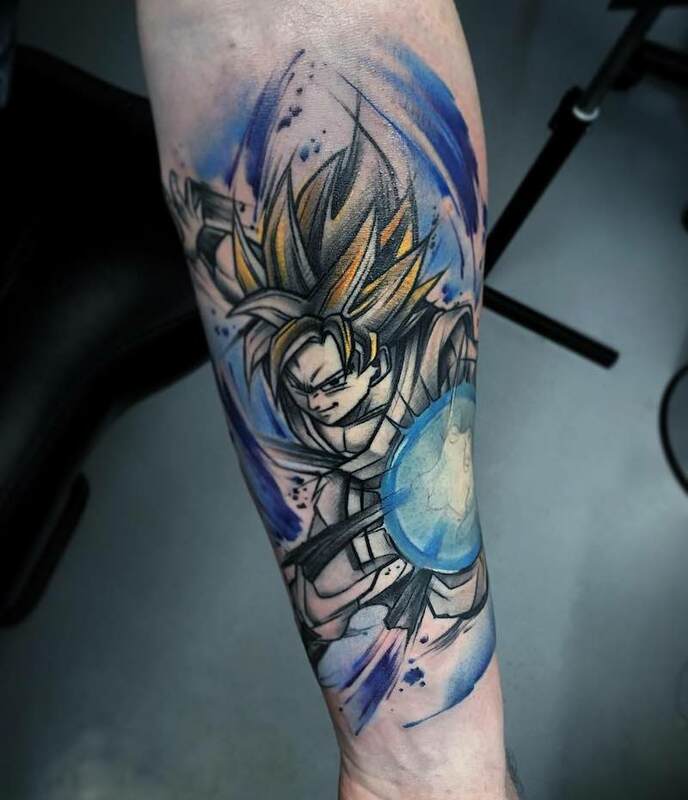 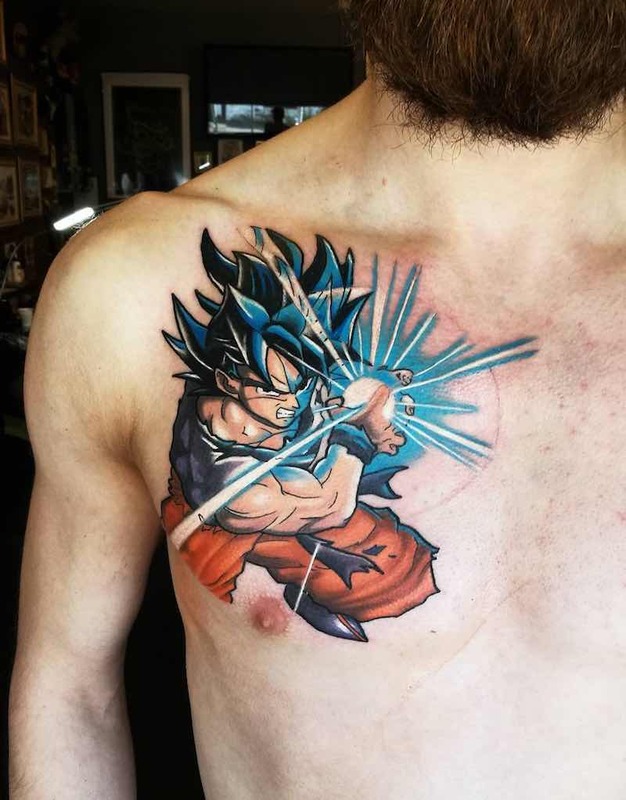 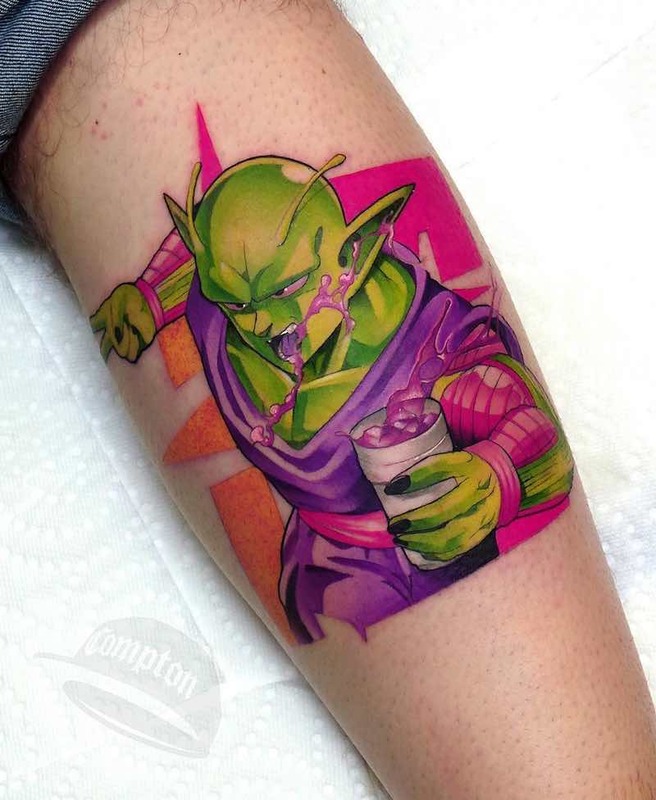 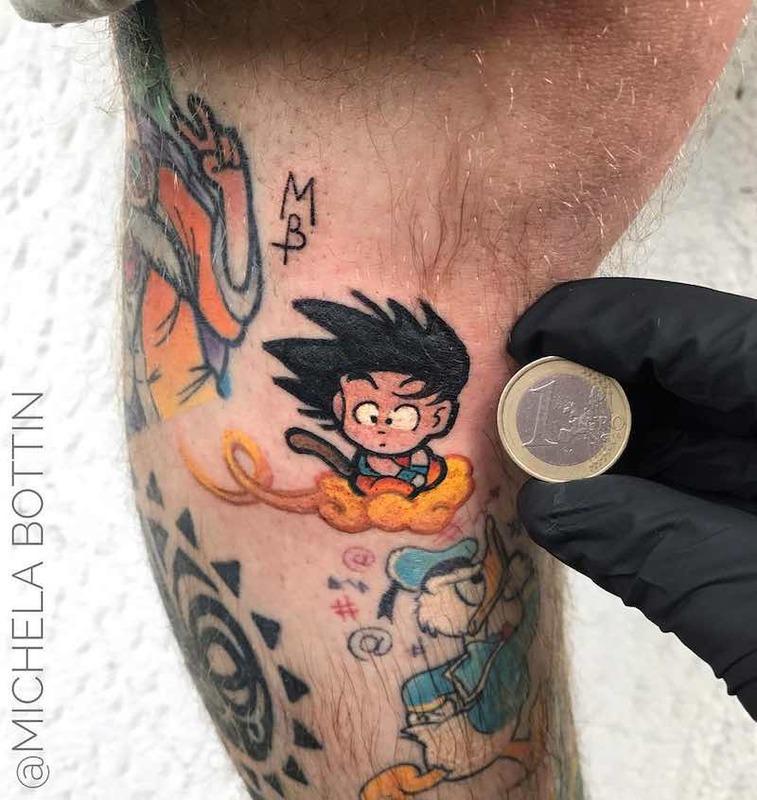 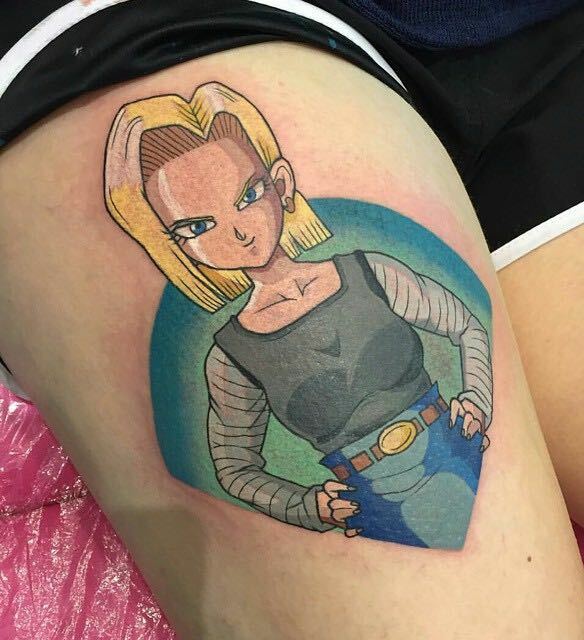 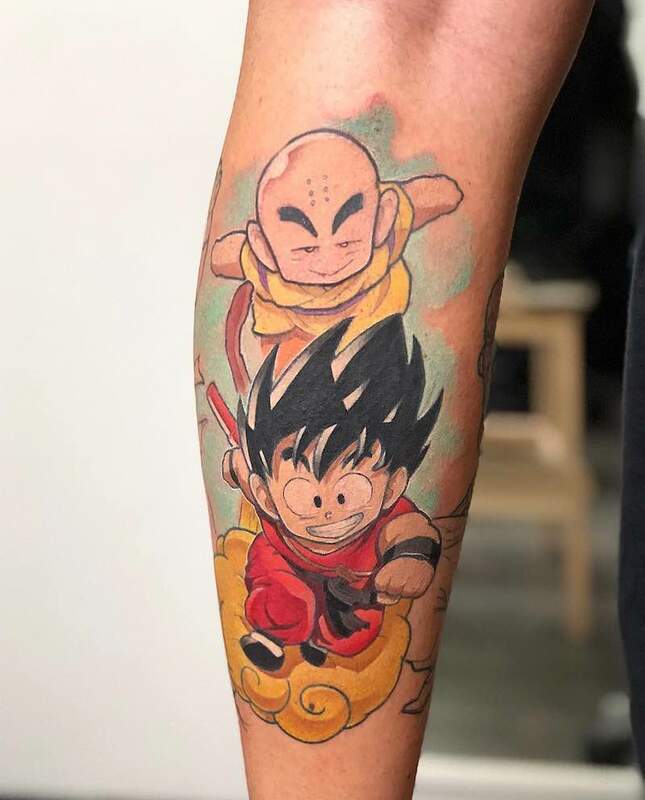 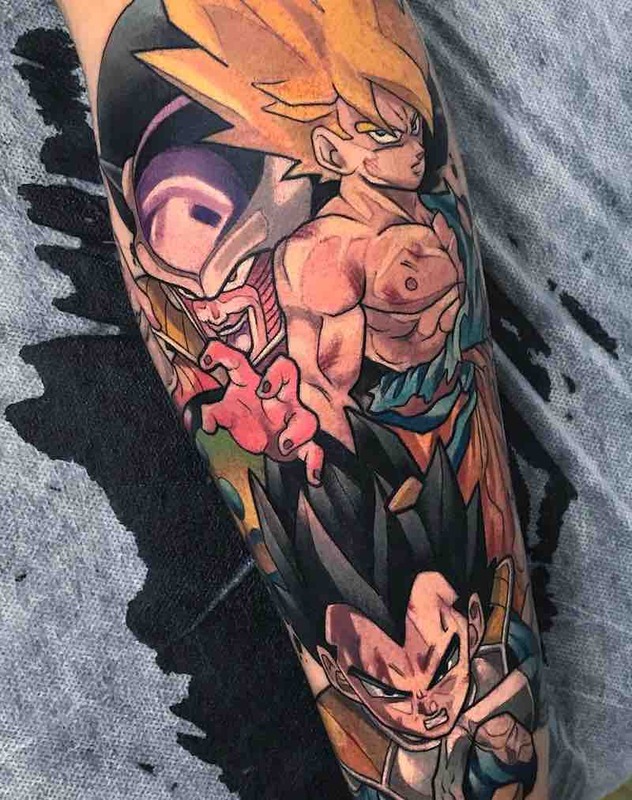 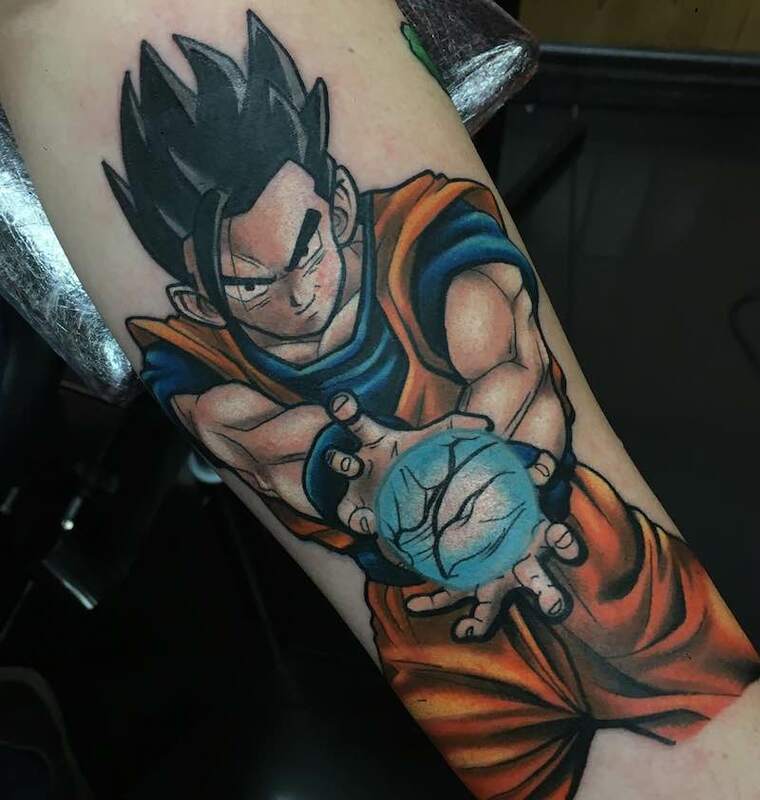 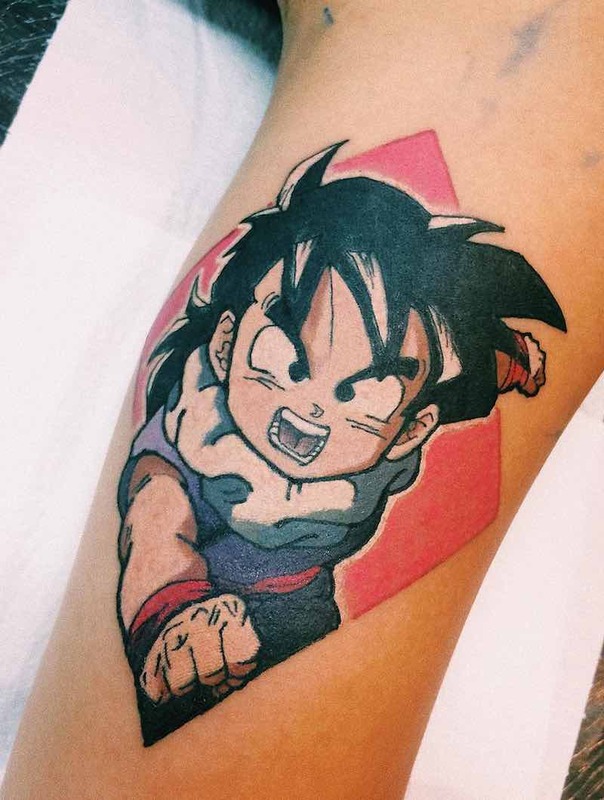 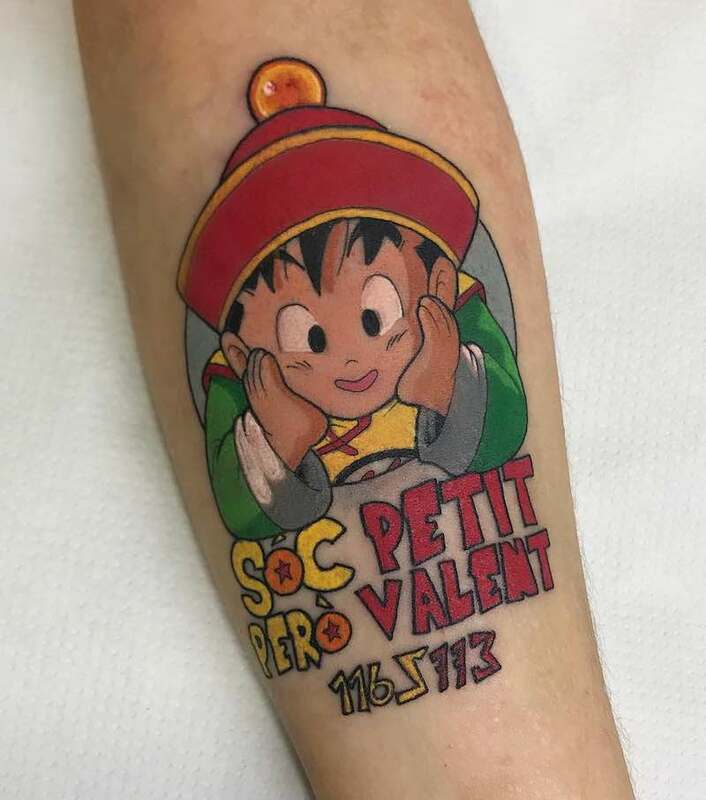 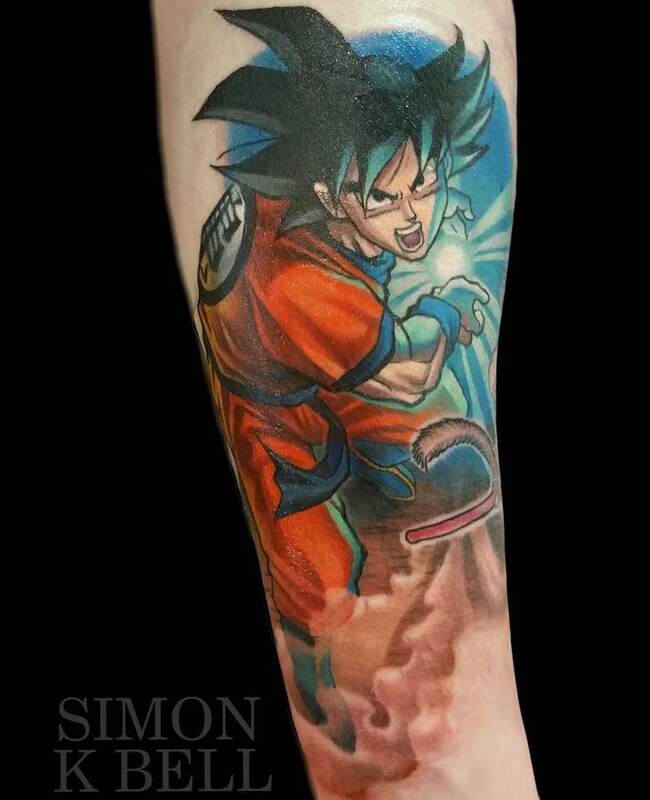 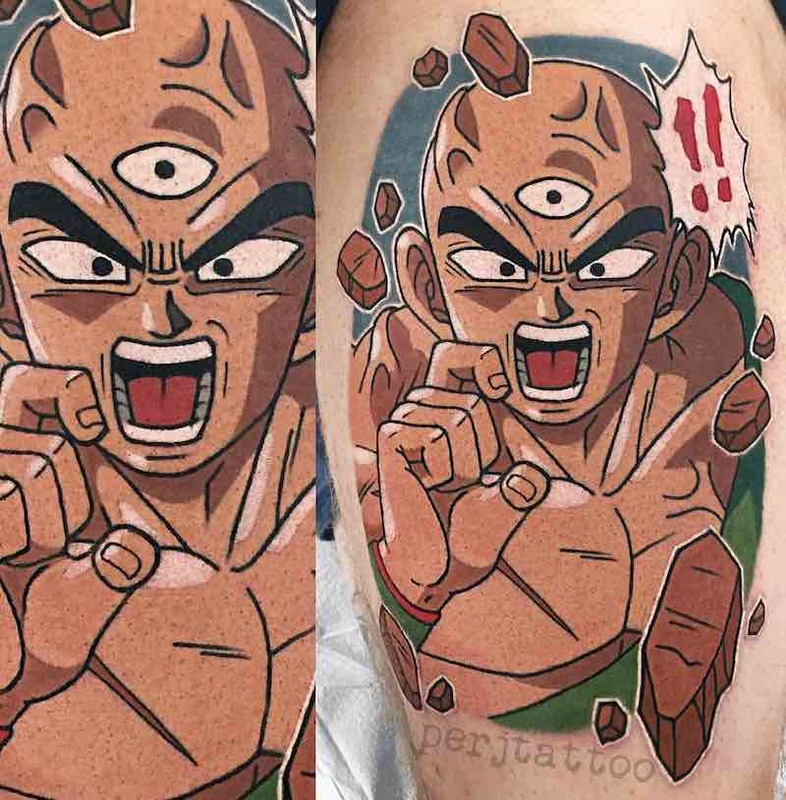 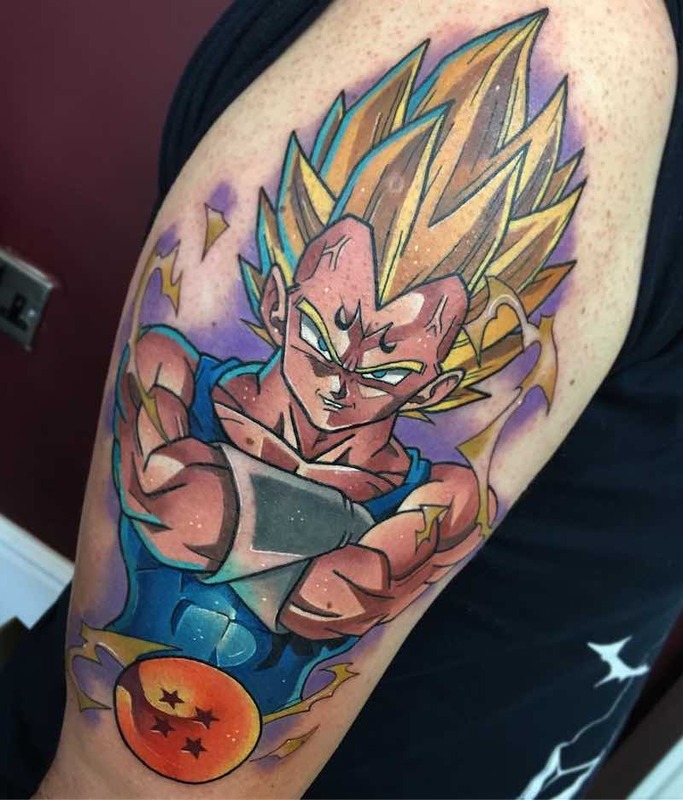 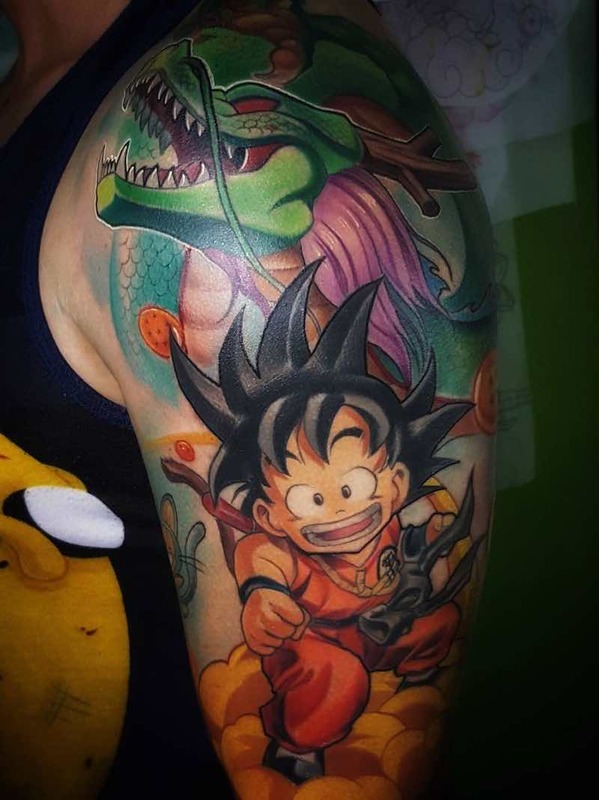 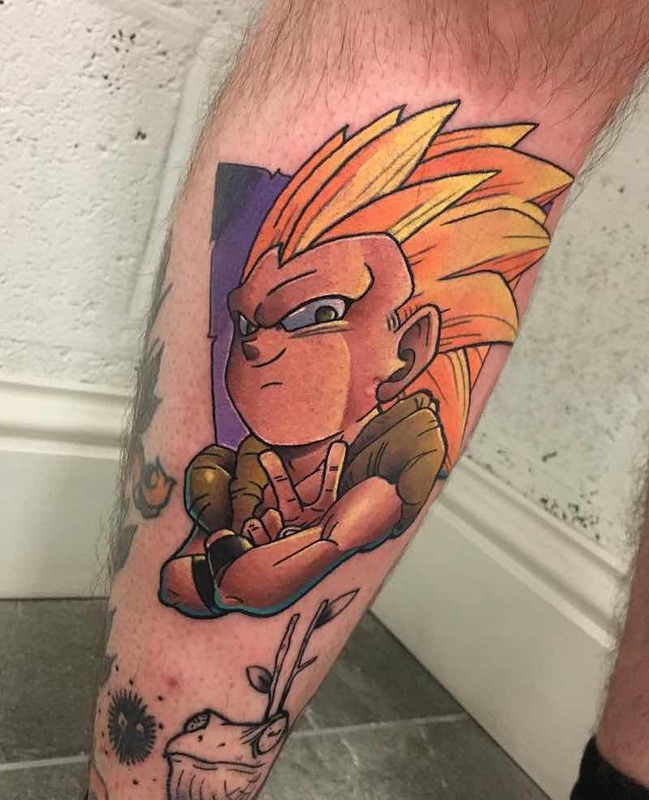 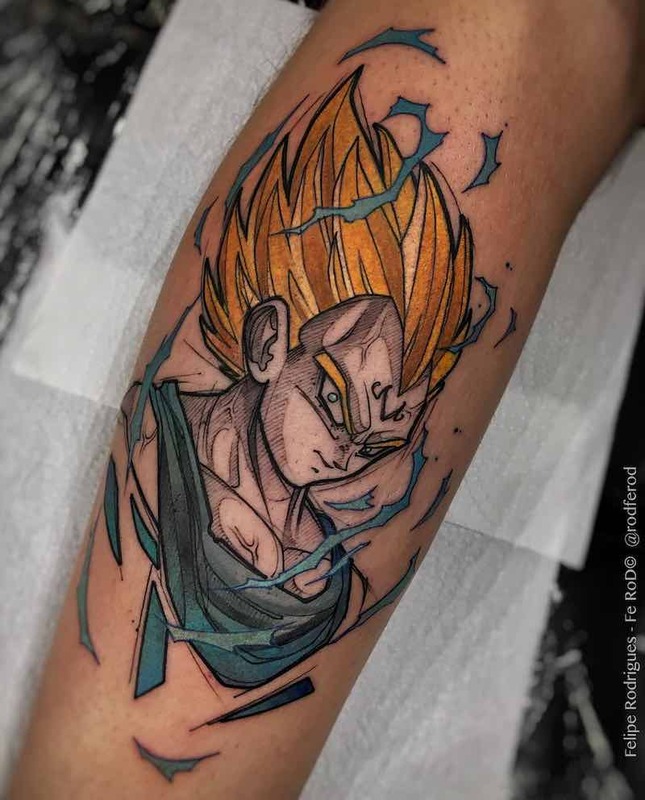 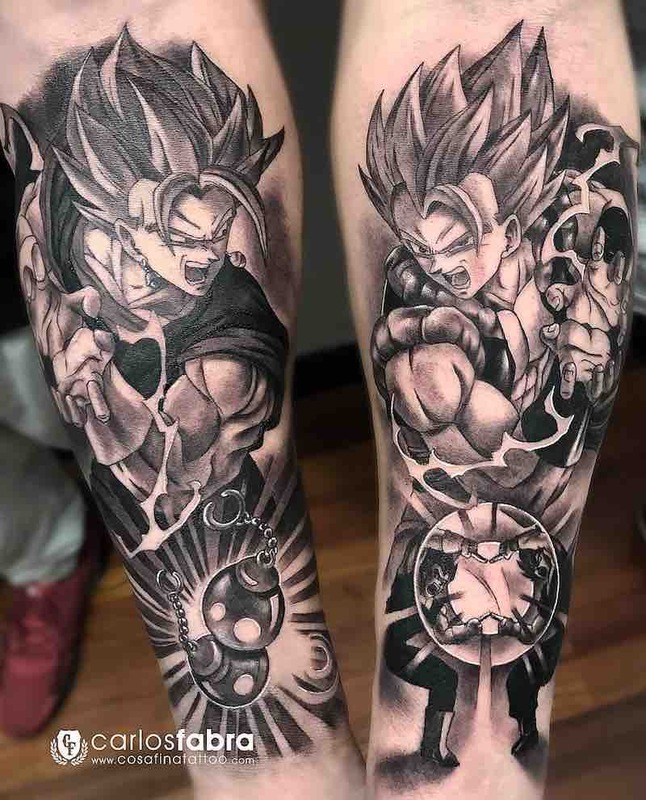 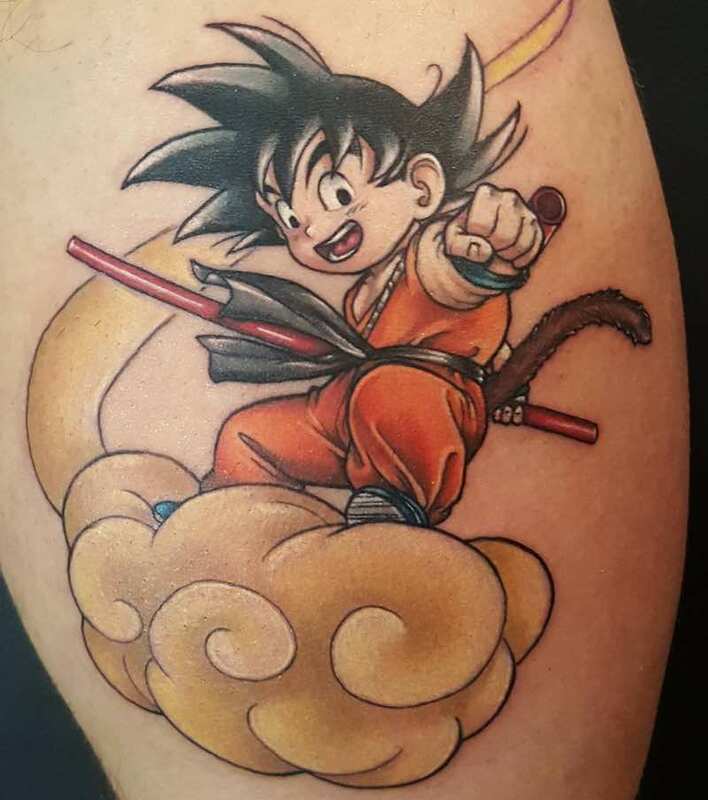 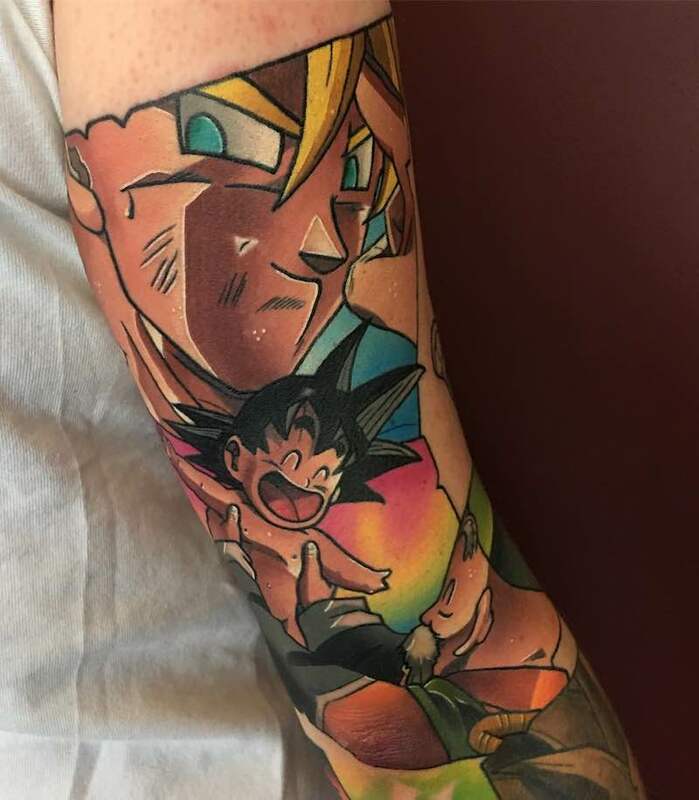 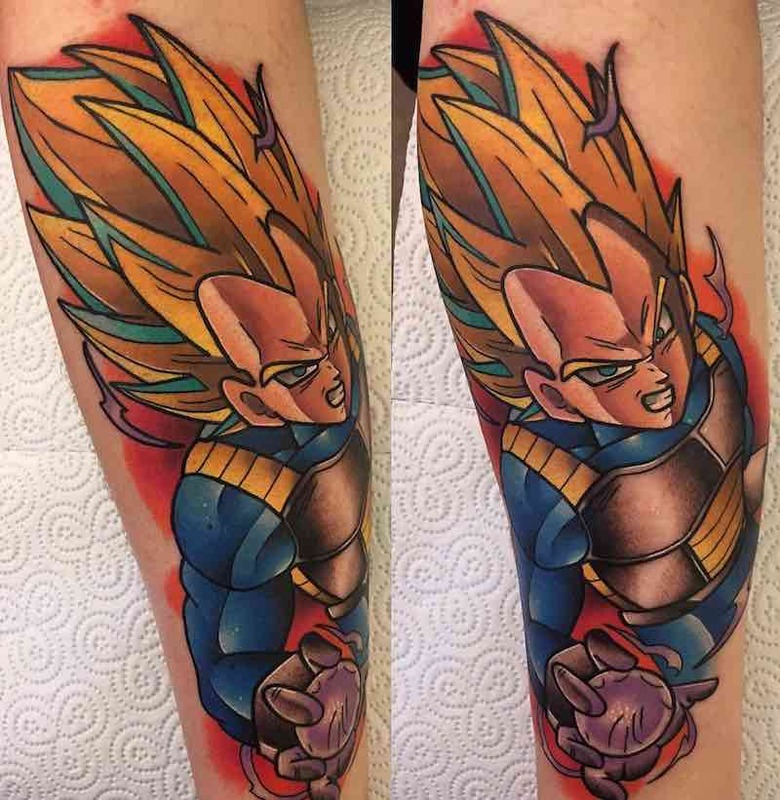 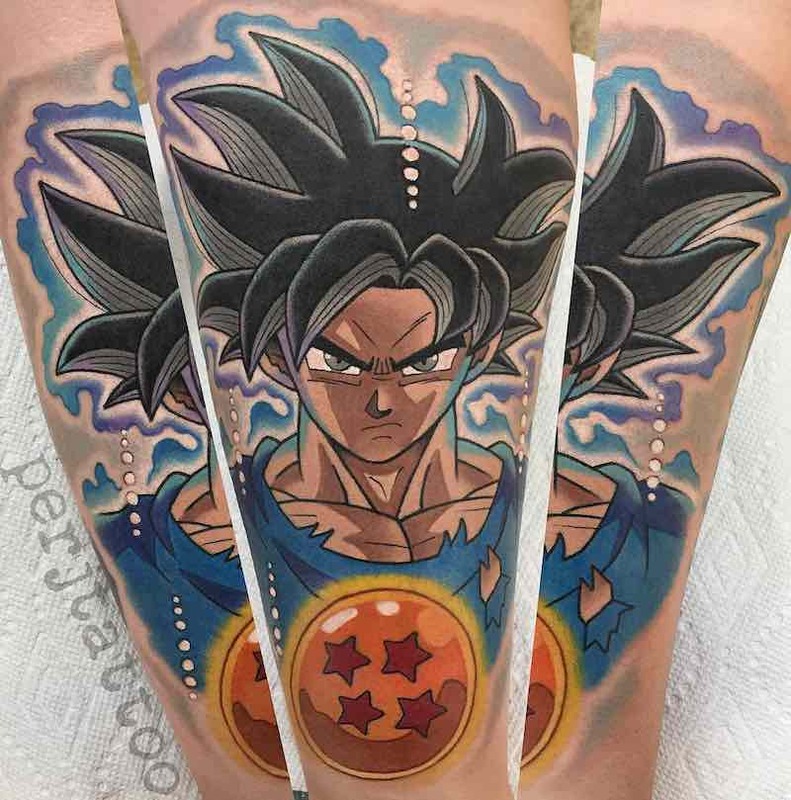 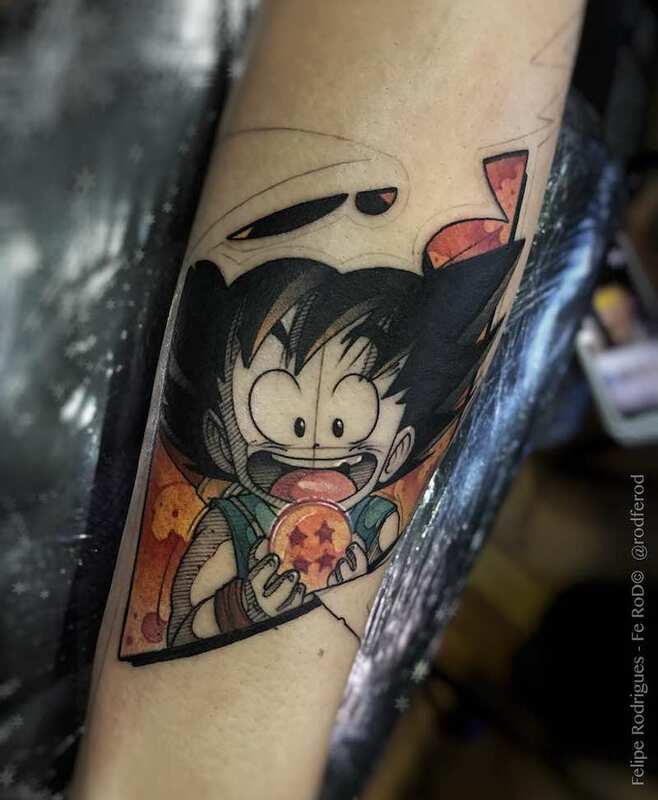 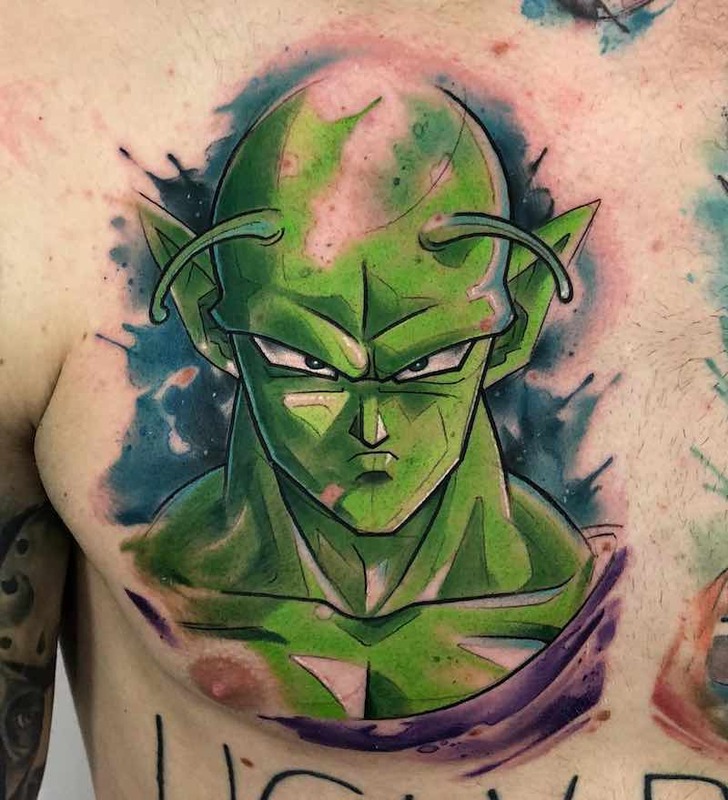 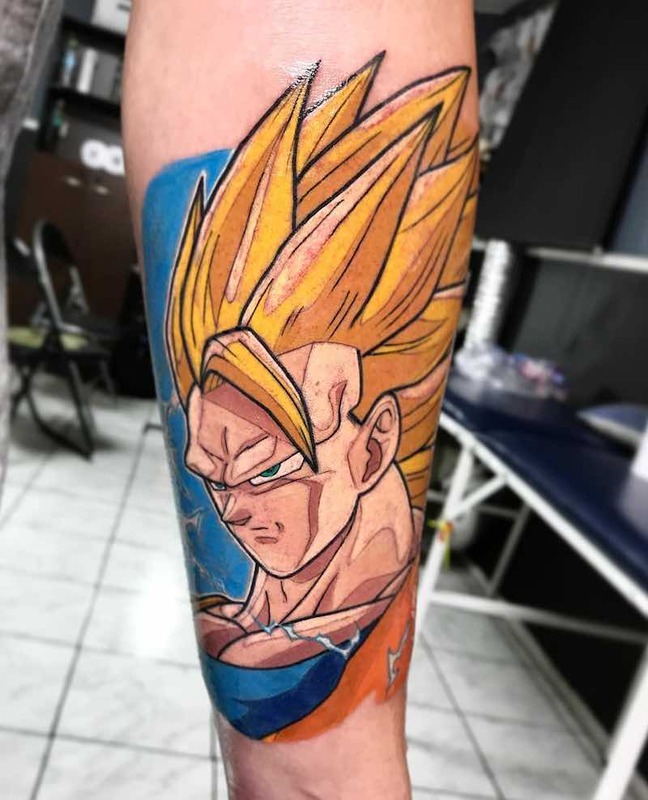 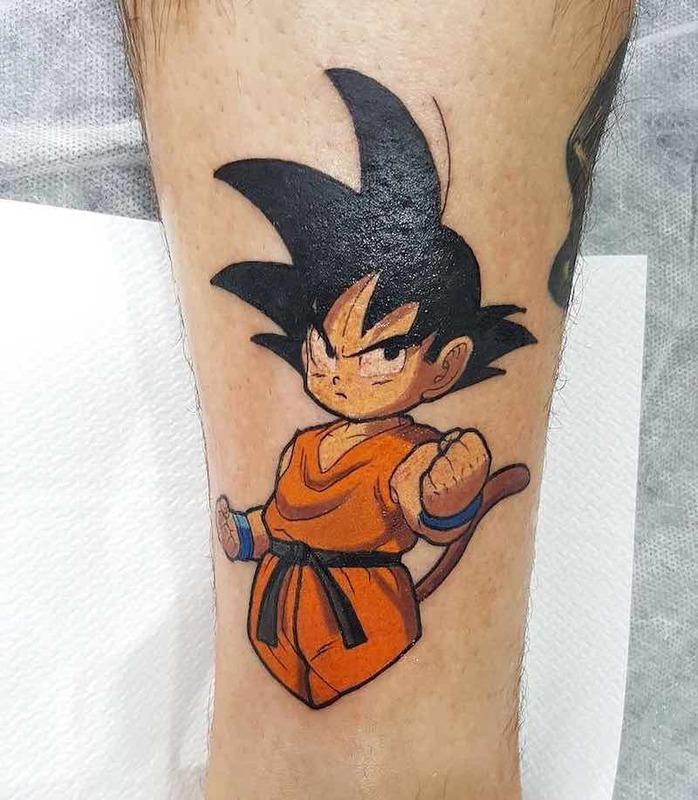 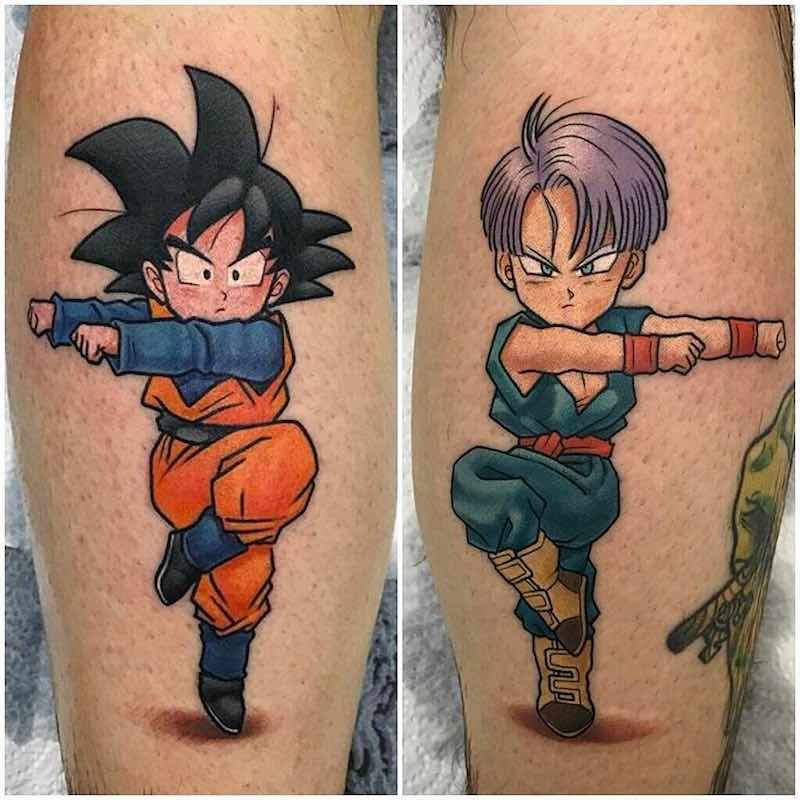 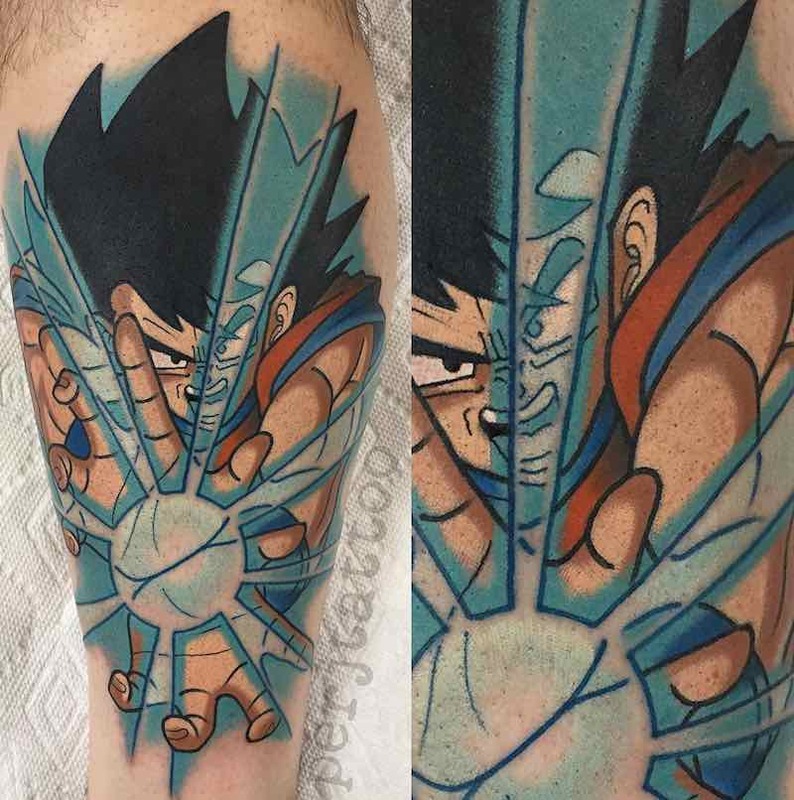 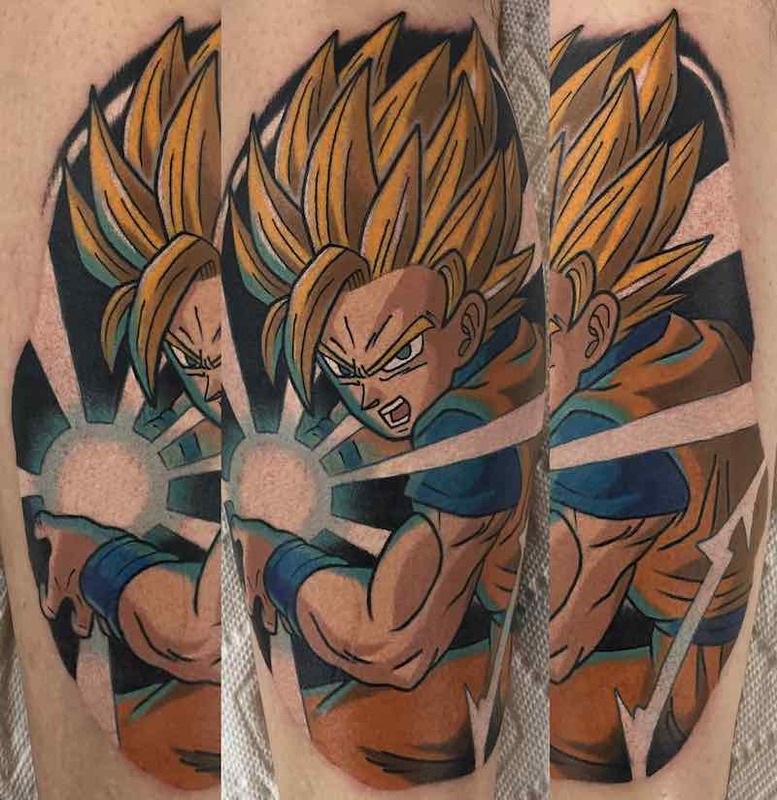 the popularity of the show has driven many to get Dragon Ball Z tattoos, so much so that quite a few tattoo artists even specialize in Dragon Ball Z Tattoos. 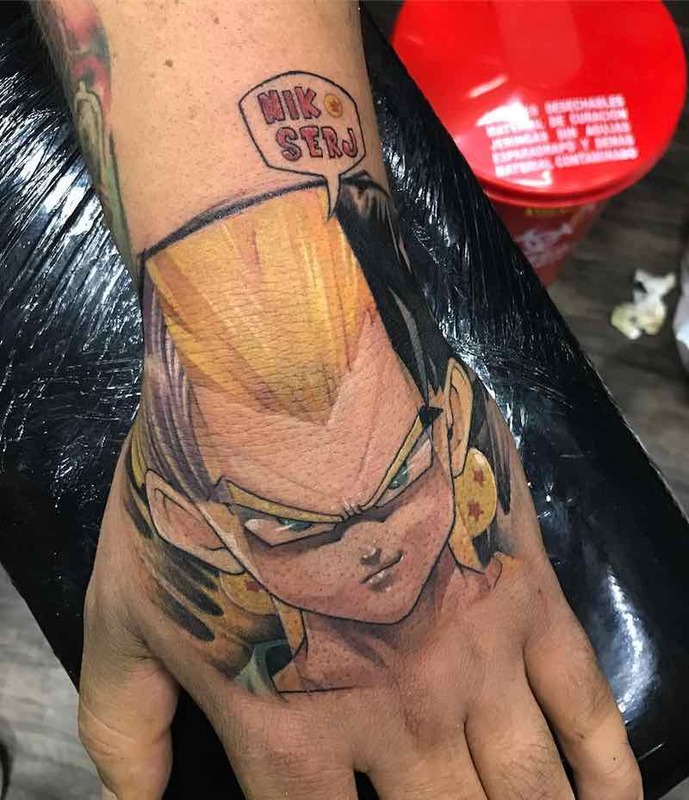 Click below to skip to character. 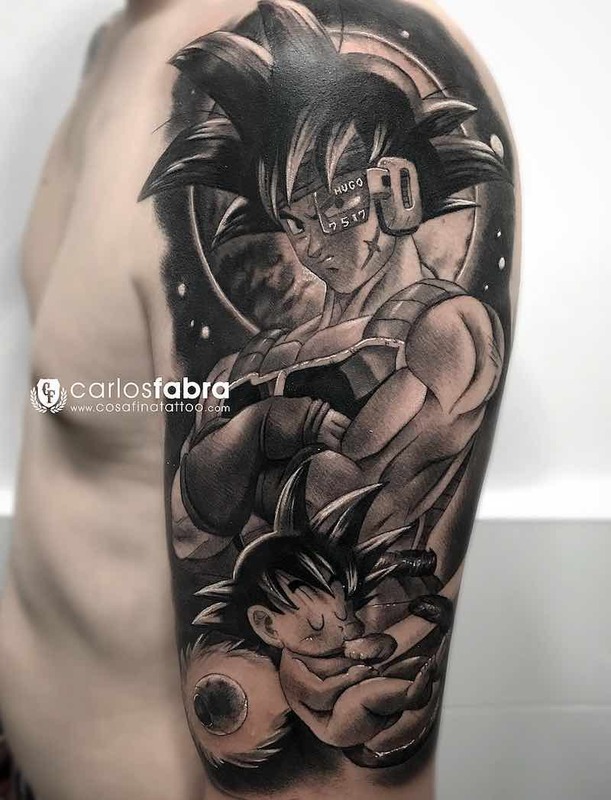 Goku, the main protagonist throughout all the dragon ball series, a Goku tattoo is the most popular Dragon Ball Z Tattoo to get done. 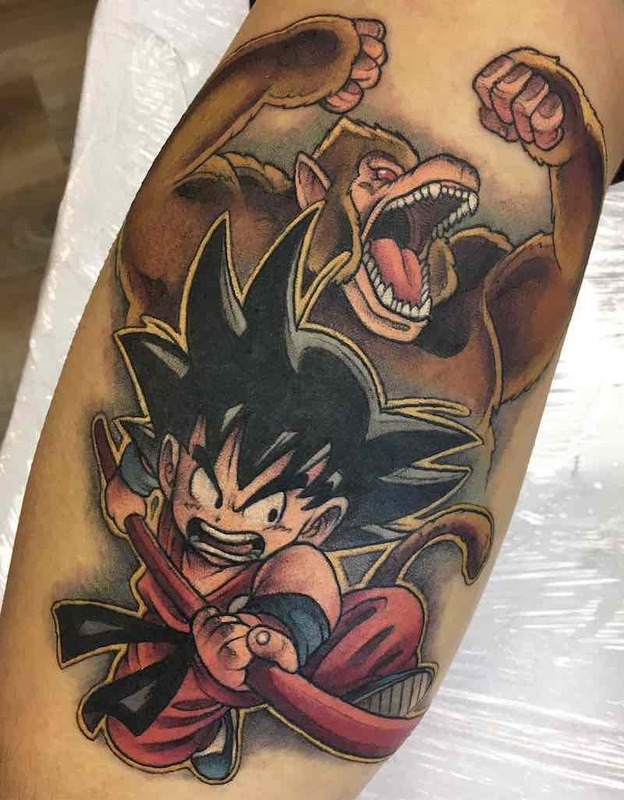 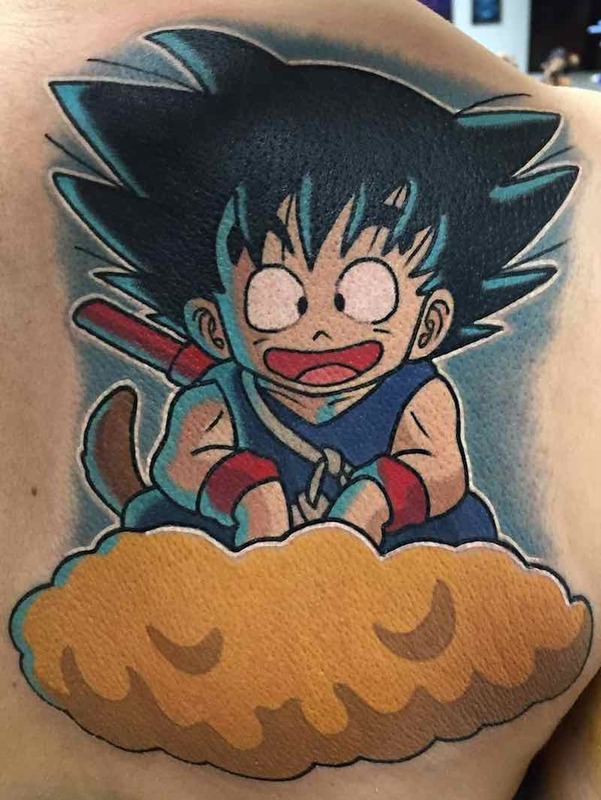 When getting a Goku tattoo there are so many options of what to get, between dragon ball to dragon ball super. 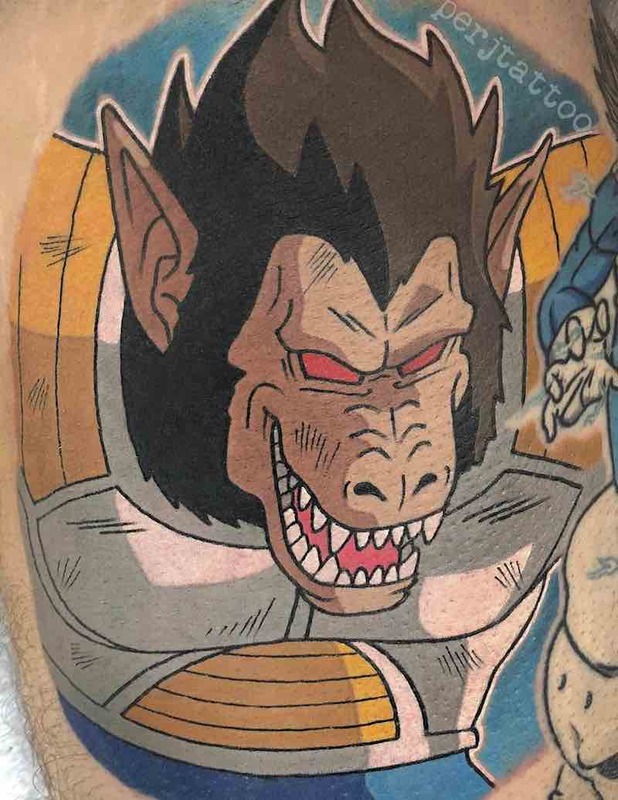 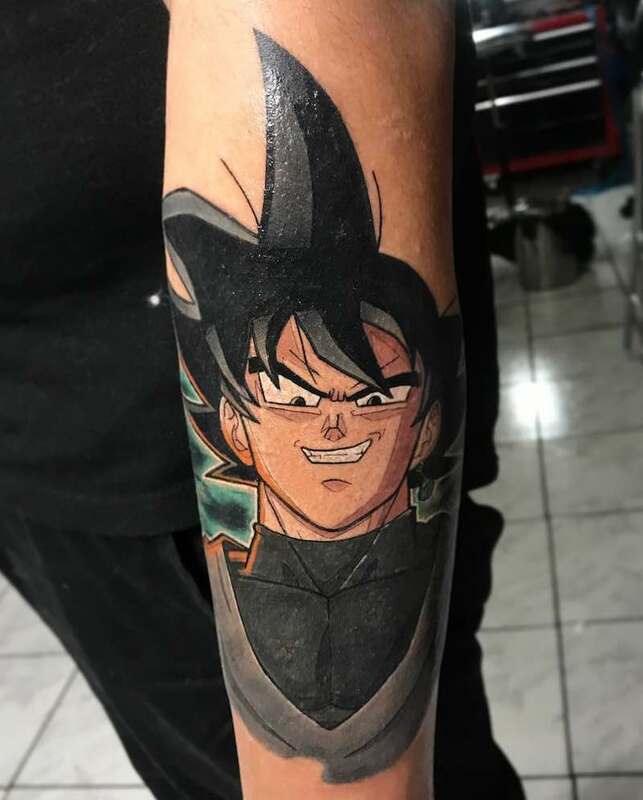 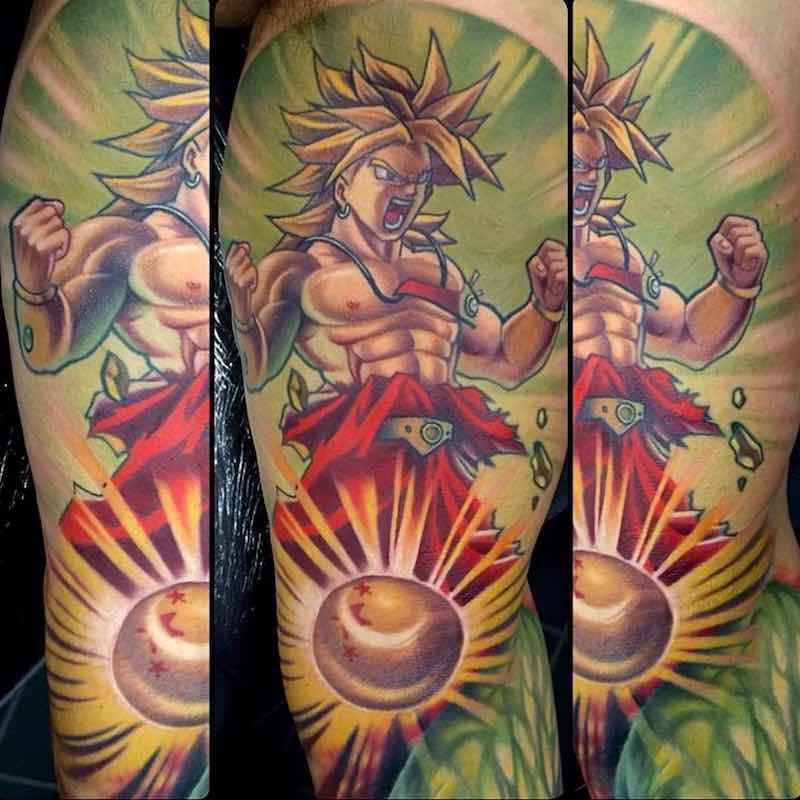 Goku has seen many forms and all make great tattoos. 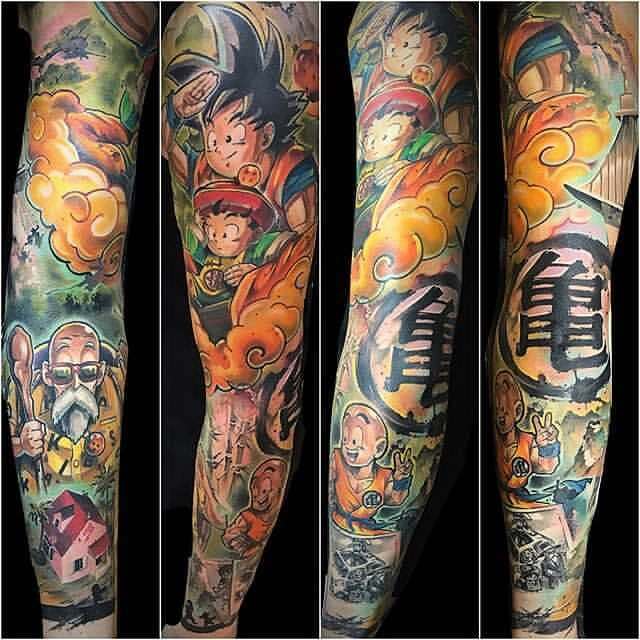 Gohan, the son of Goku has grown up throughout the series and can be seen tattooed from a boy to a man. 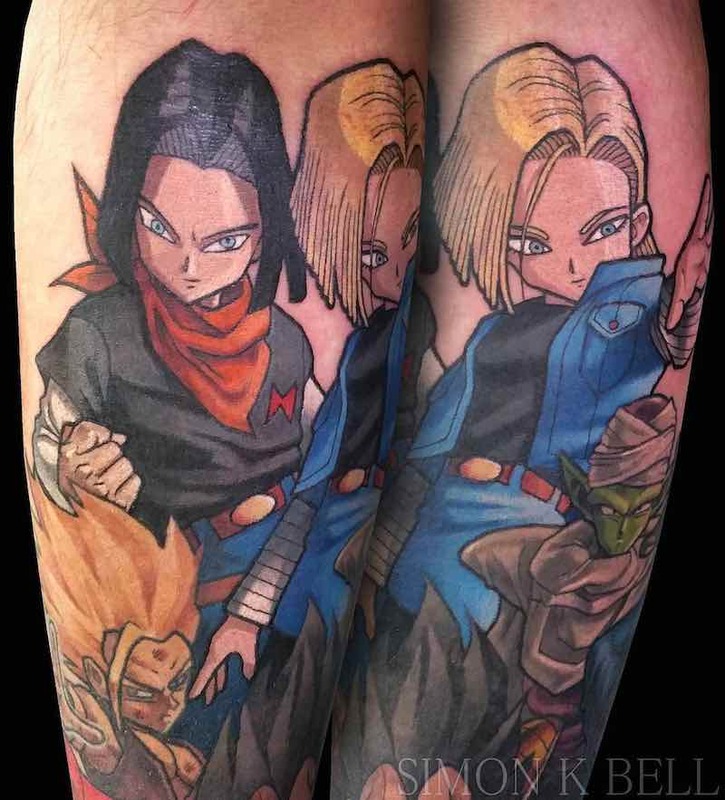 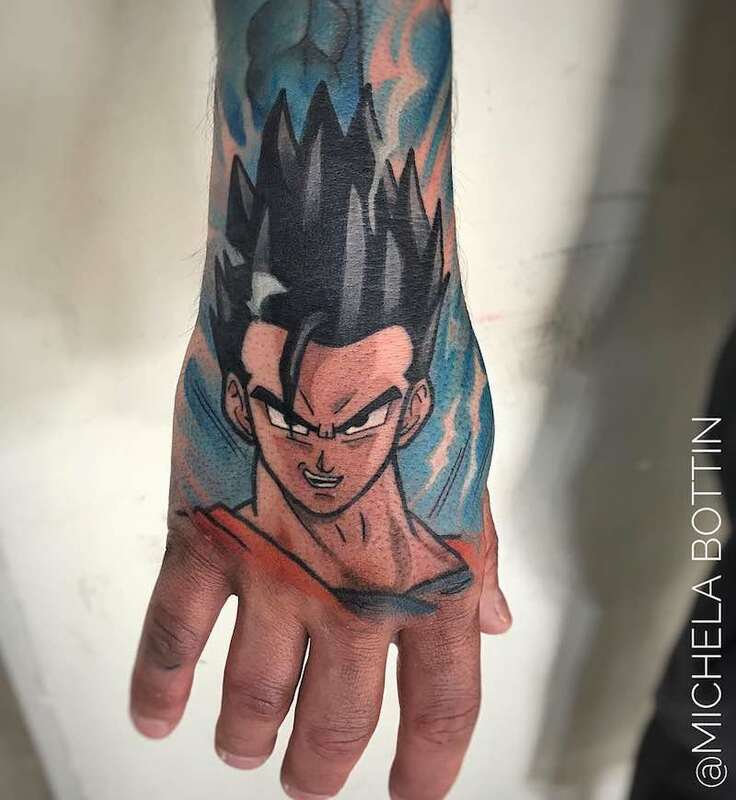 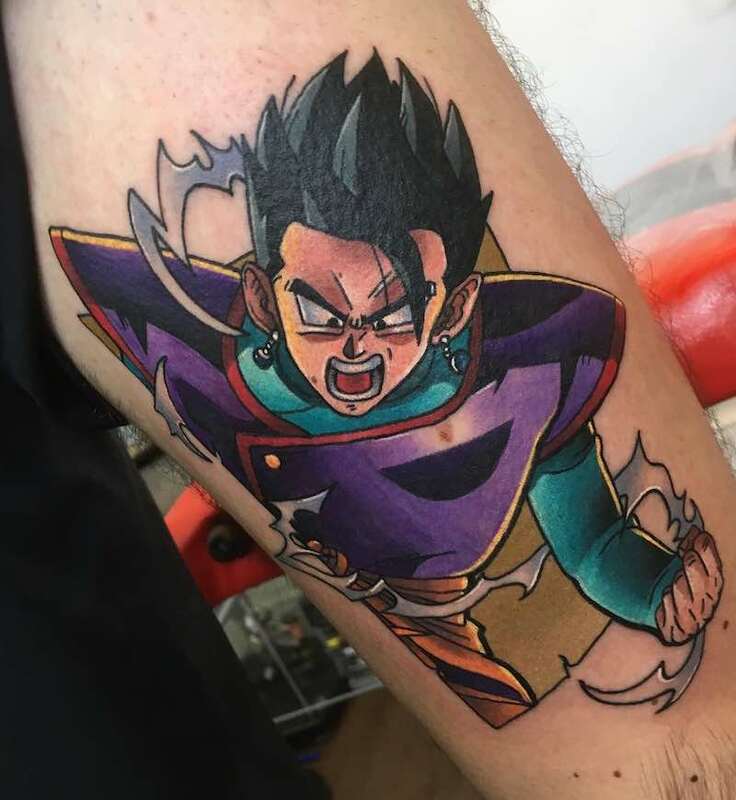 A Gohan tattoo is a popular Dragon Ball Z tattoo choice. 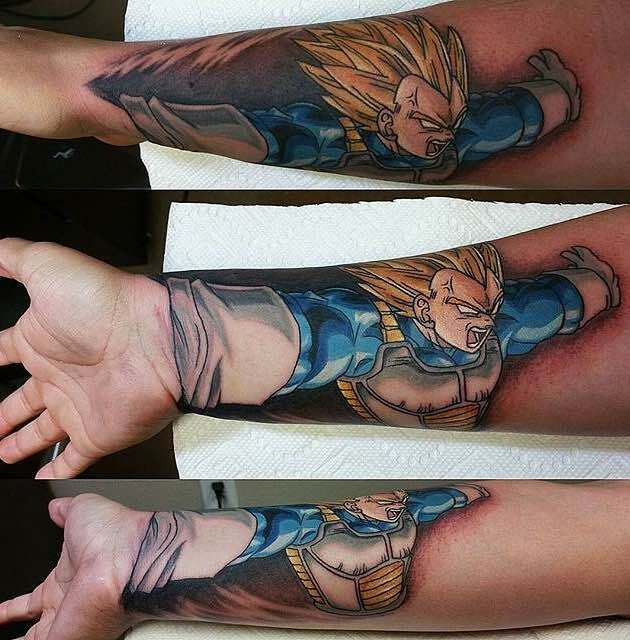 Vegeta started off as a villain then became a hero fighting alongside Goku. 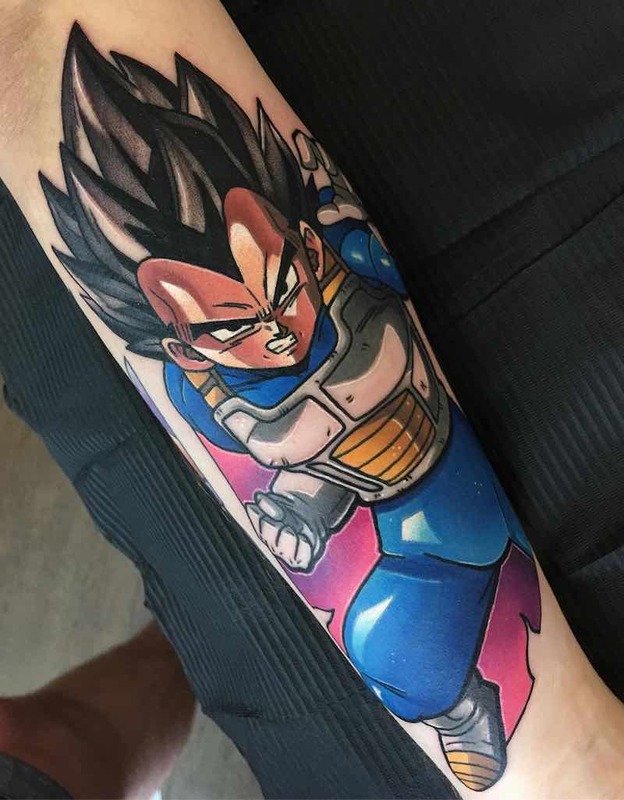 Vegeta Tattoos look great no matter what form he’s in, the most popular being Majin Vegeta. 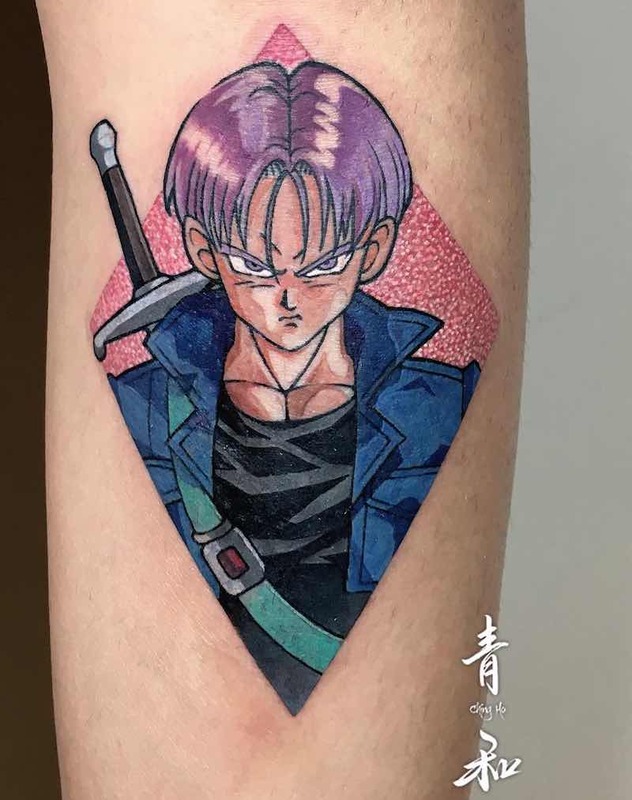 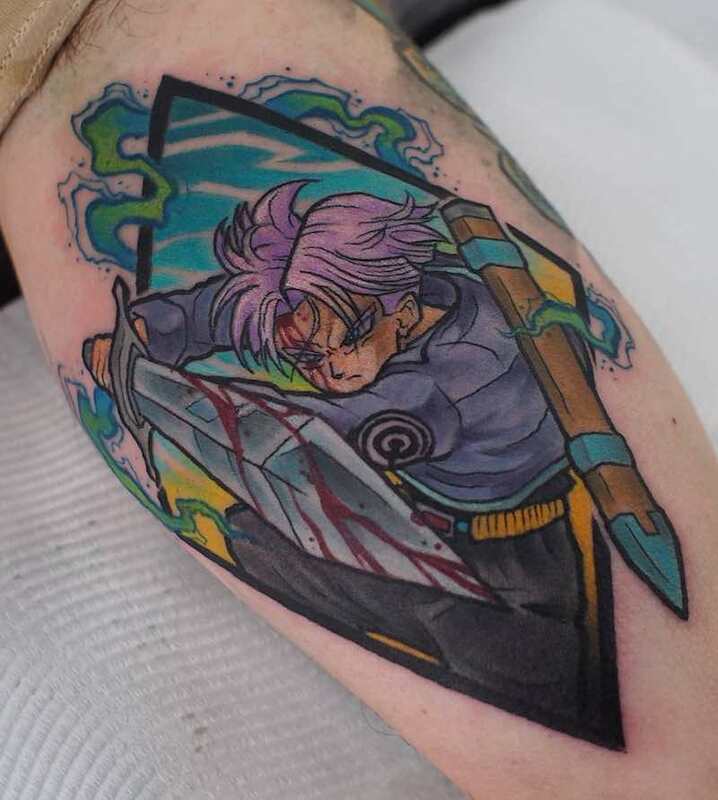 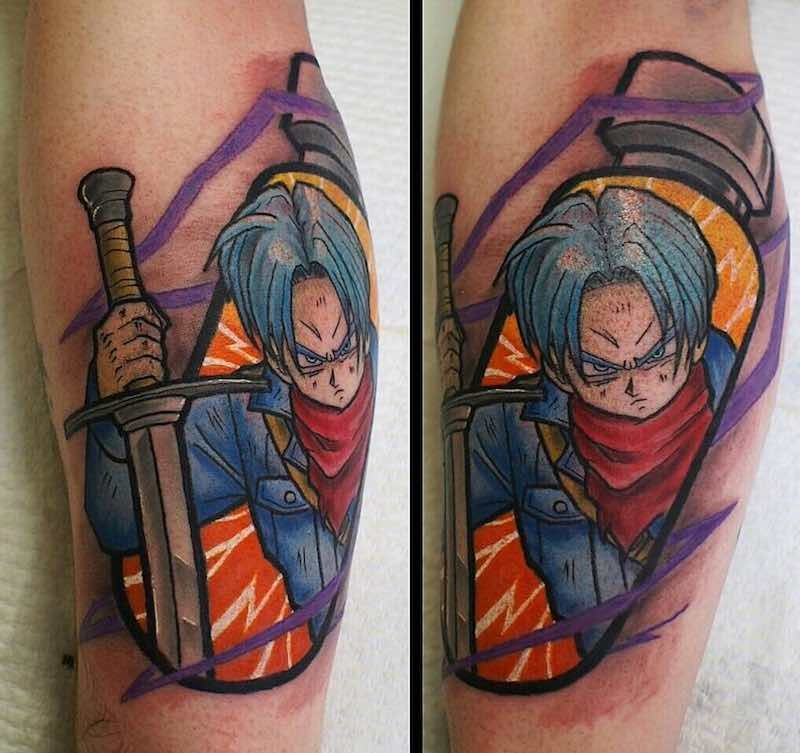 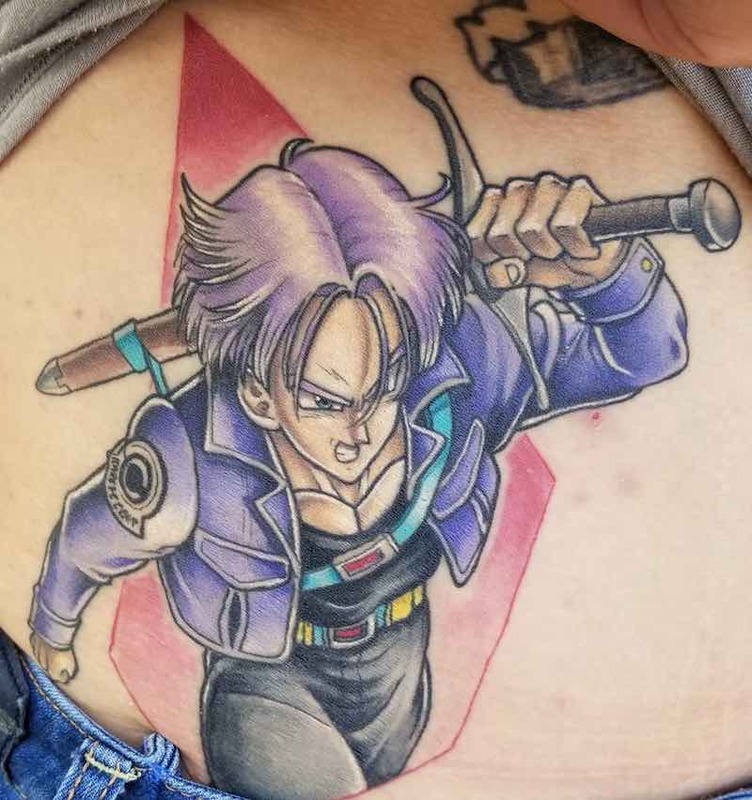 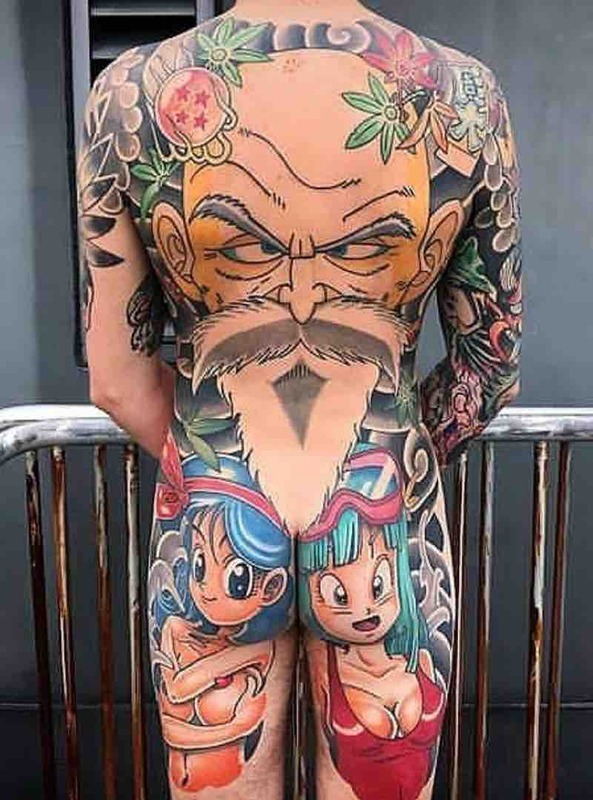 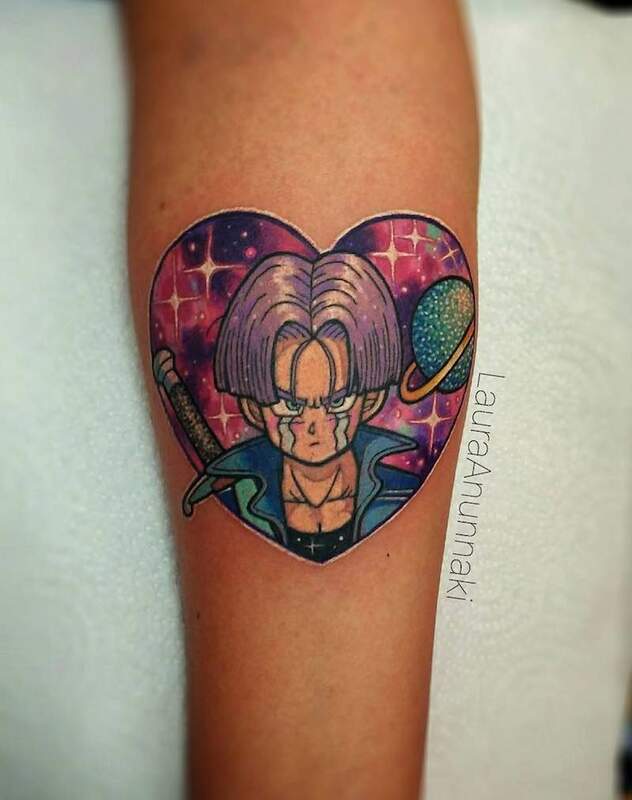 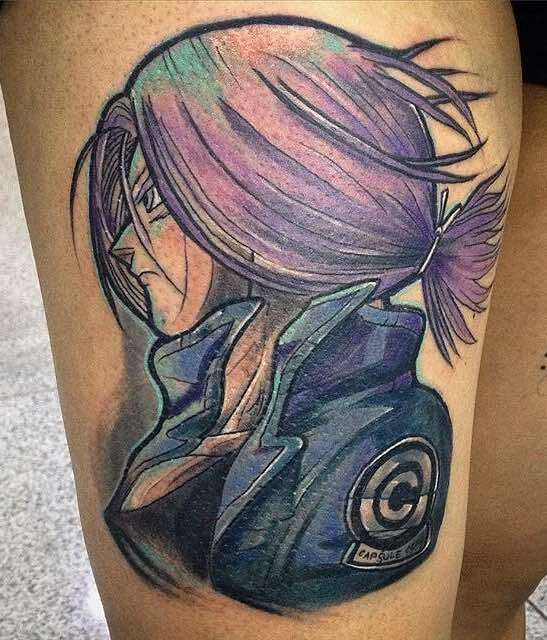 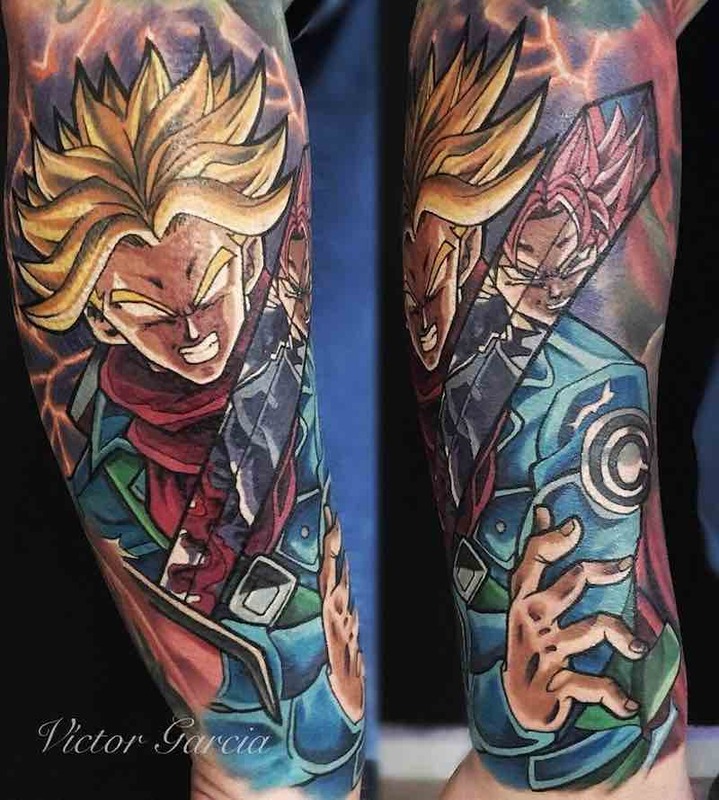 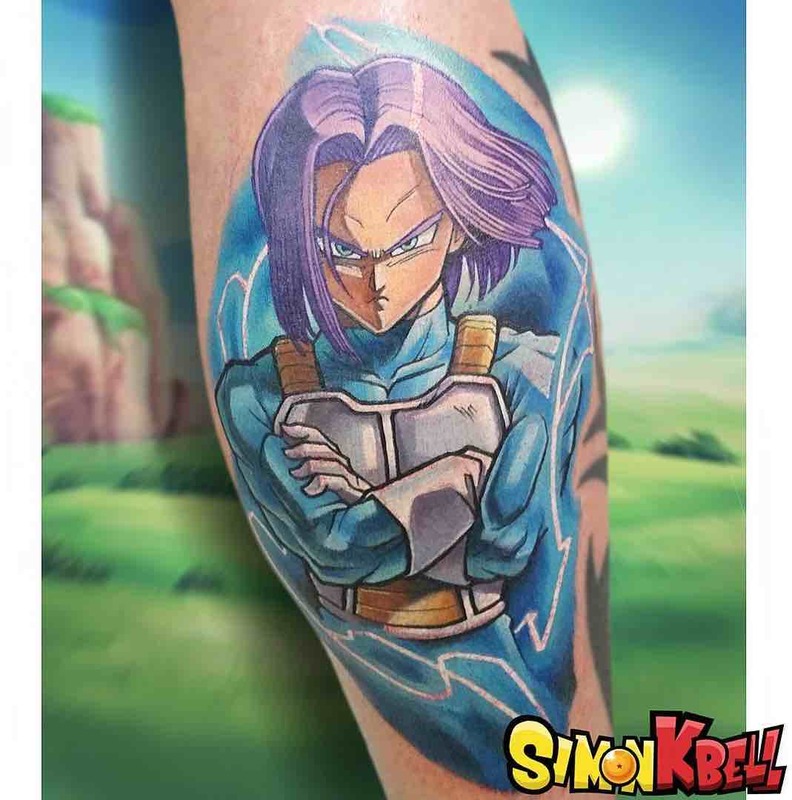 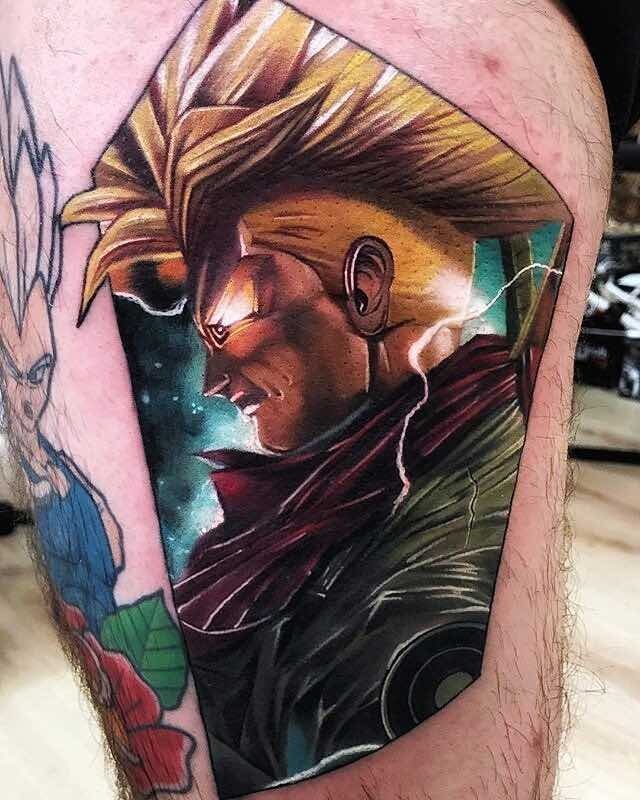 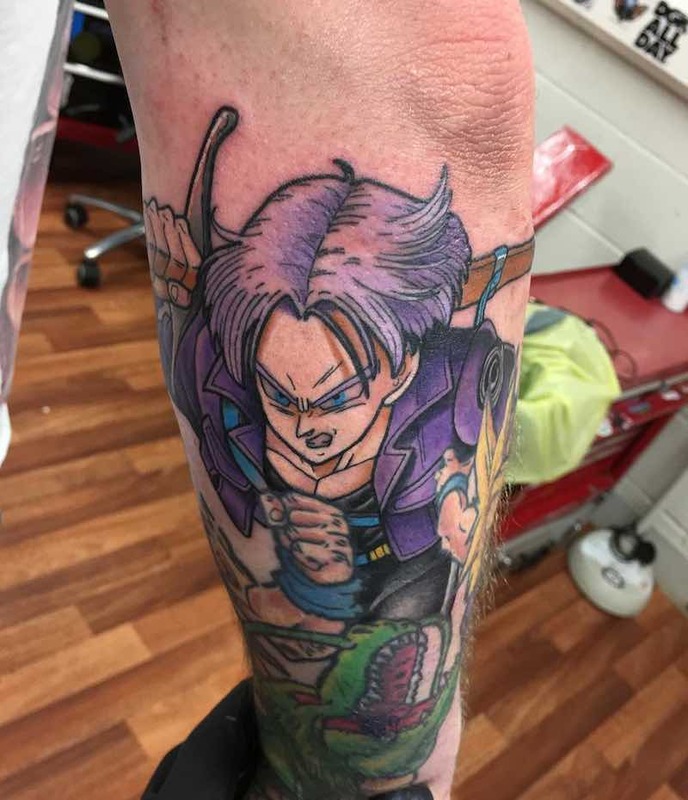 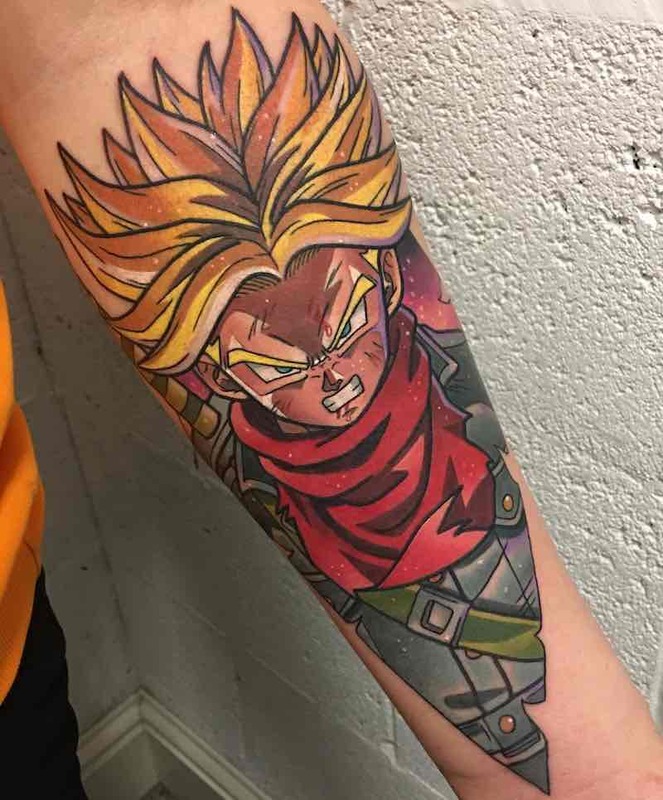 Trunks, son of Vegeta and Bulma, first introduced from the return of Frieza coming back from the future, there is no shortage of great trunks tattoos, here are some of the best. 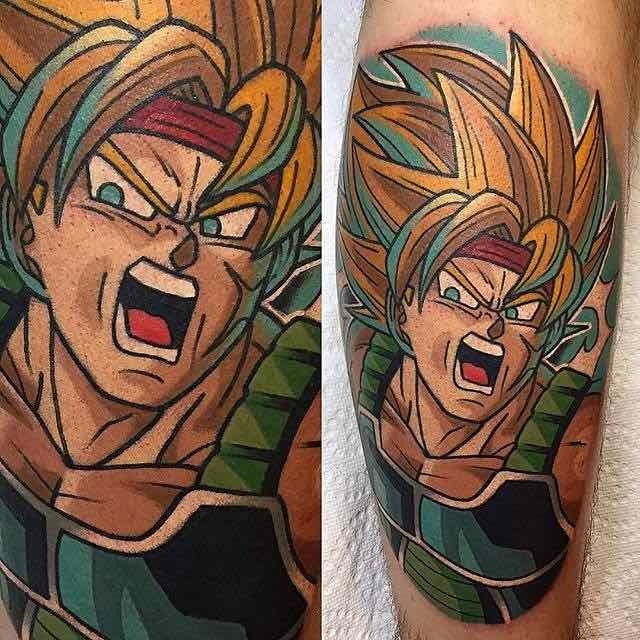 Featured in the dragon ball z tv movie special “Bardock- Father of Goku” Bardock is a great character and makes a good tattoo too. 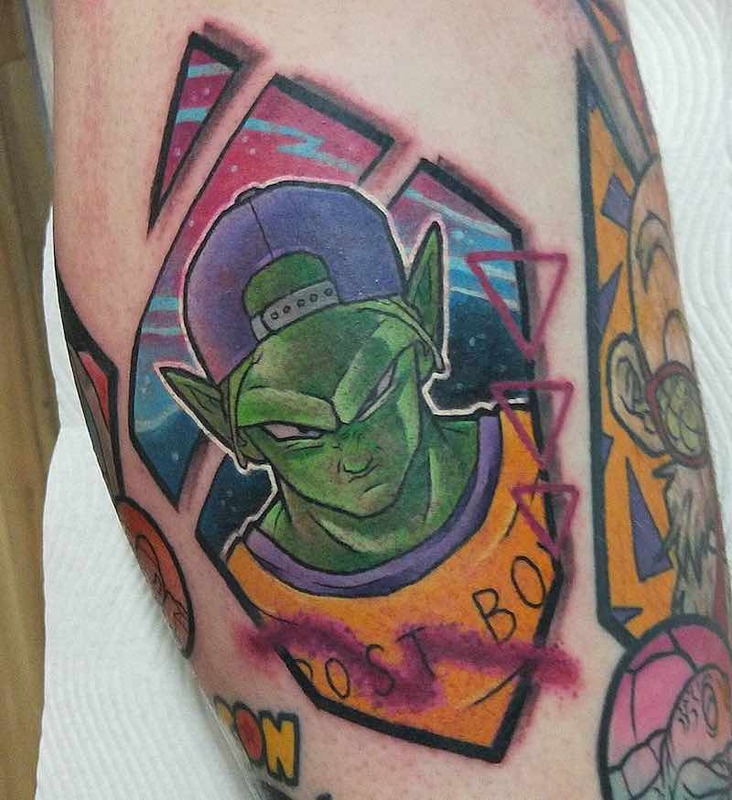 Piccolo once villain turned hero and z fighter, becoming a good friend to Gohan. 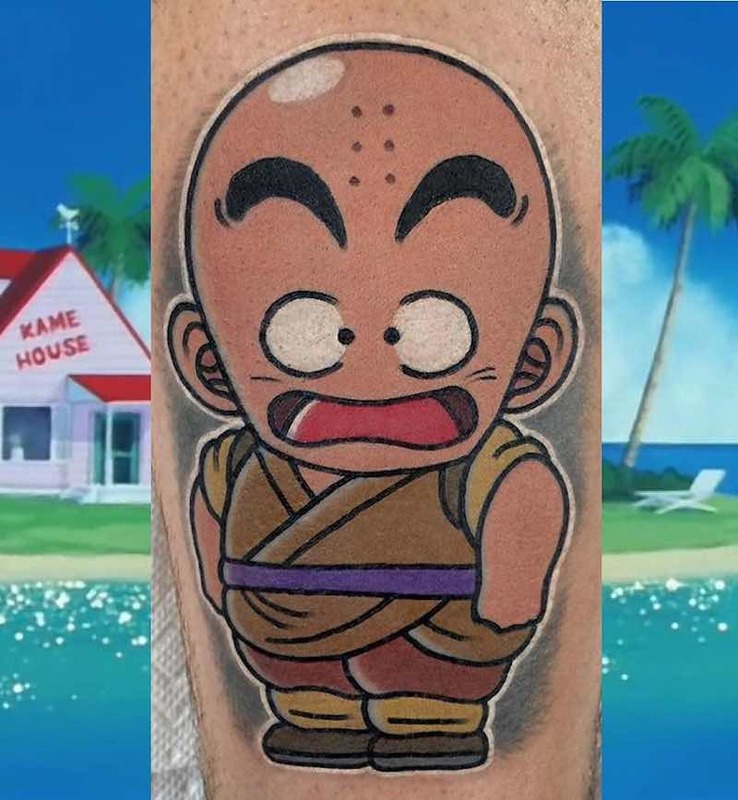 Krillin, one of the series long lasting heroes, in later series he becomes the husband of Android 18 and father to Marron. 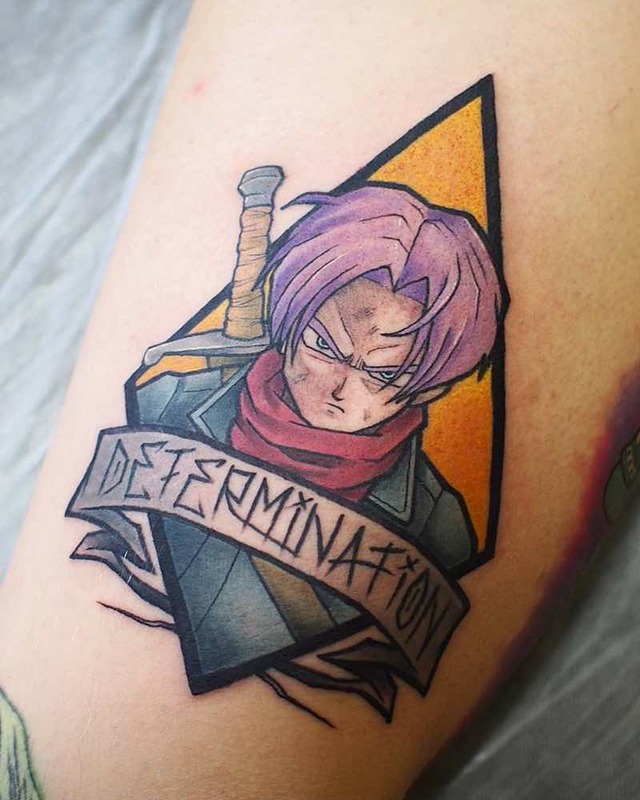 Gotenks is the combination of Trunks and Goten after doing the Fusion Dance. 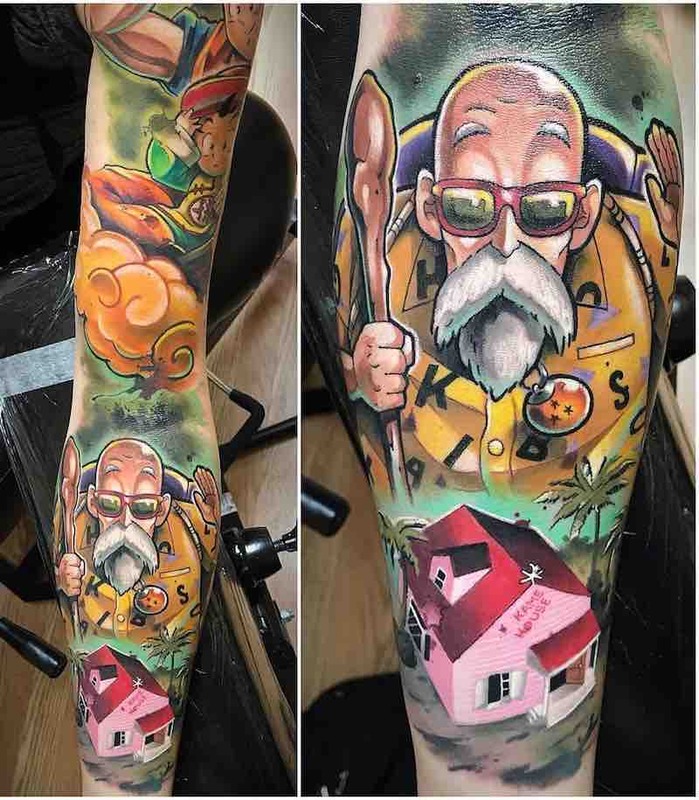 Master Roshi has trained many of the Z fighters being a martial arts master himself. 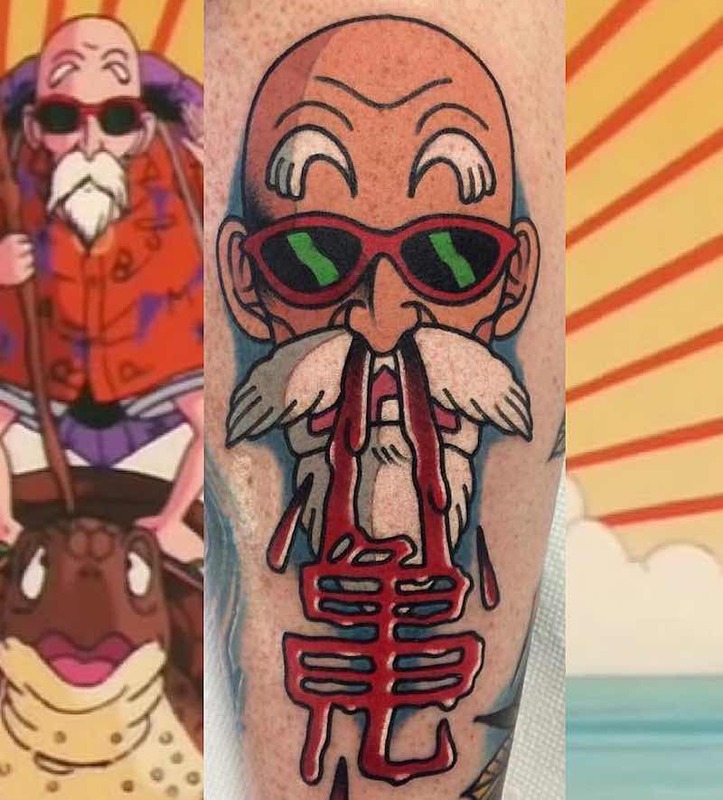 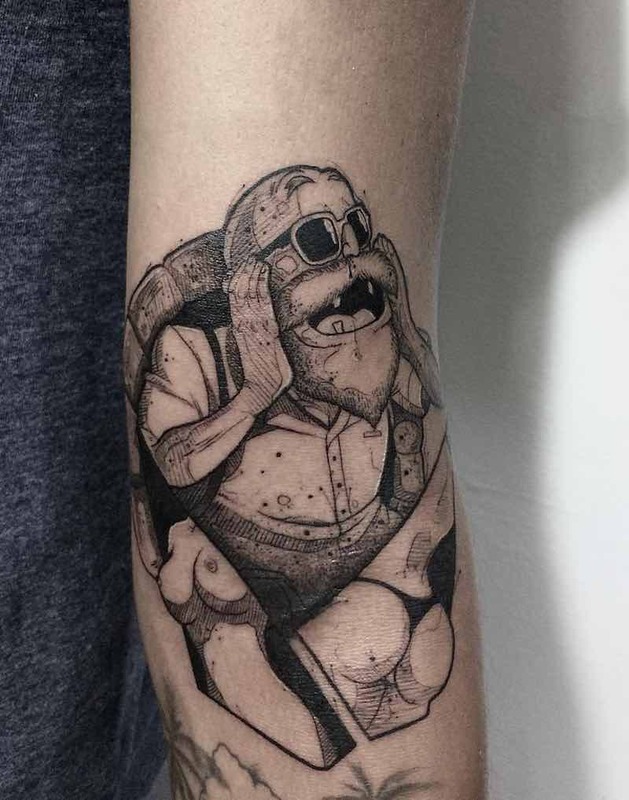 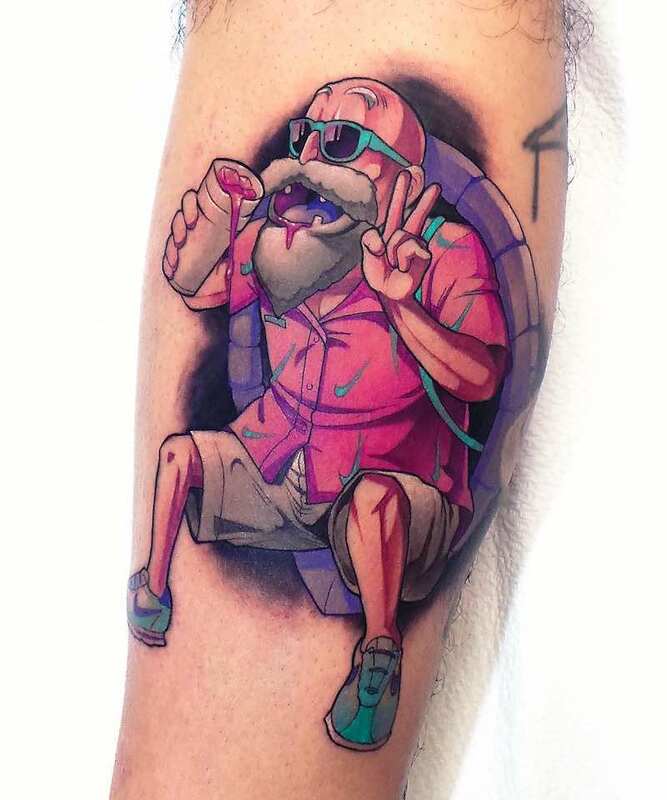 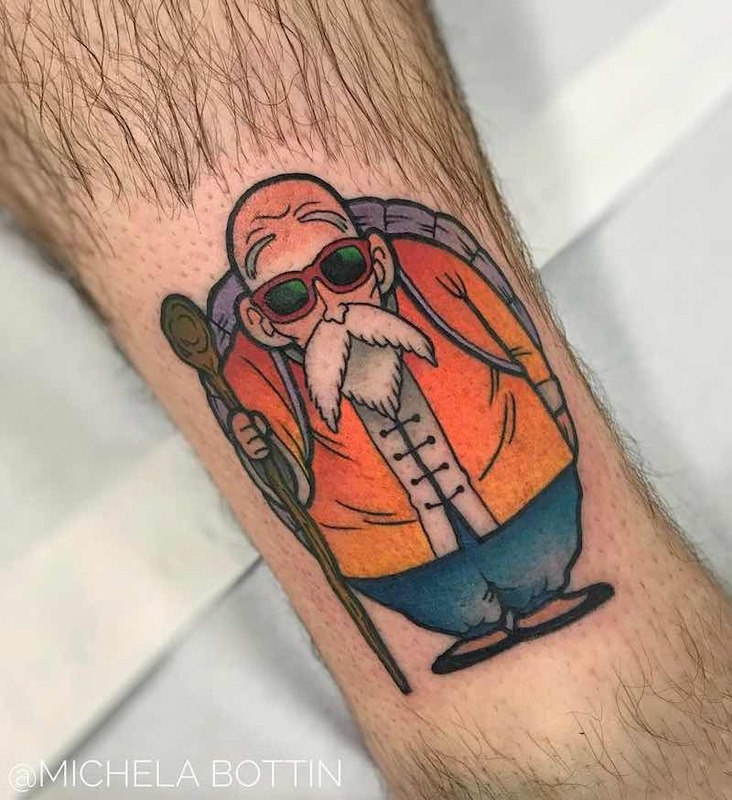 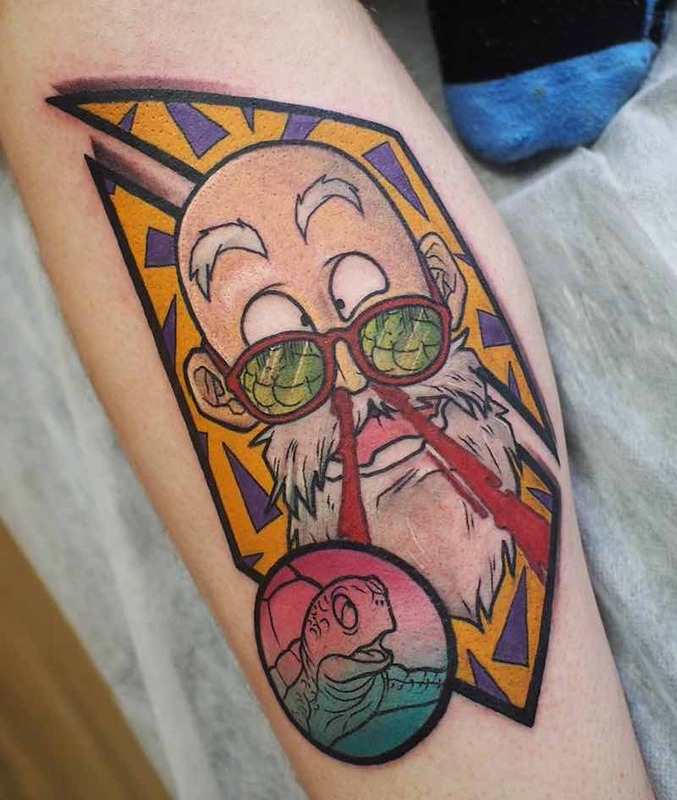 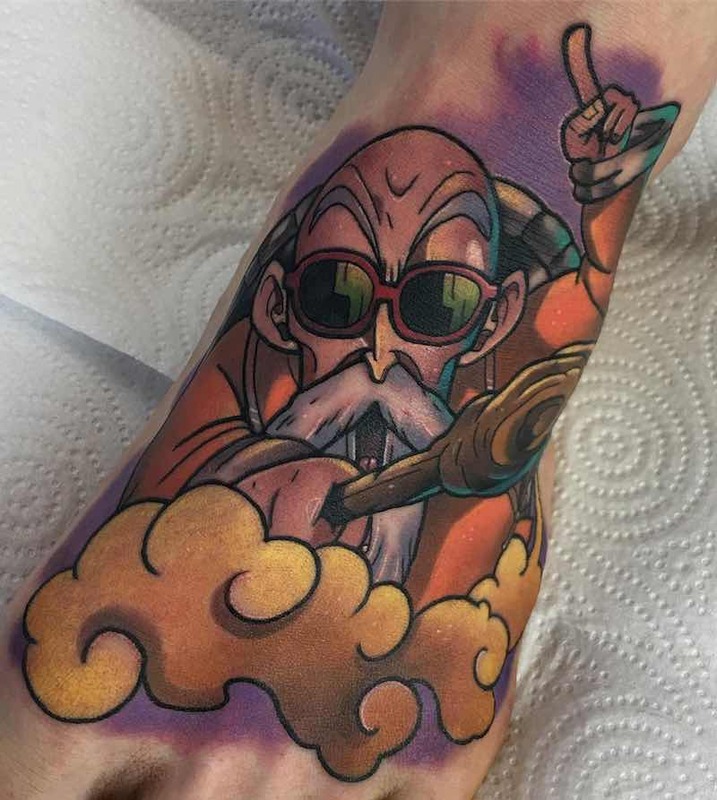 a Master Roshi Tattoo is quite popular and makes an excellent tattoo choice. 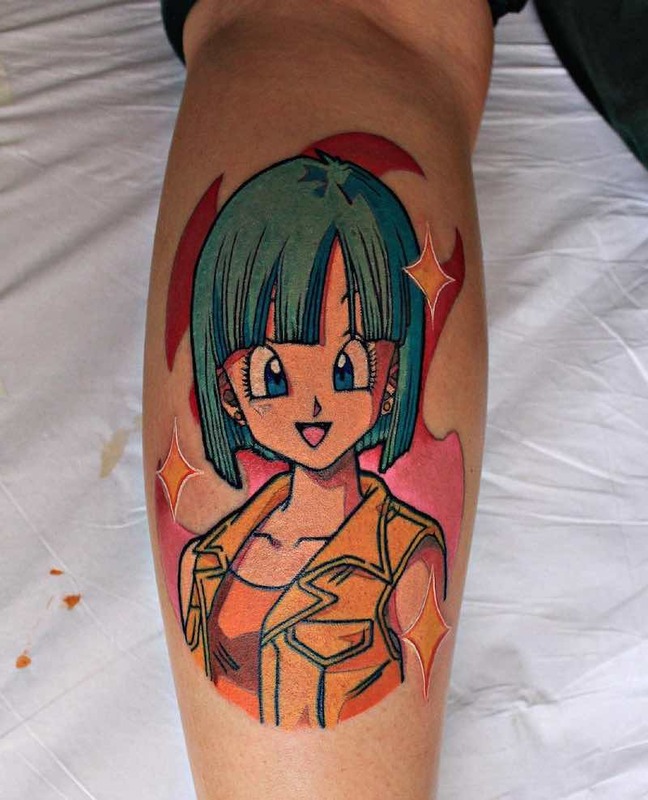 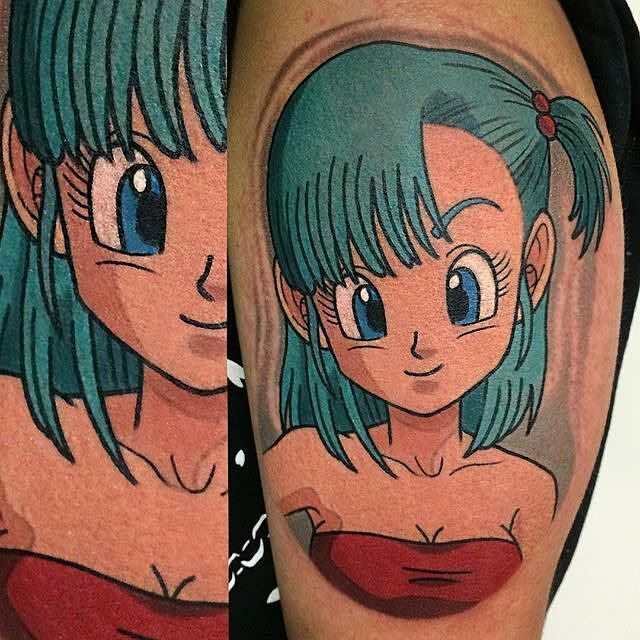 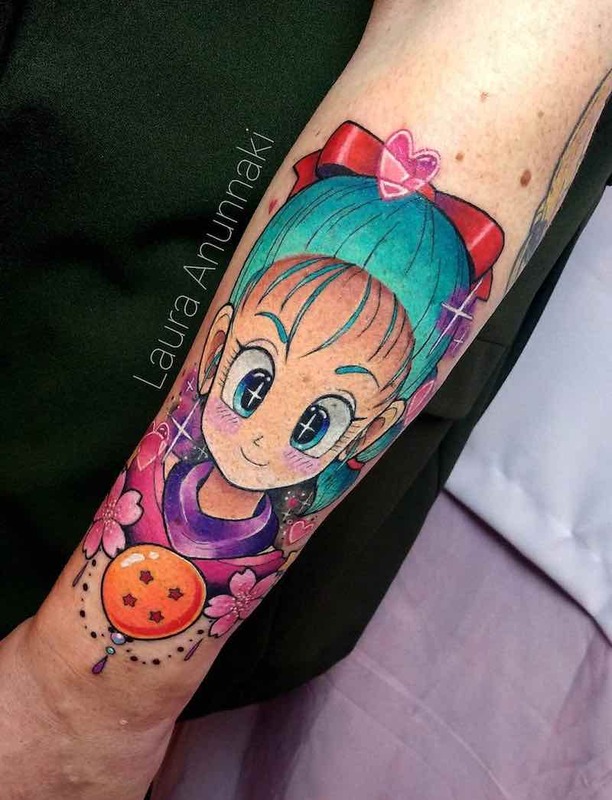 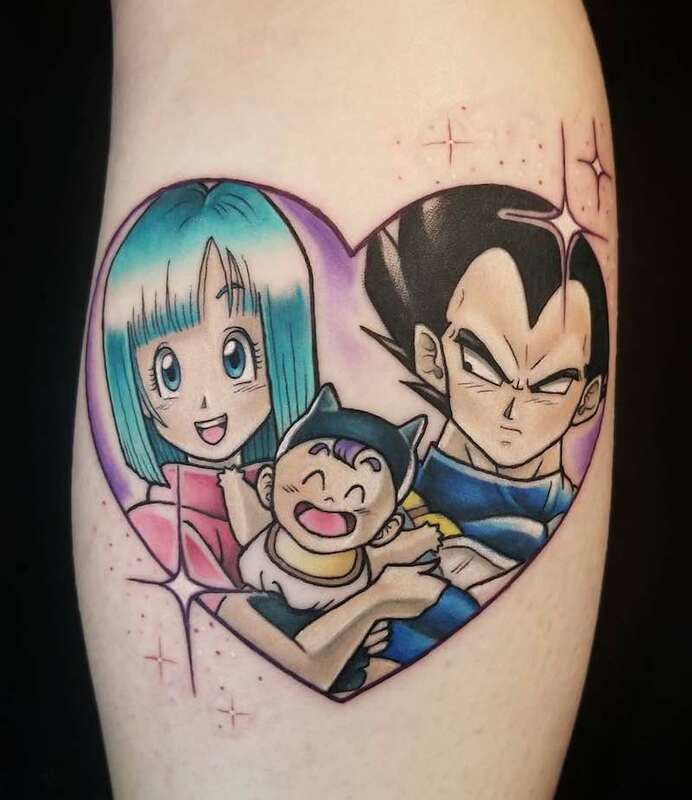 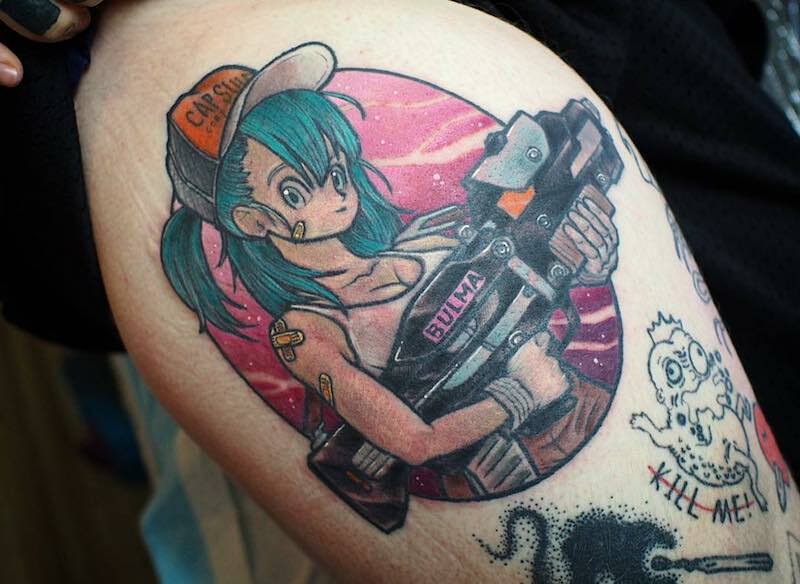 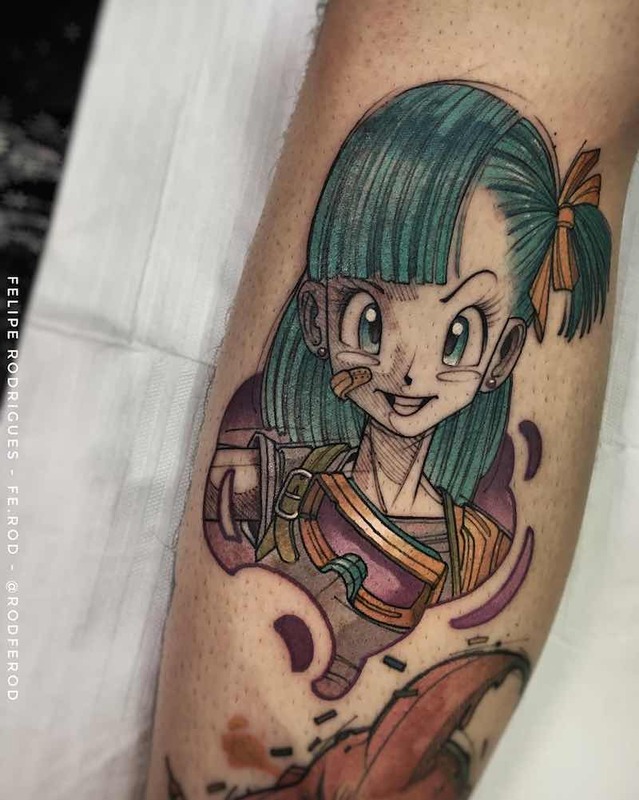 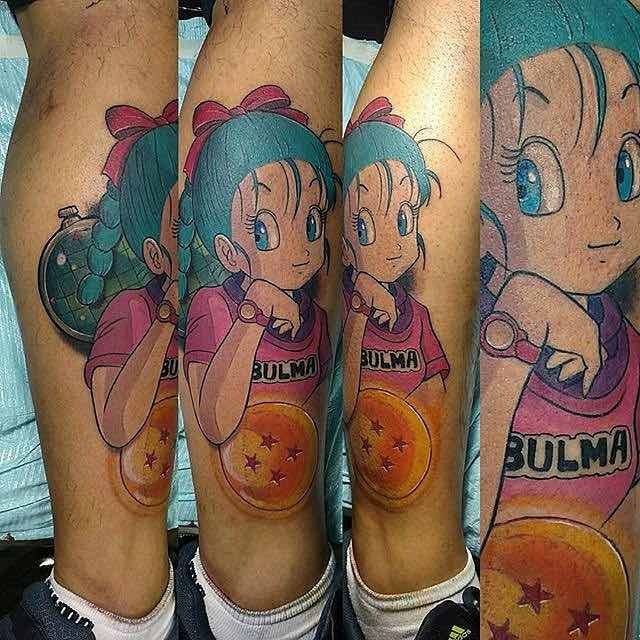 A Bulma Tattoo is the most popular Dragon Ball Z Tattoo to get for girls but is also very popular among men. 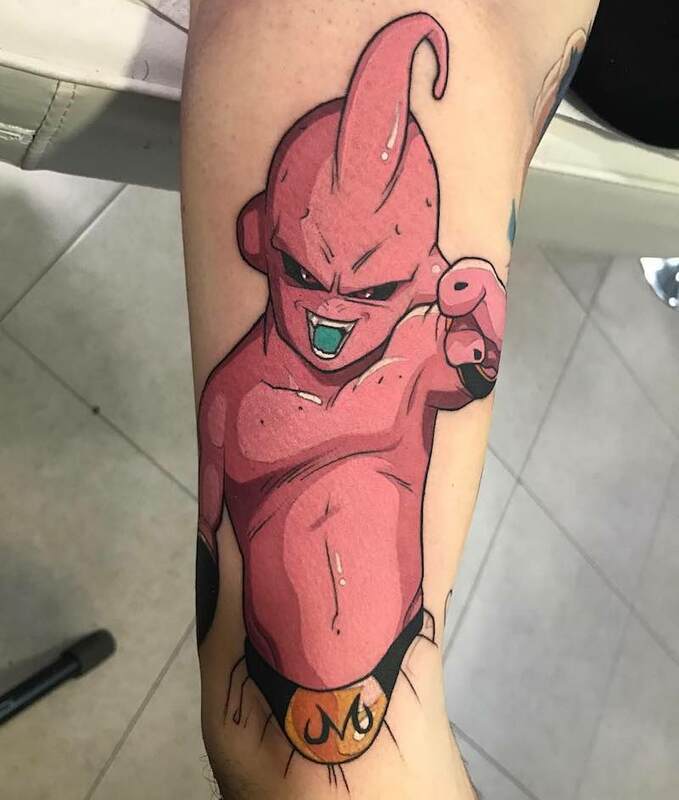 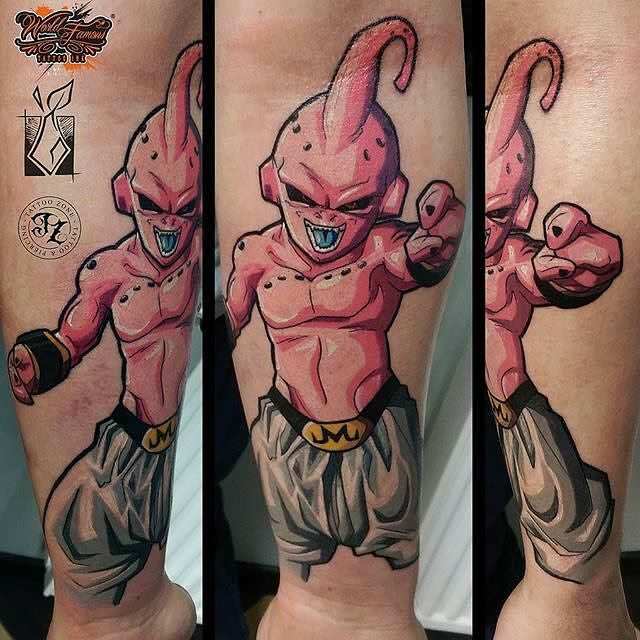 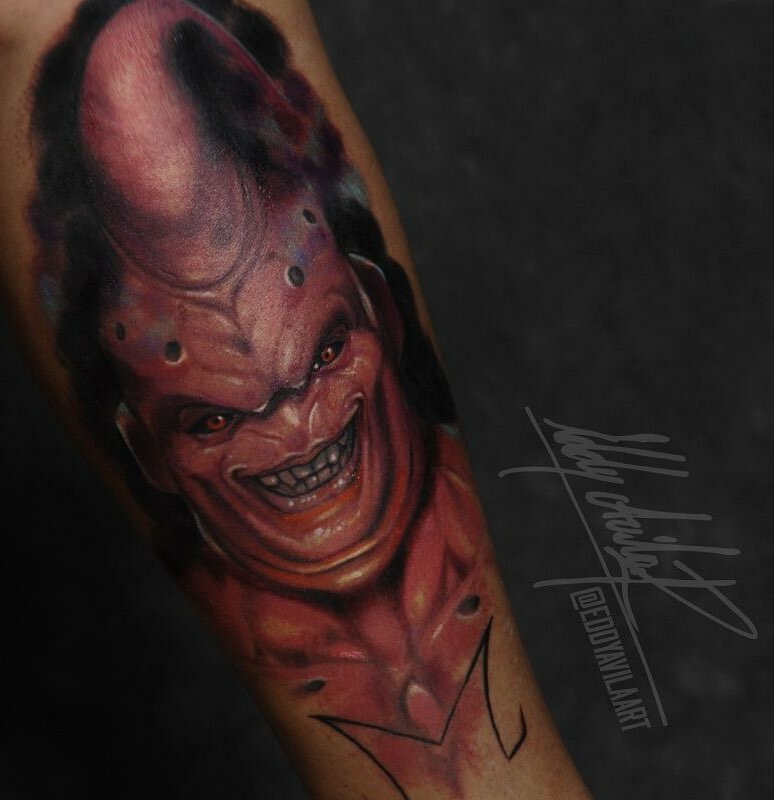 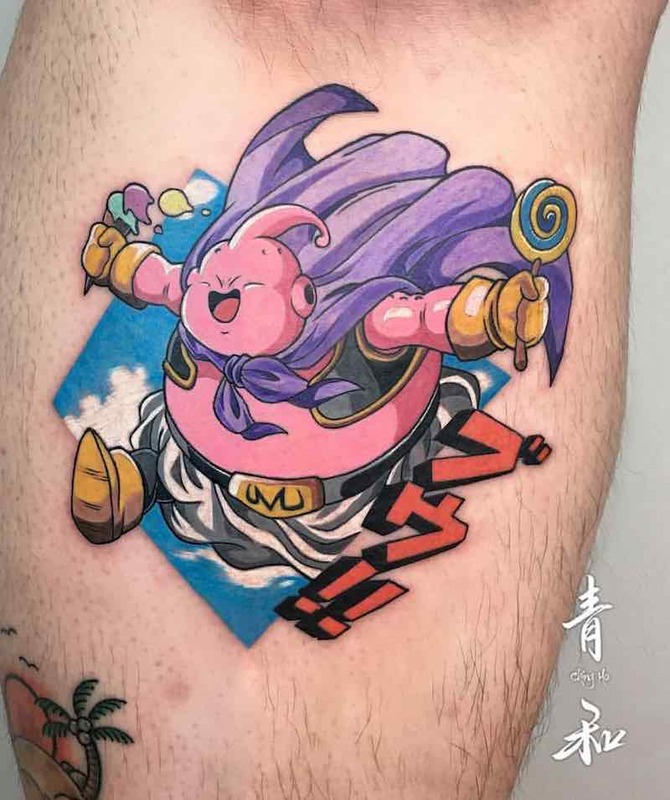 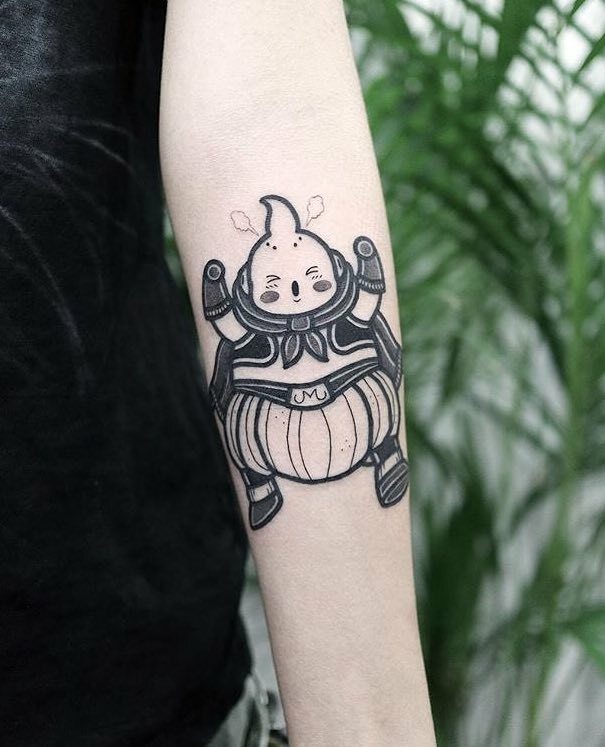 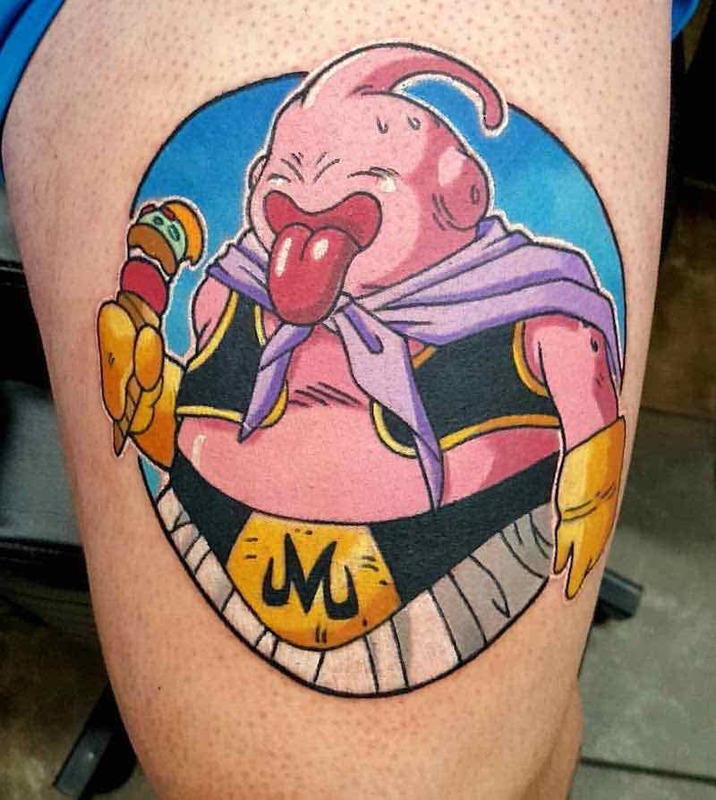 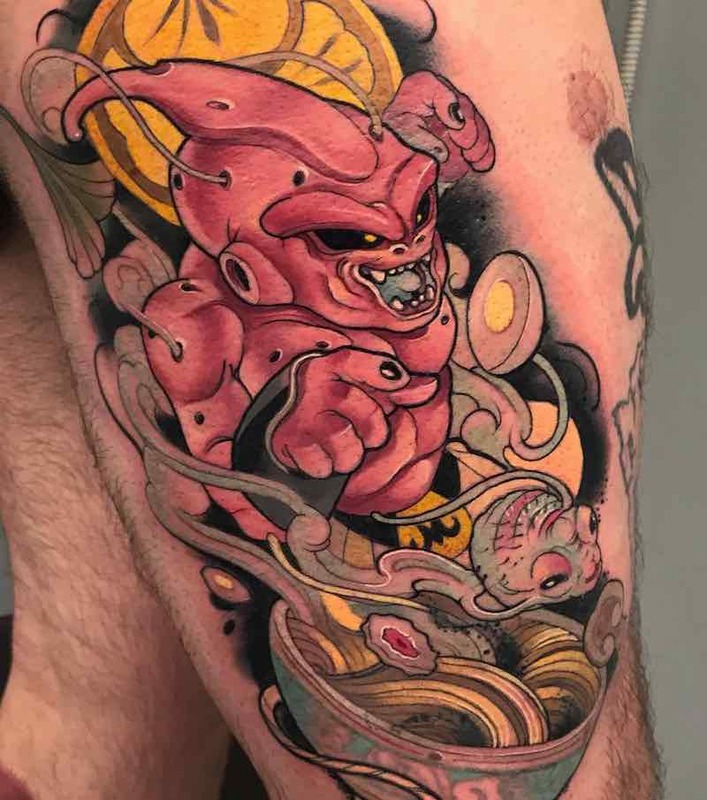 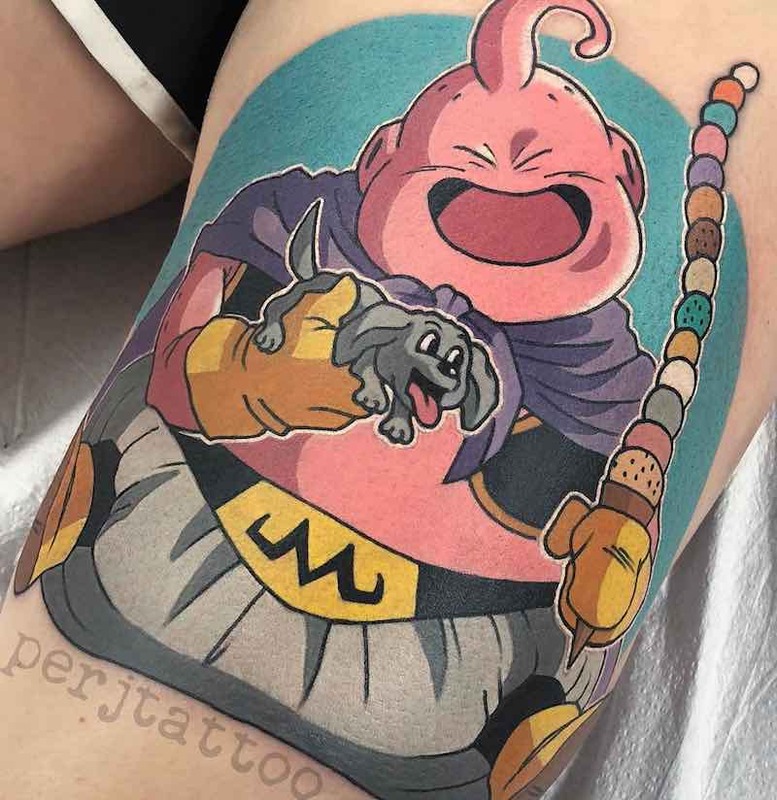 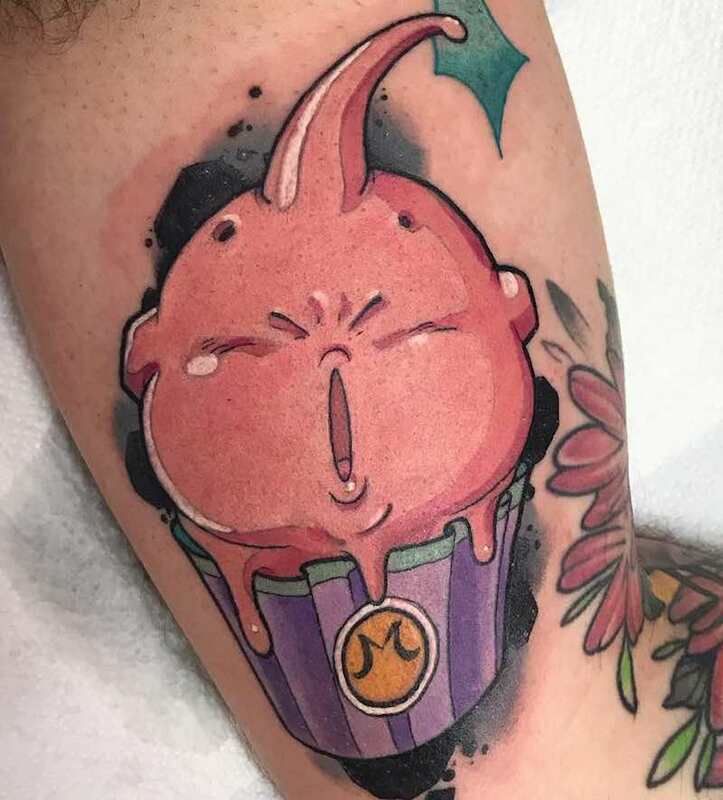 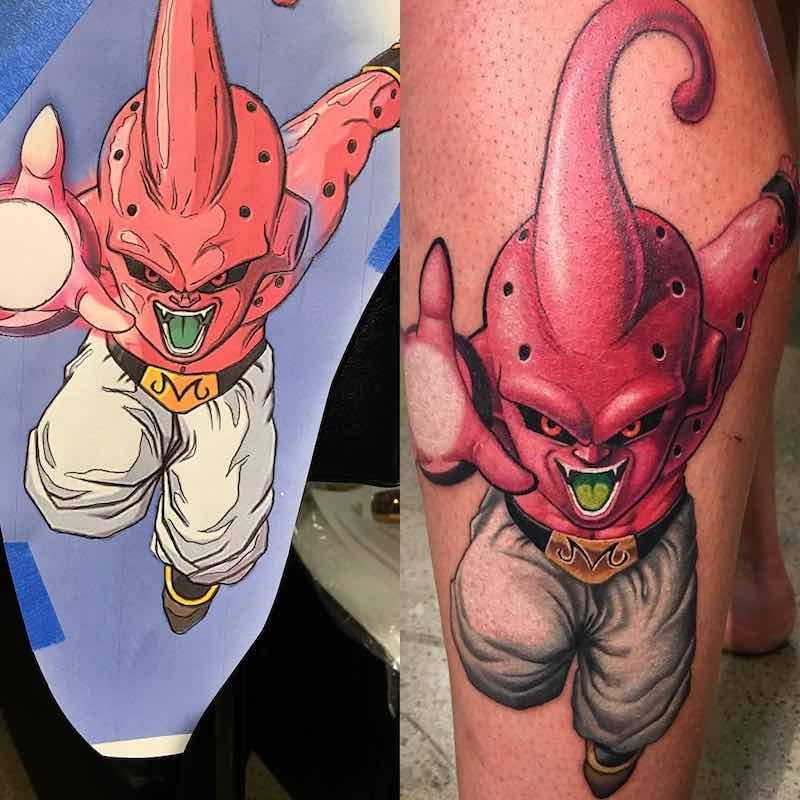 There are many different ways to design a Majin Buu tattoo with his many different forms and playful appearance that translates well to tattoos. 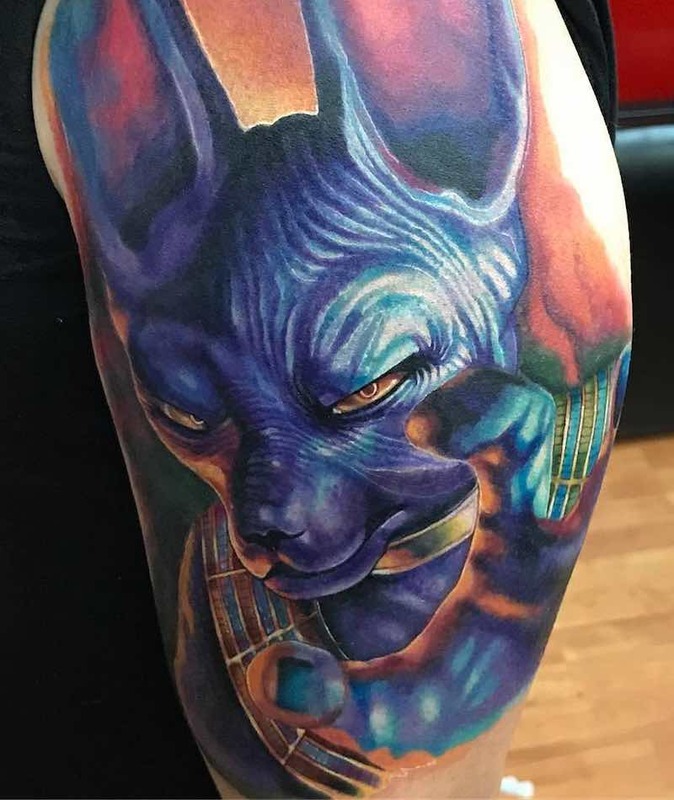 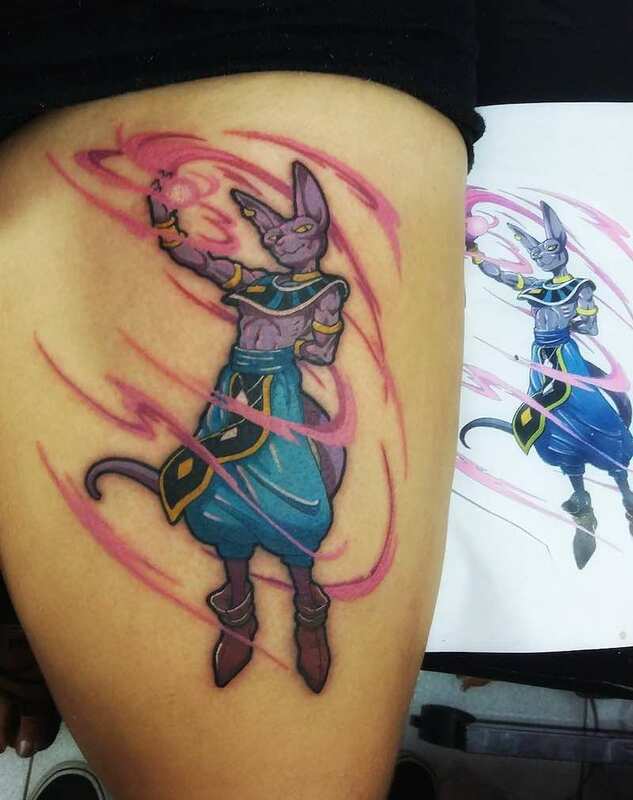 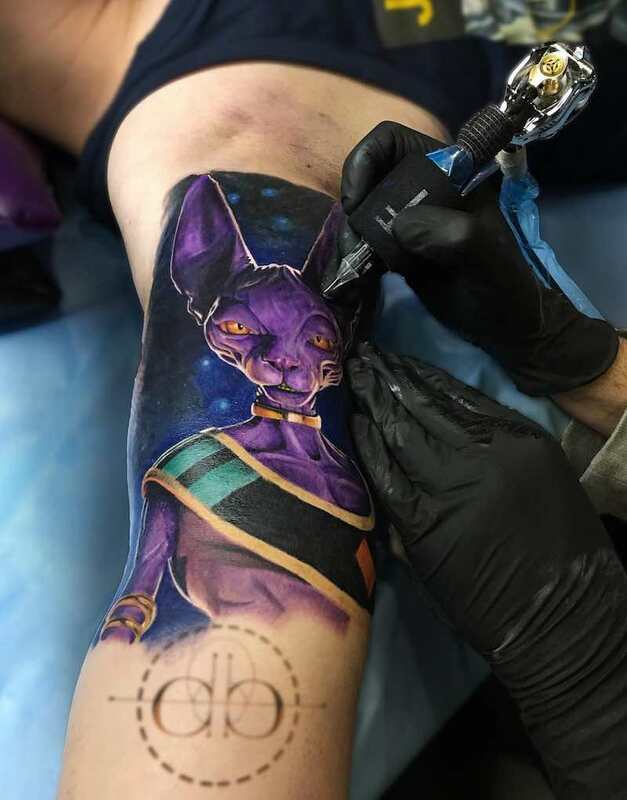 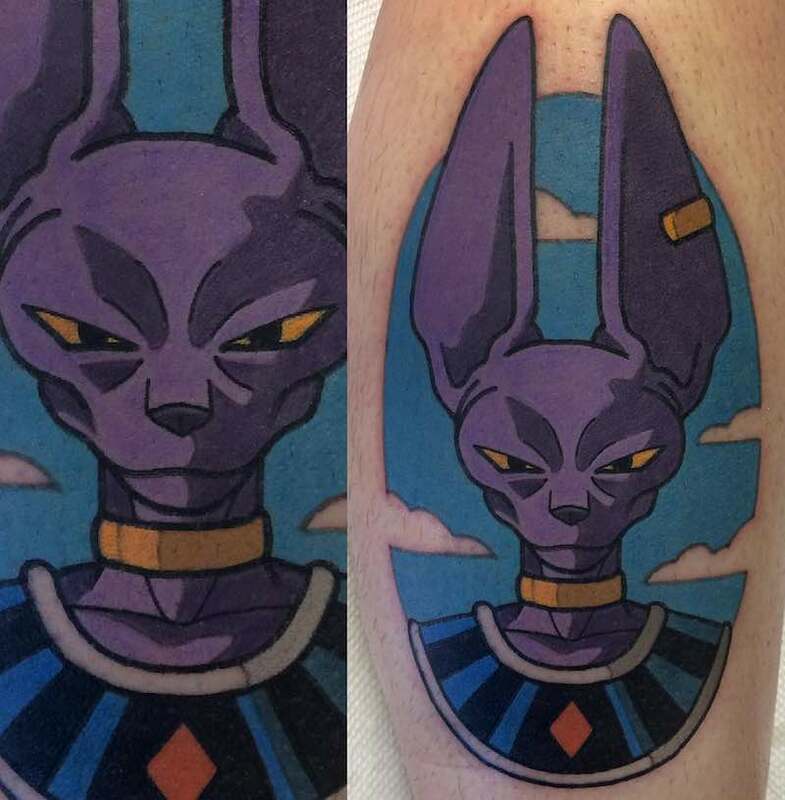 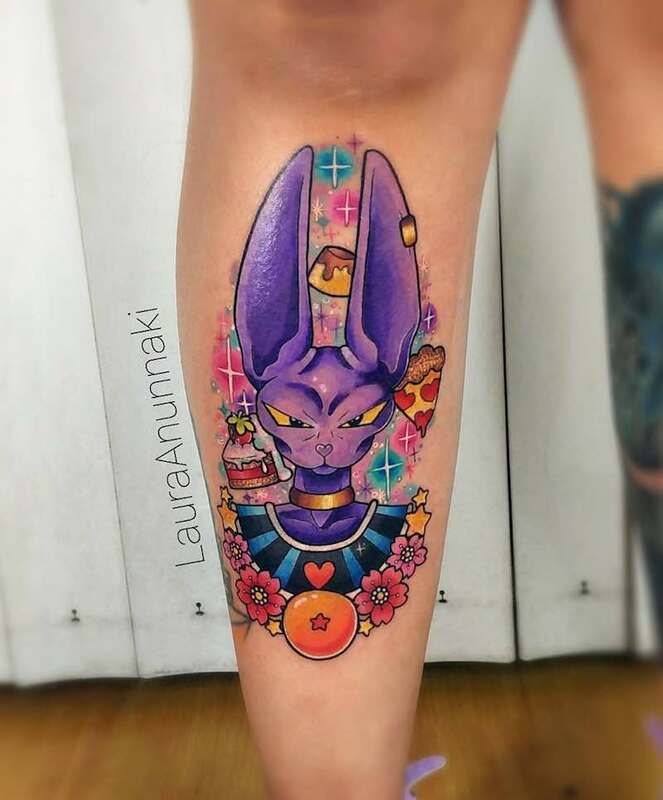 Although not from Dragon Ball Z there are some great Beerus tattoos from dragon ball super. 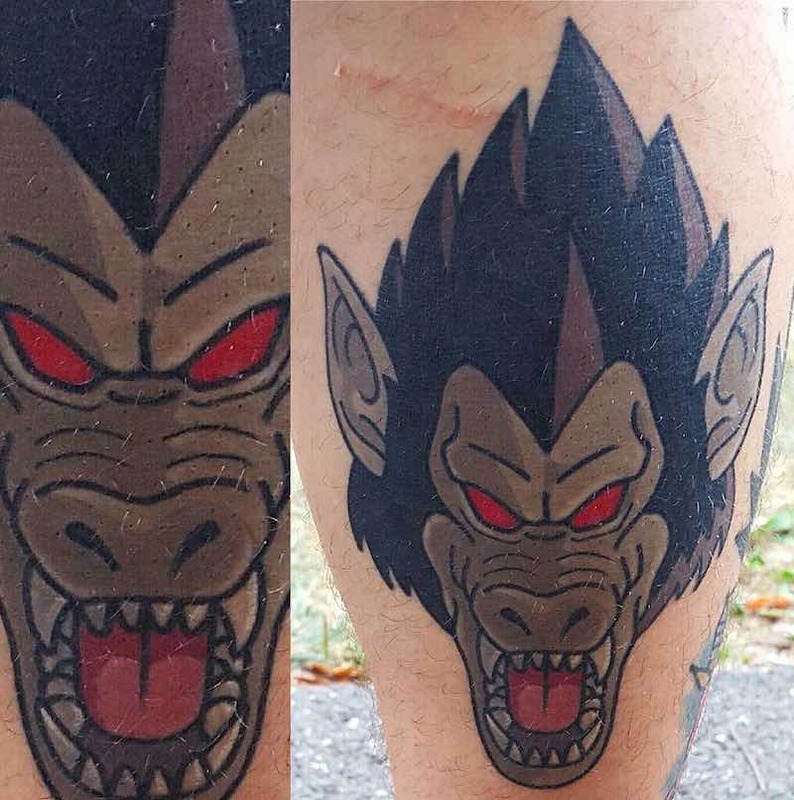 The Great Ape is the result a Saiyan transforming from a human form to giant ape. 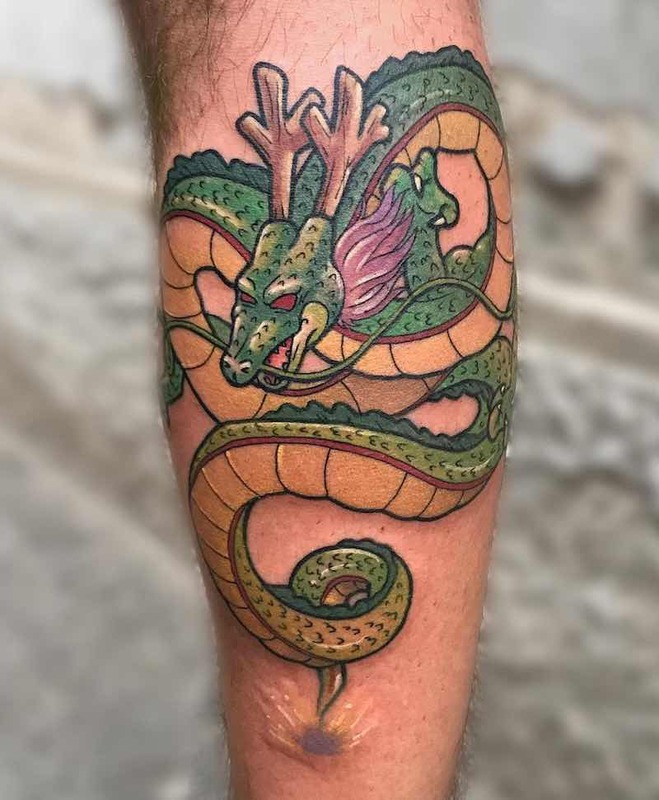 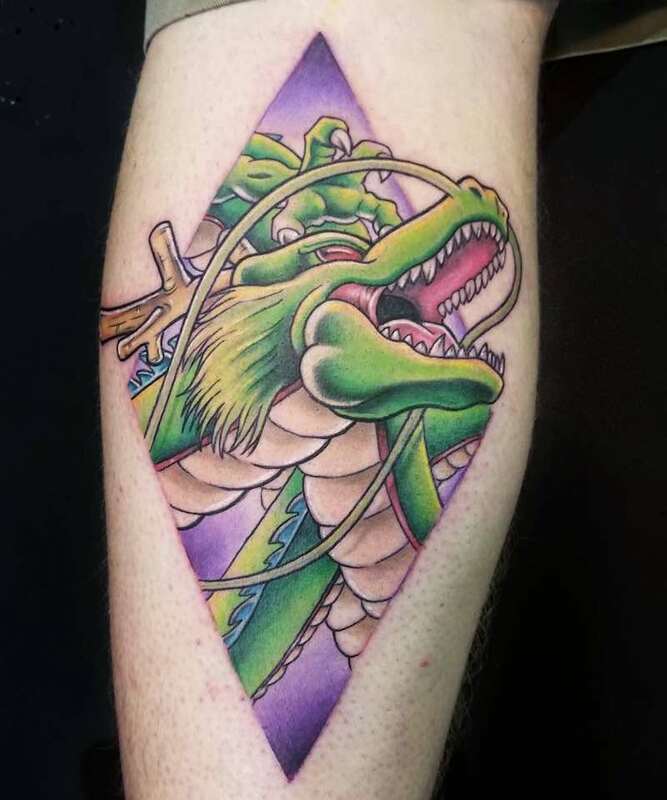 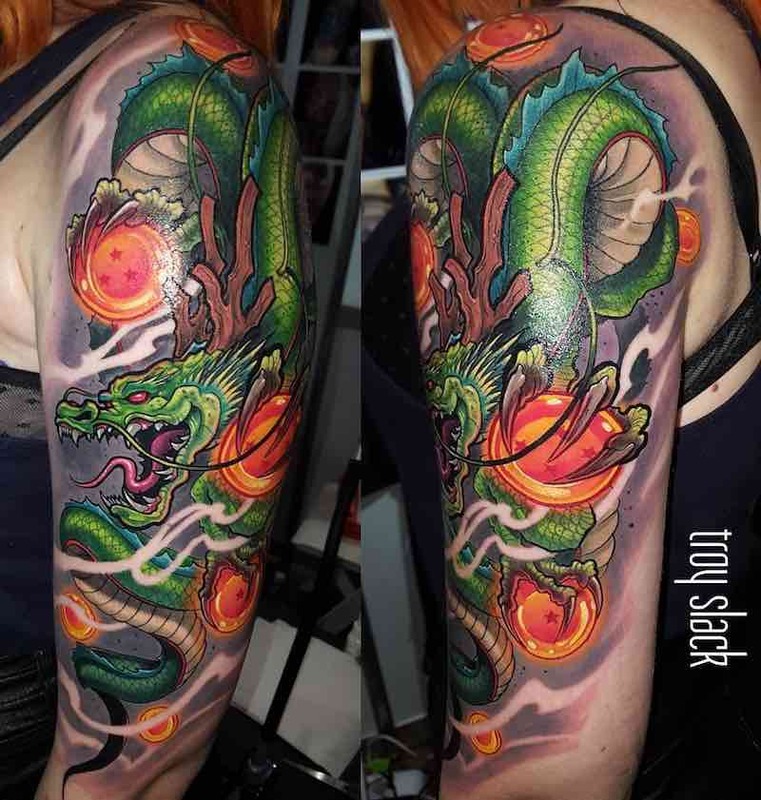 Shenron Tattoos can be some of the best Dragon Ball Z Tattoos because the on-screen and manga imagery translates so well to tattoo imagery where dragons are an iconic tattoo to have. 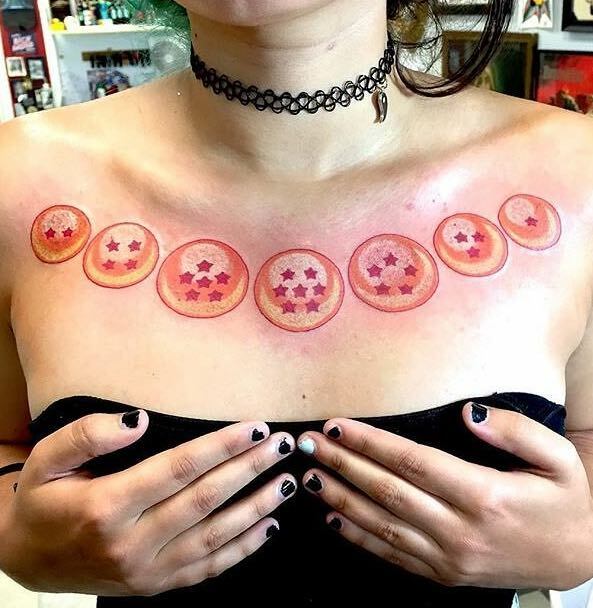 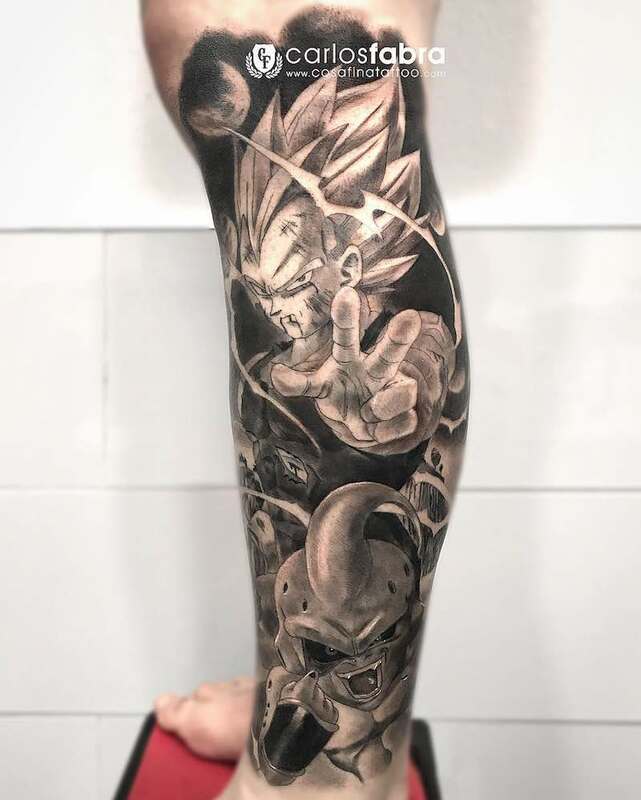 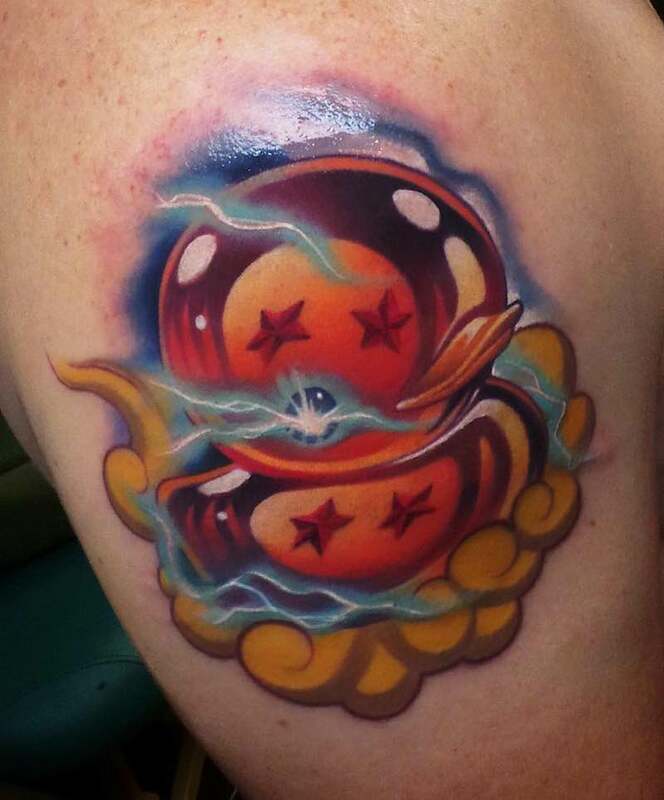 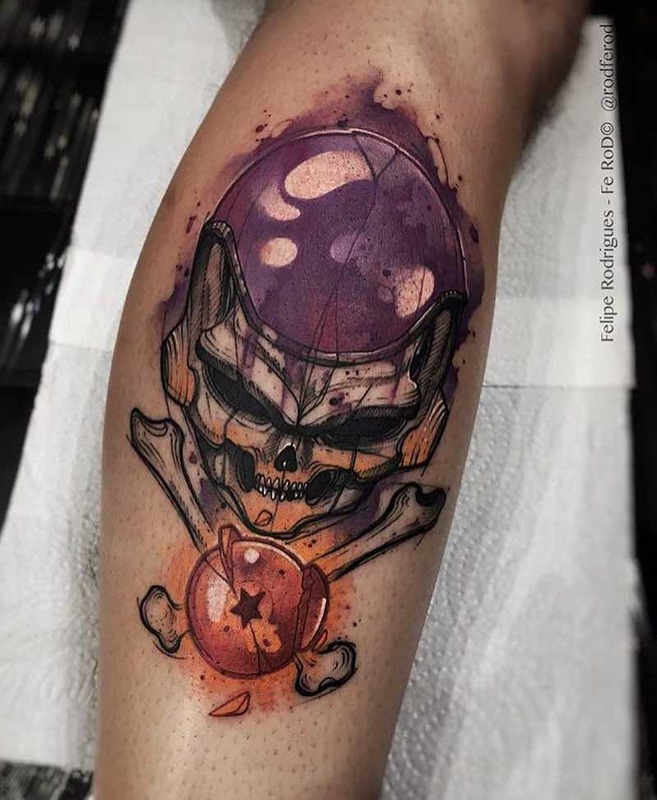 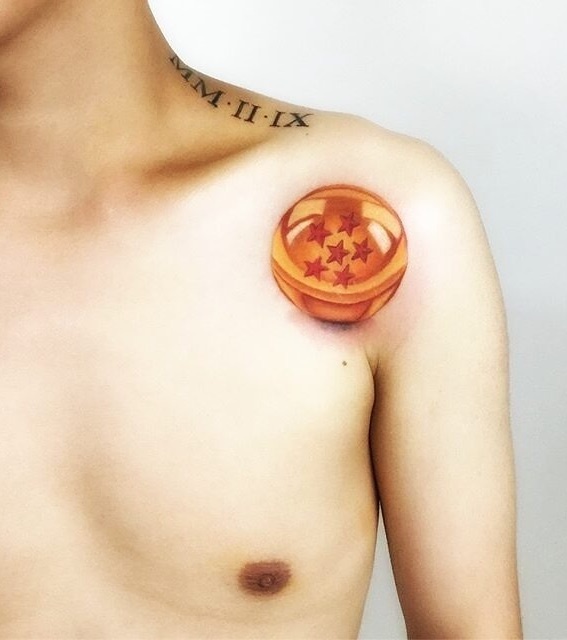 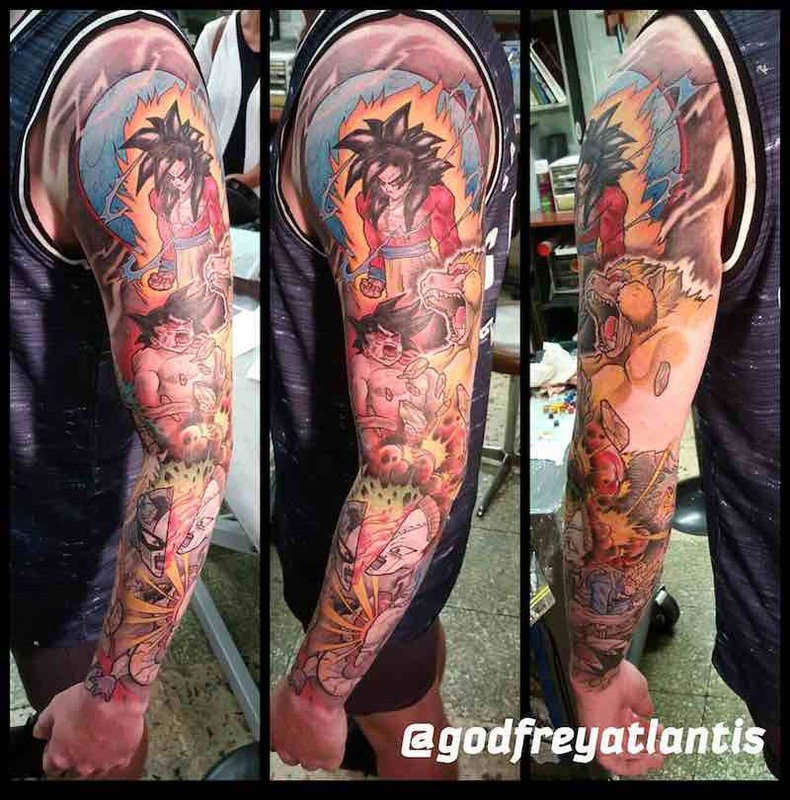 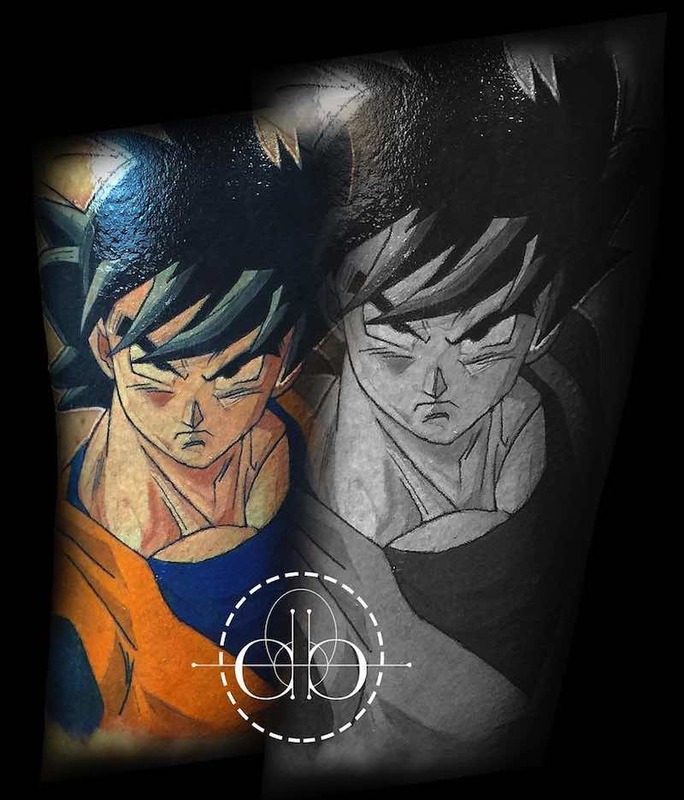 A Dragon Ball Tattoo can be a great choice for those wanting a small Dragon Ball Z tattoo, although it looks great big and bold and even done with all the Dragon Balls together. 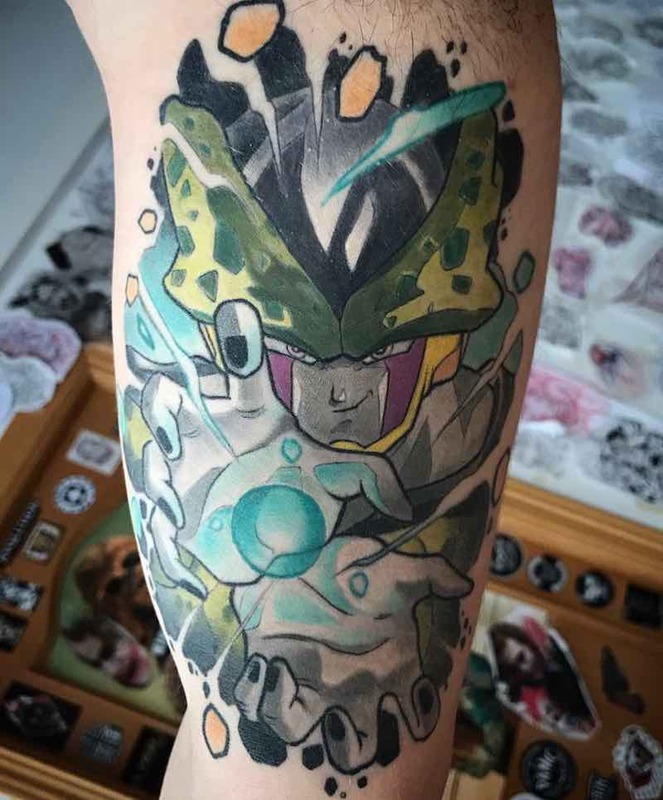 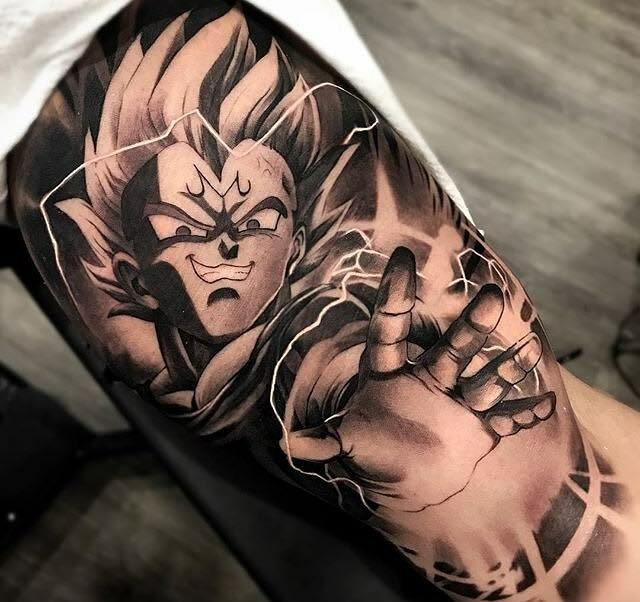 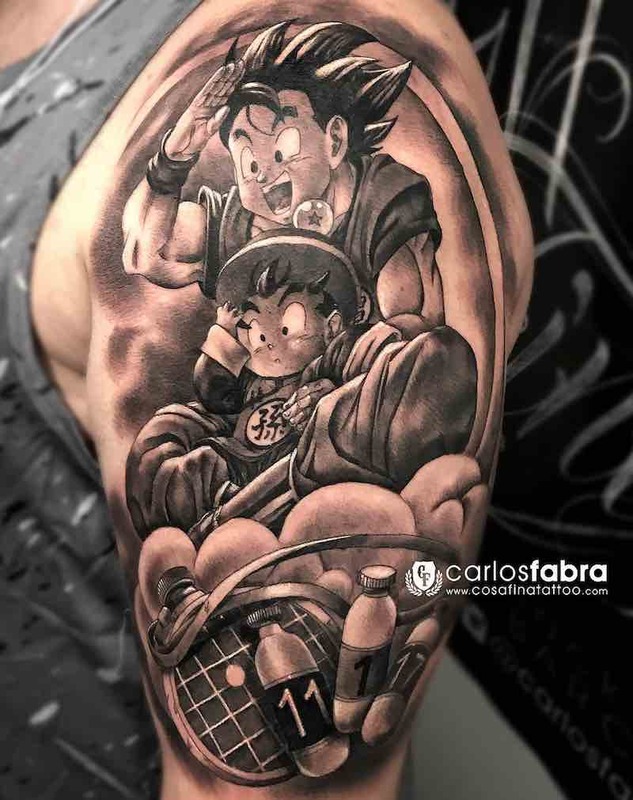 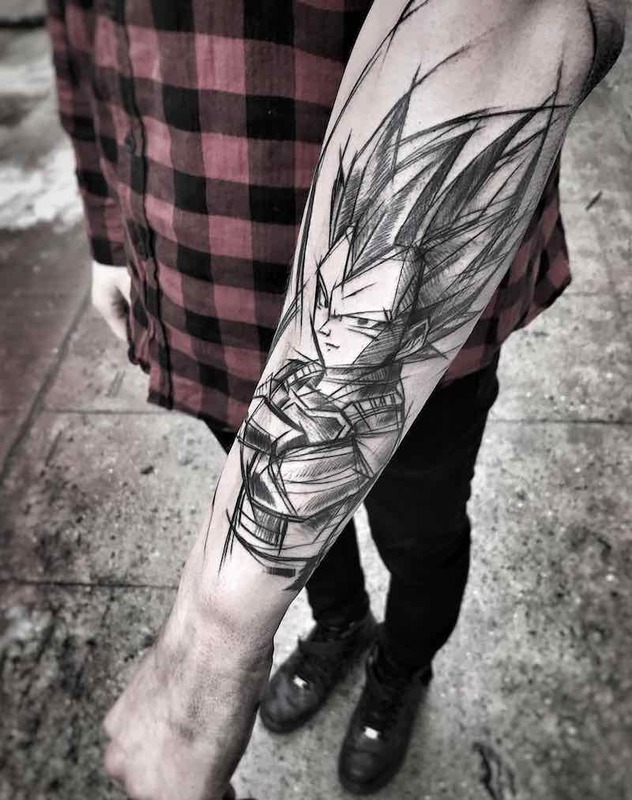 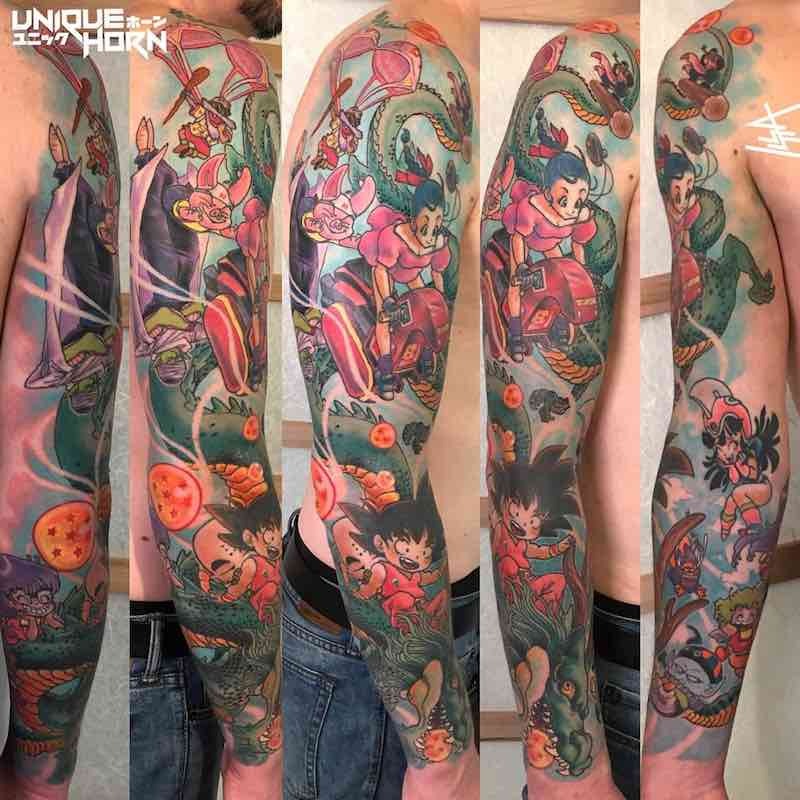 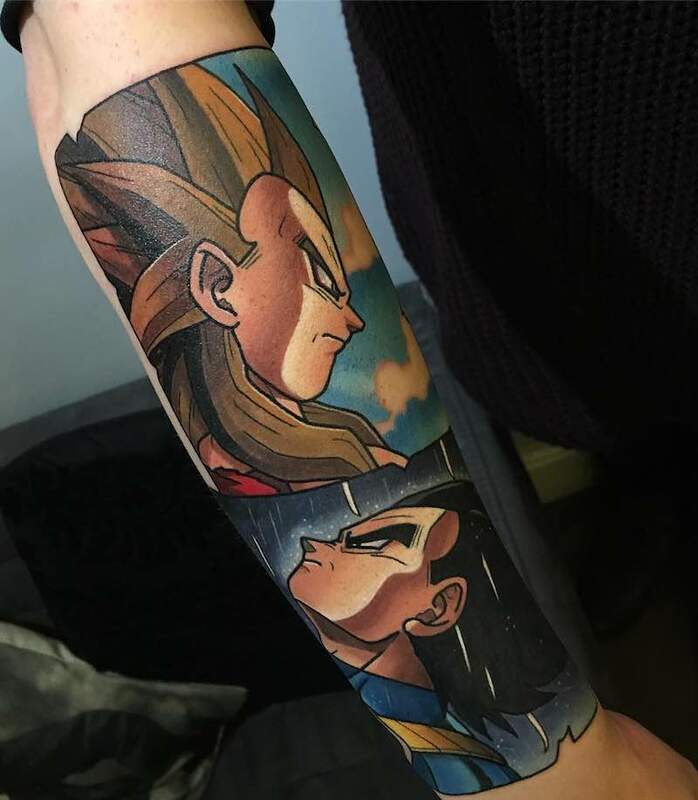 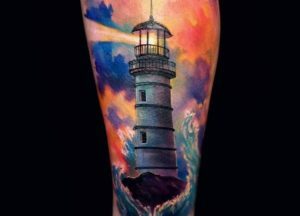 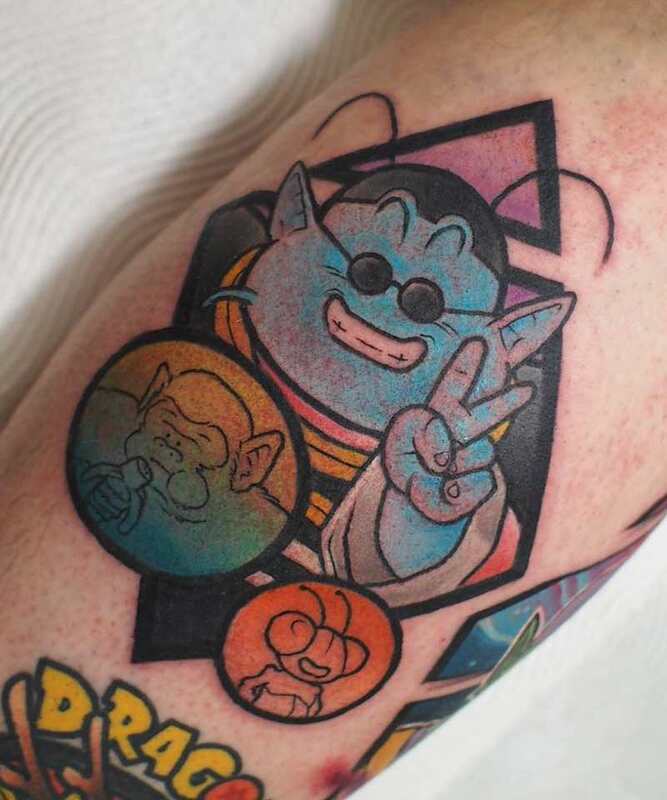 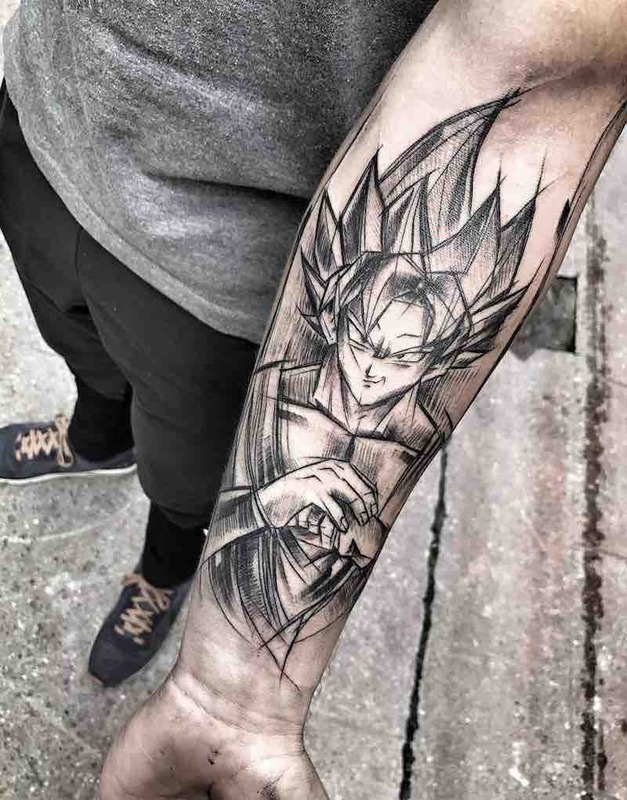 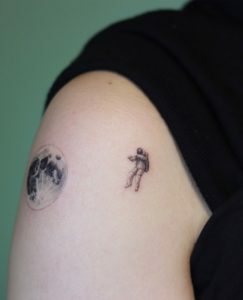 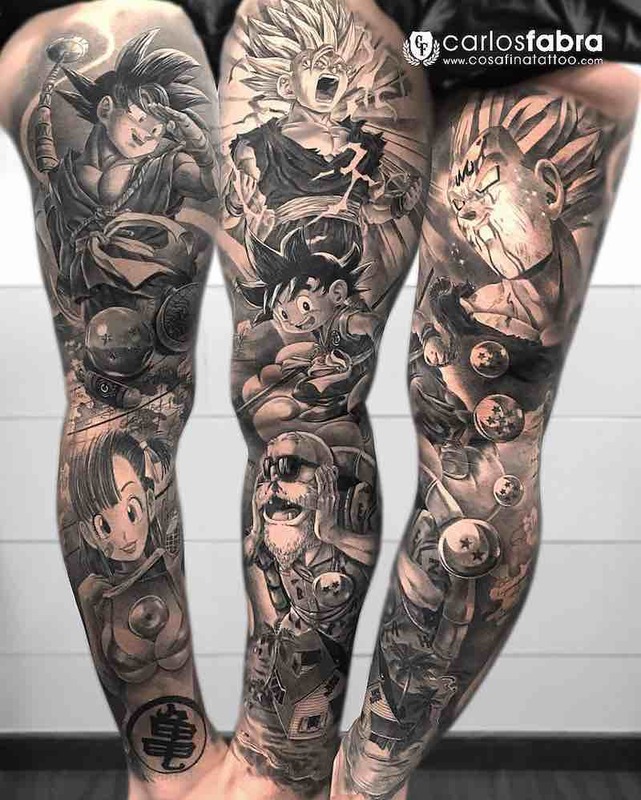 With many people not wanting to choose a single character are instead opting for a selection of their favorite characters or even a scene as a Dragon Ball Z tattoo sleeve. 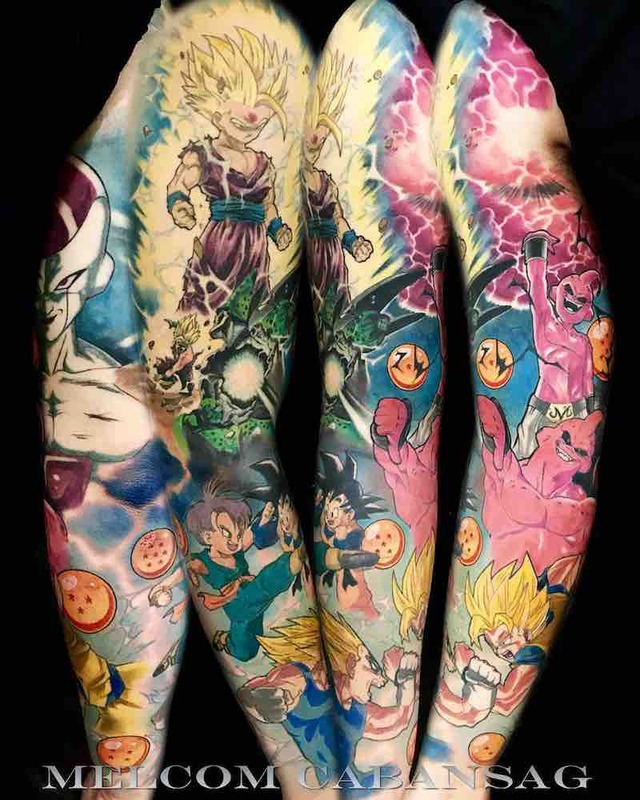 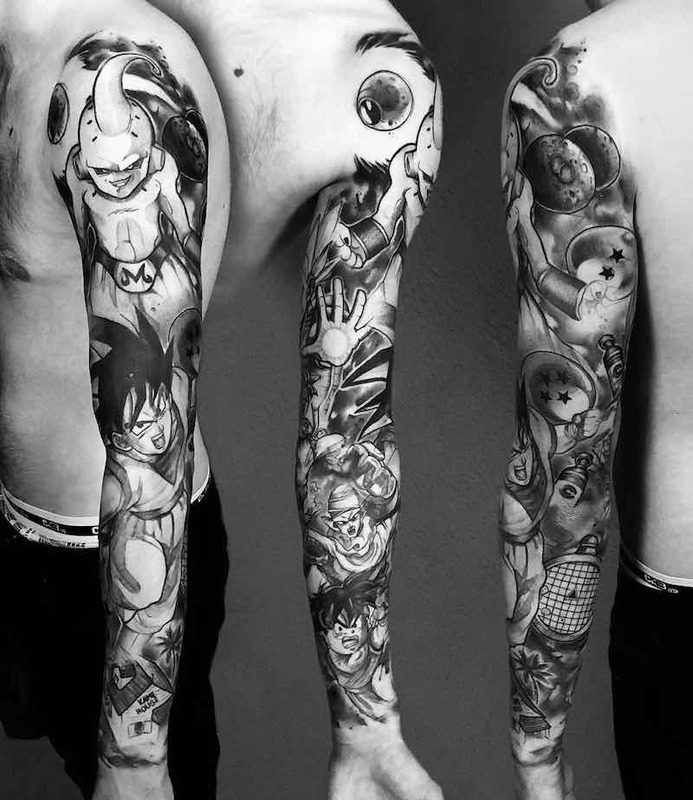 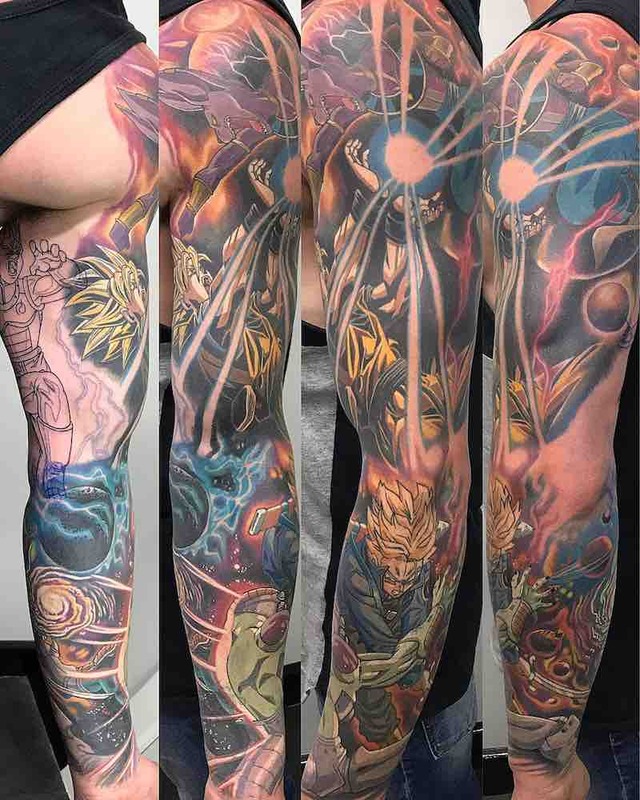 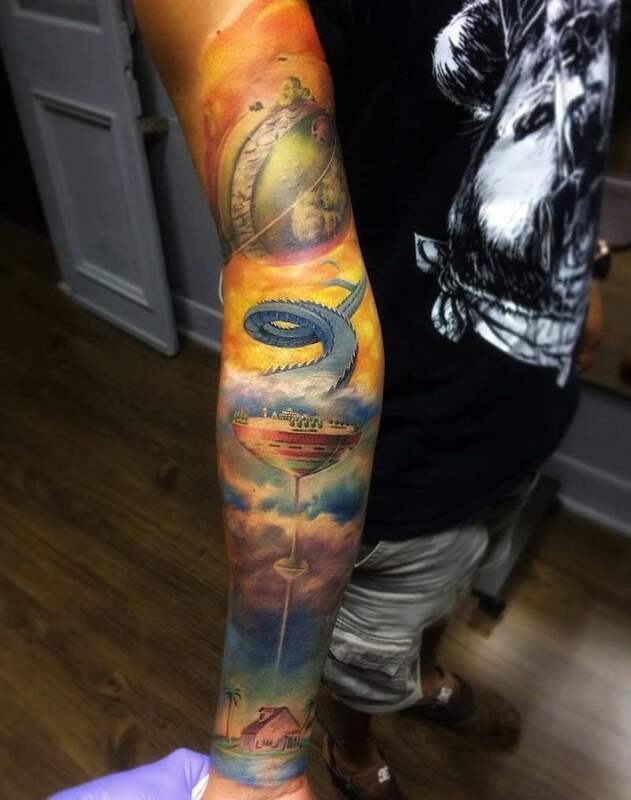 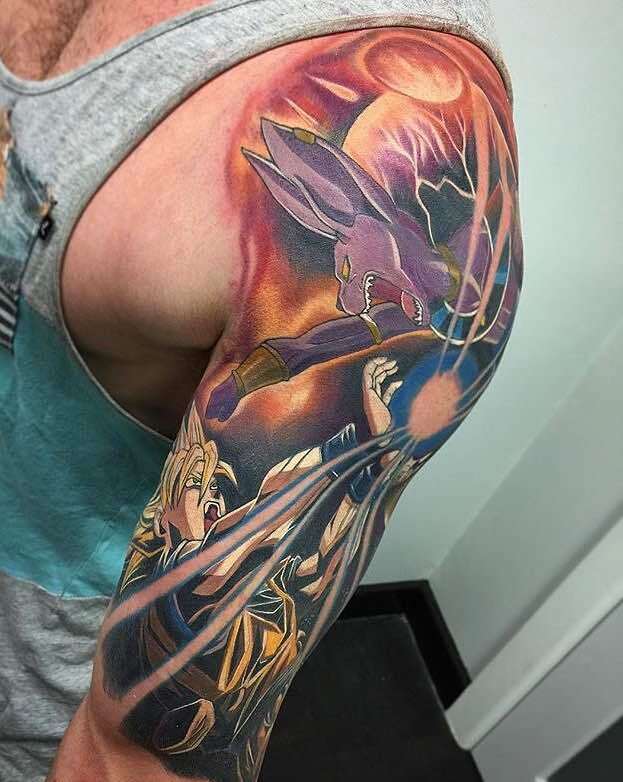 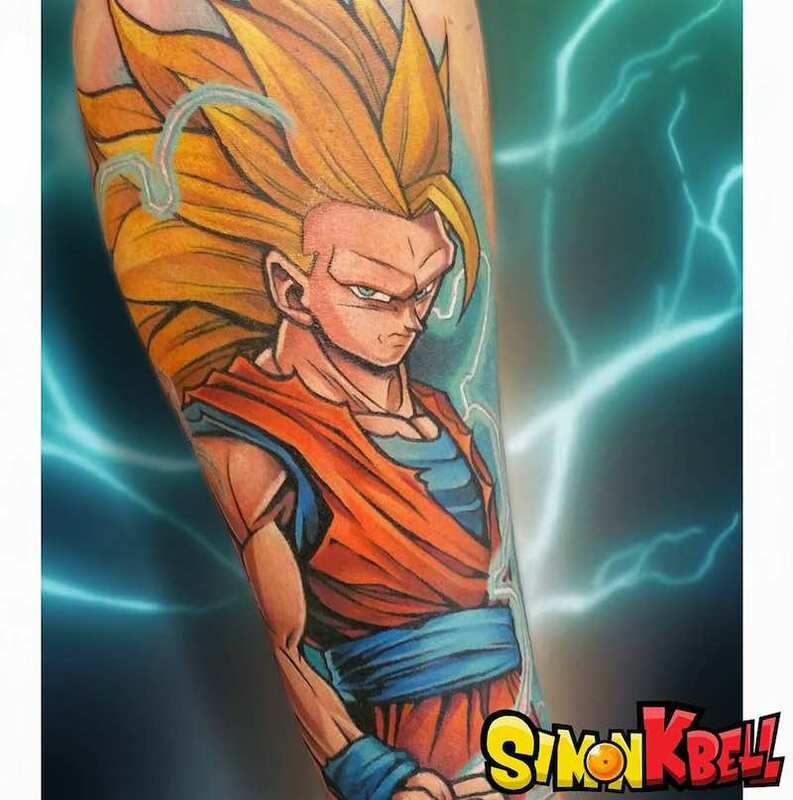 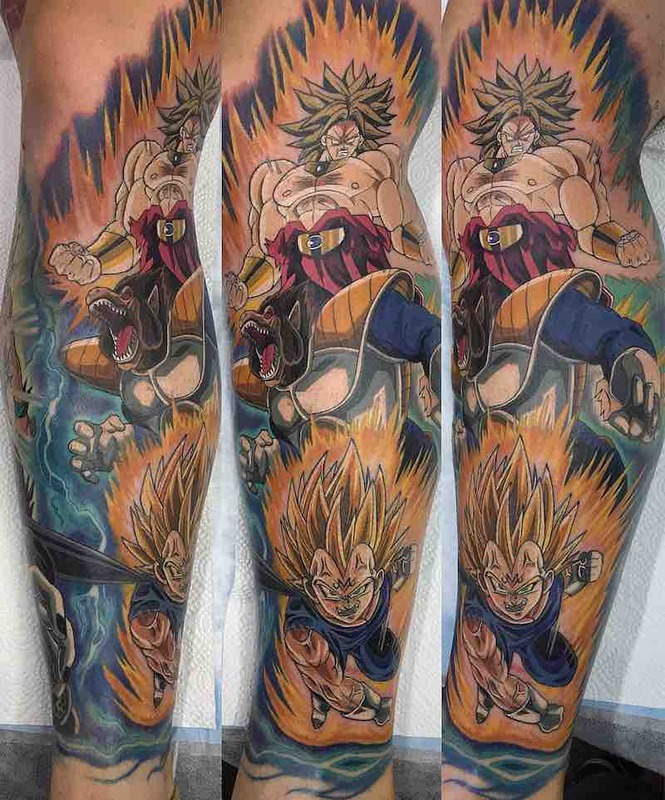 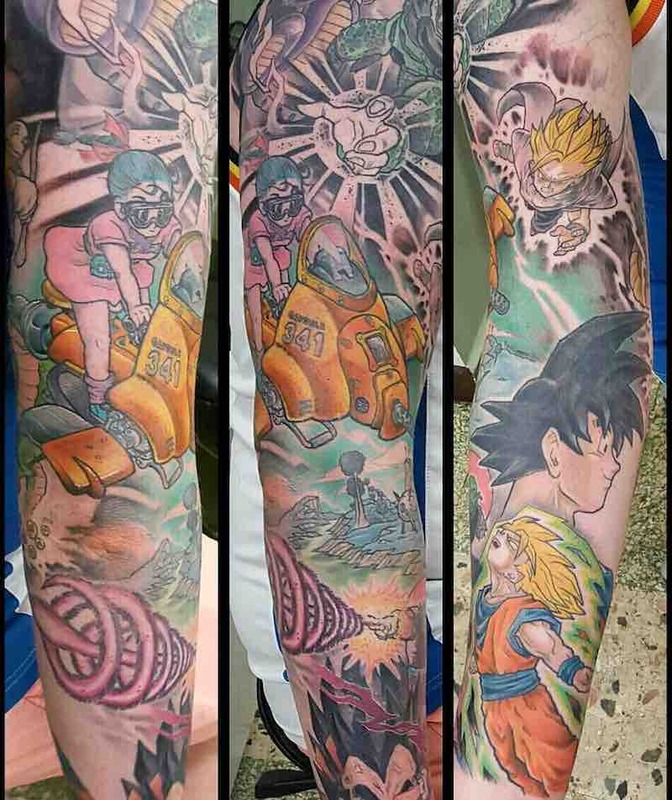 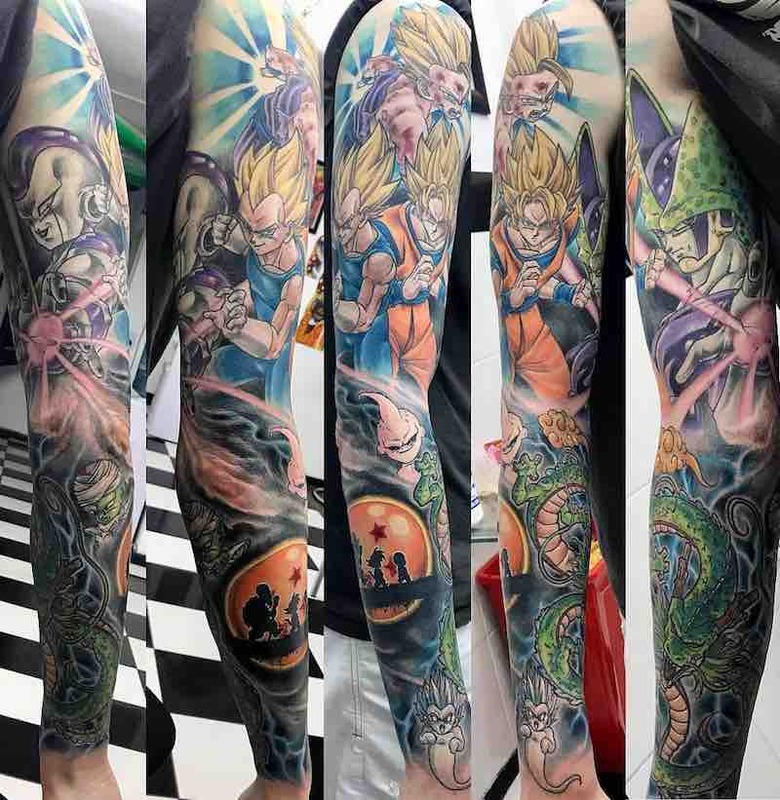 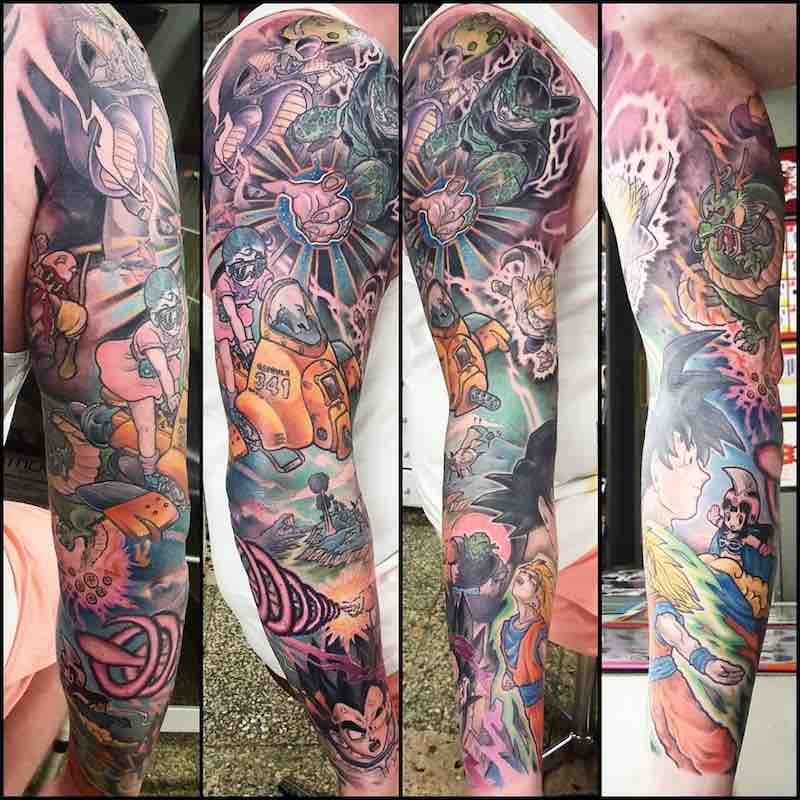 Below is some the very best Dragon Ball Z Tattoo Sleeves.